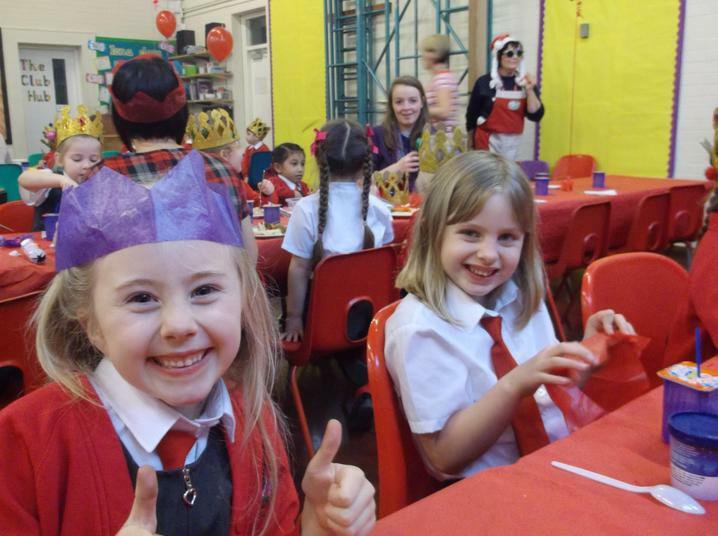 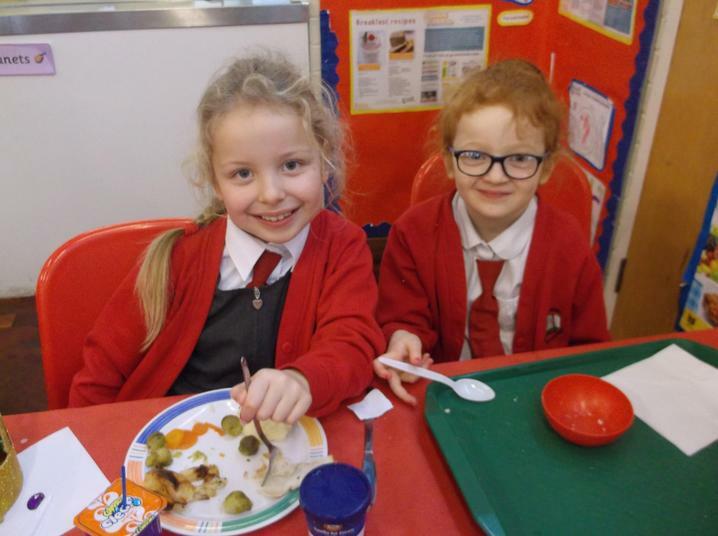 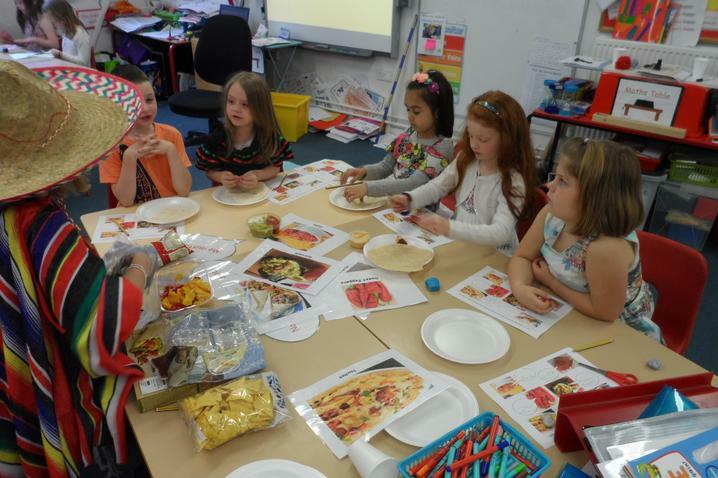 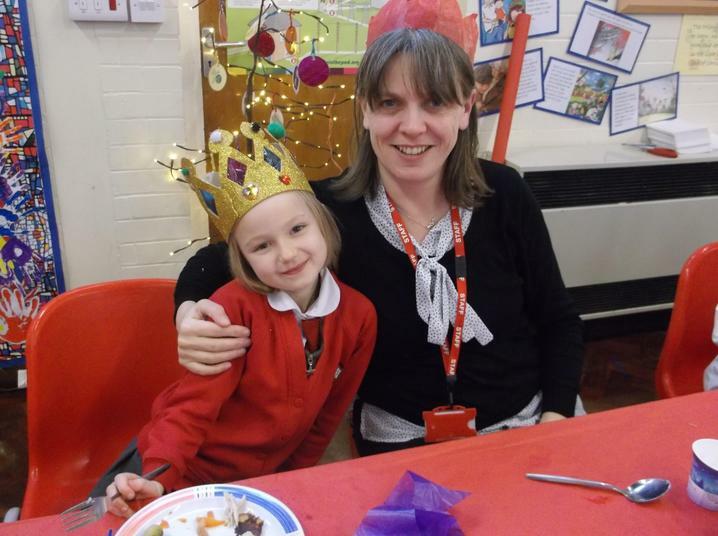 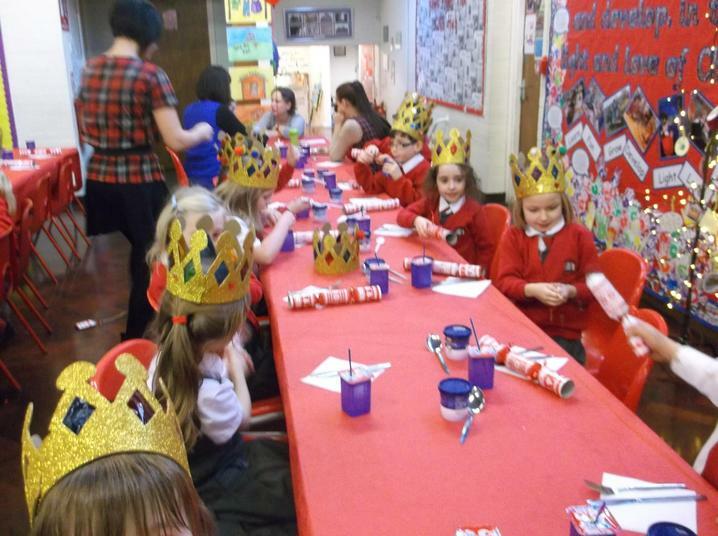 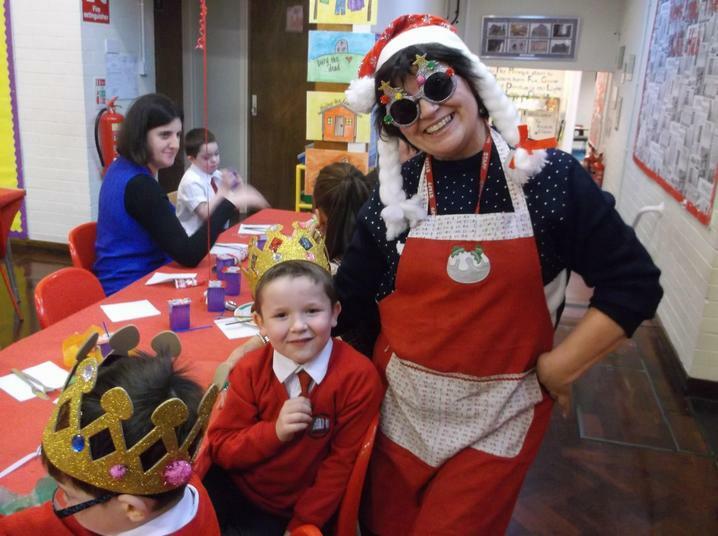 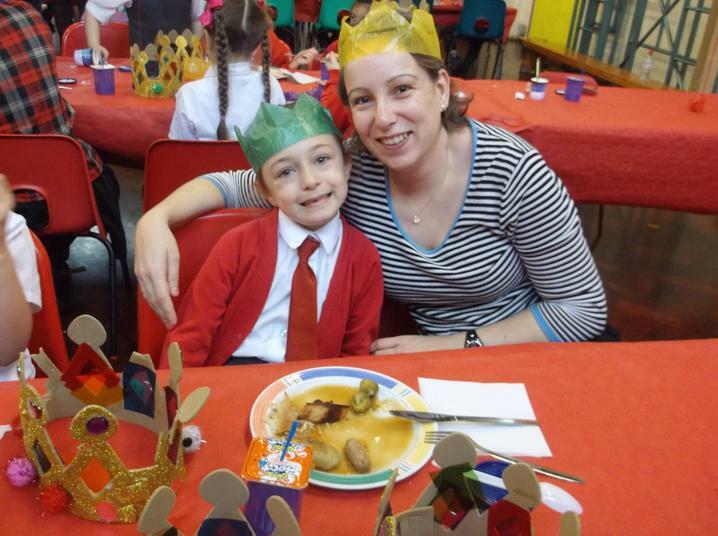 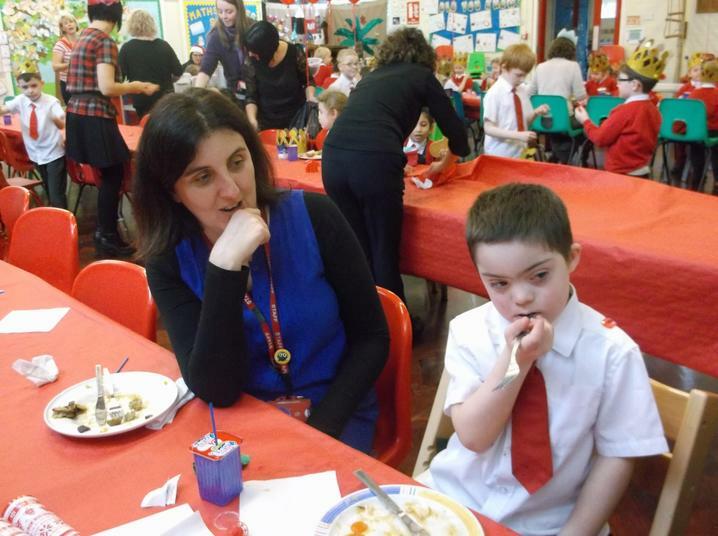 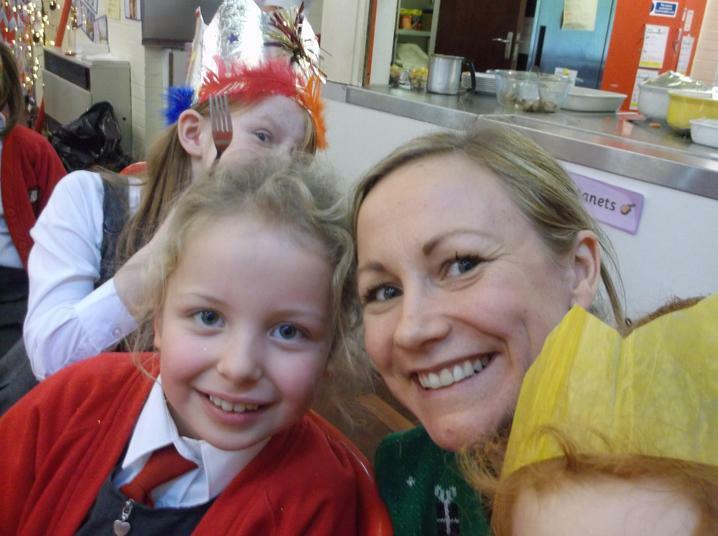 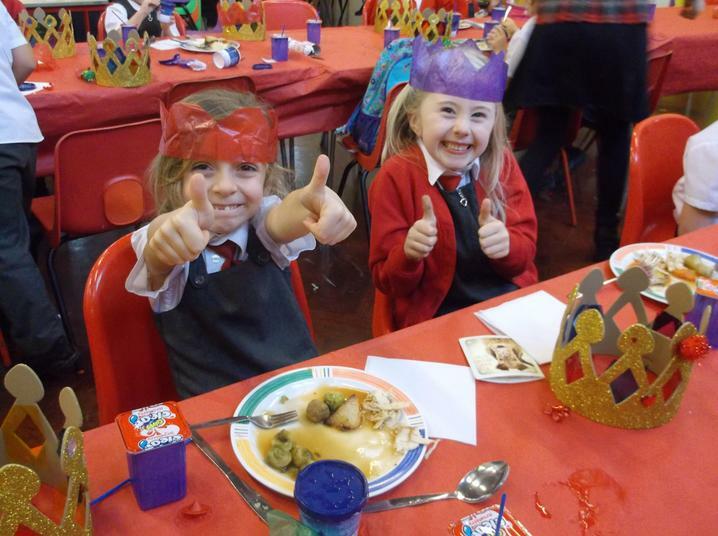 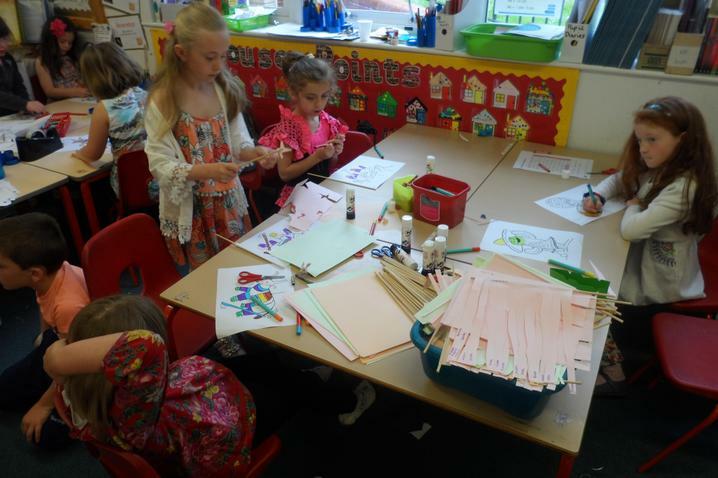 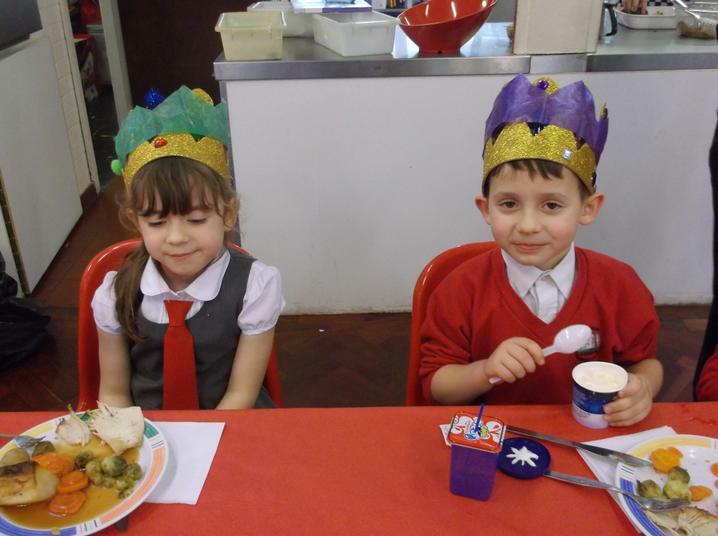 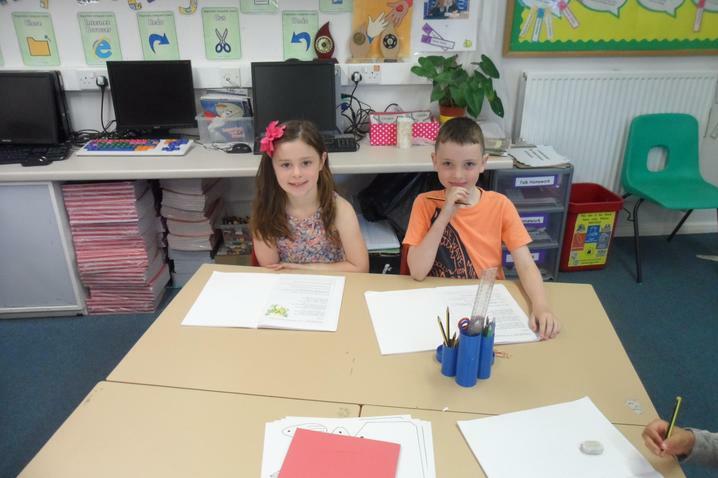 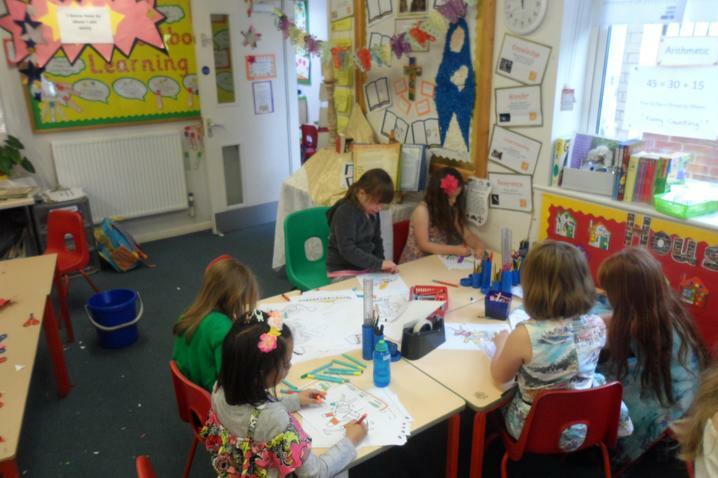 Mrs Roberts and Miss Pike are our teachers. 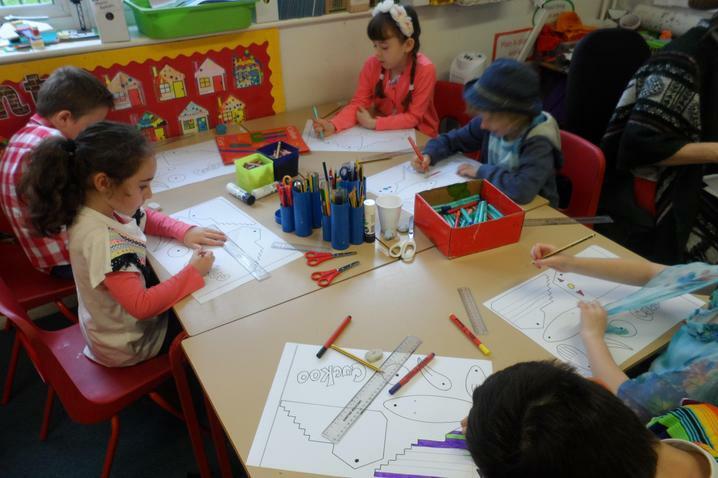 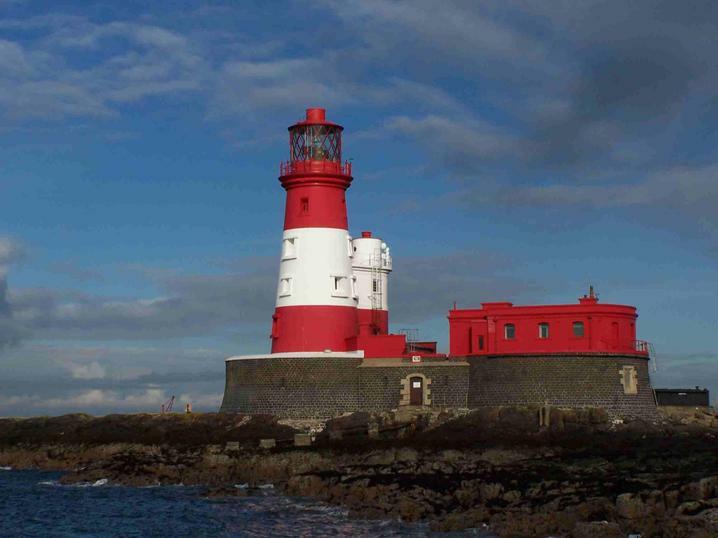 What is it like to be a lighthouse keeper? 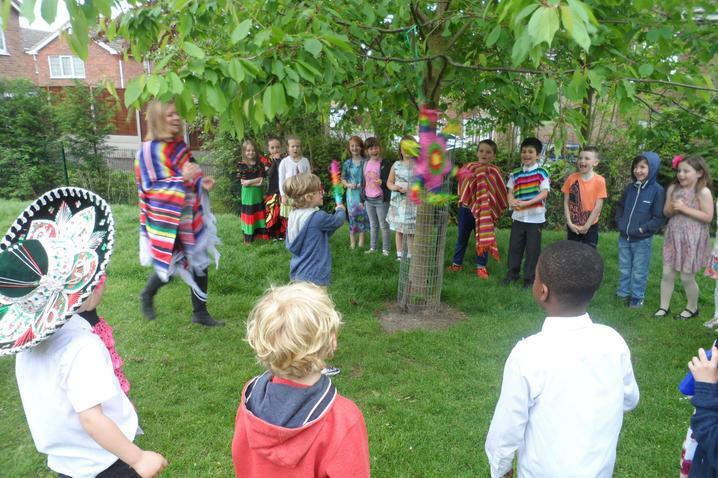 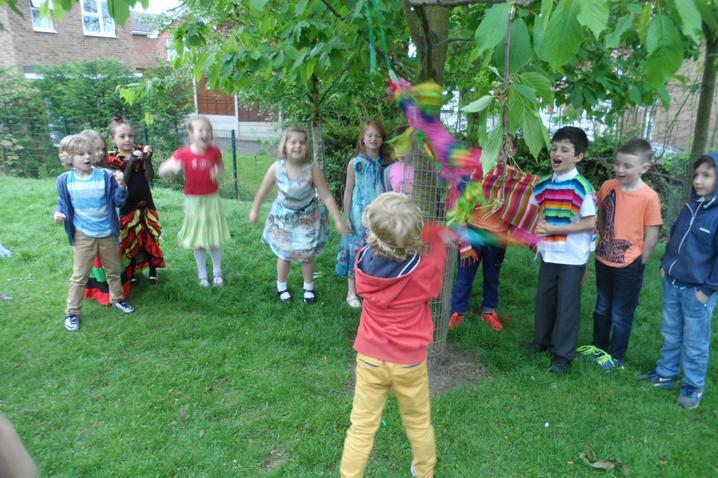 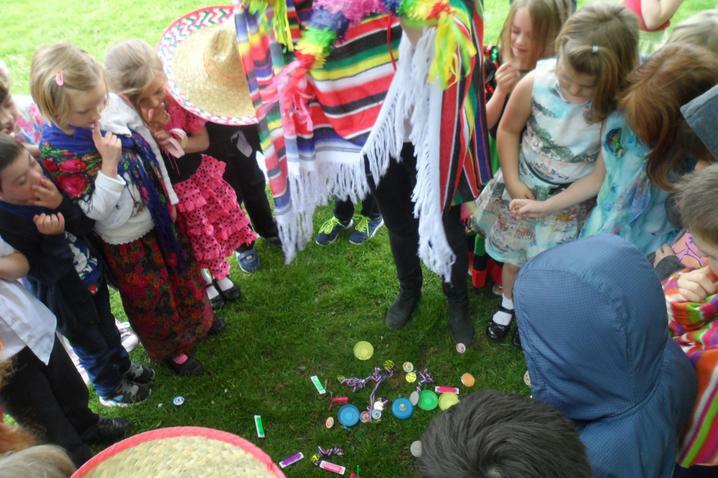 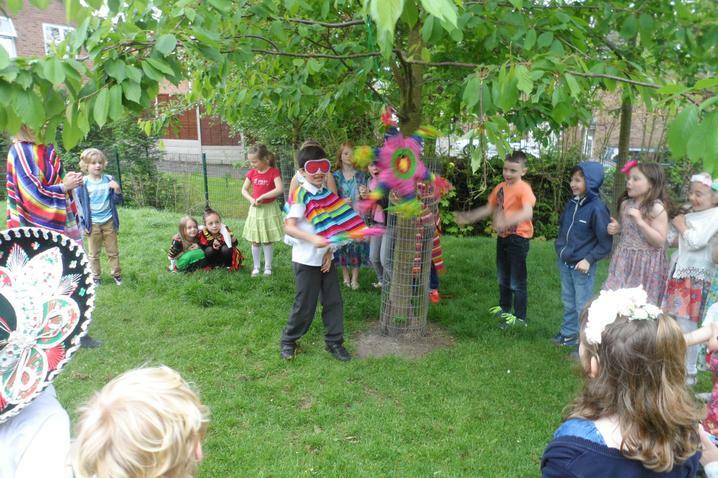 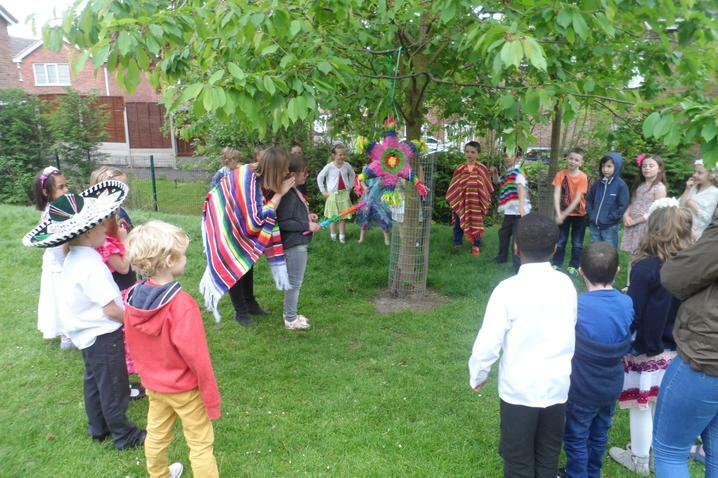 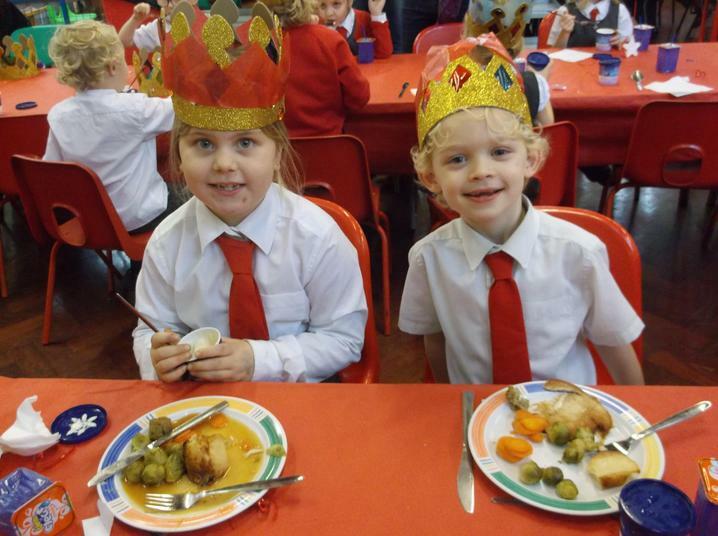 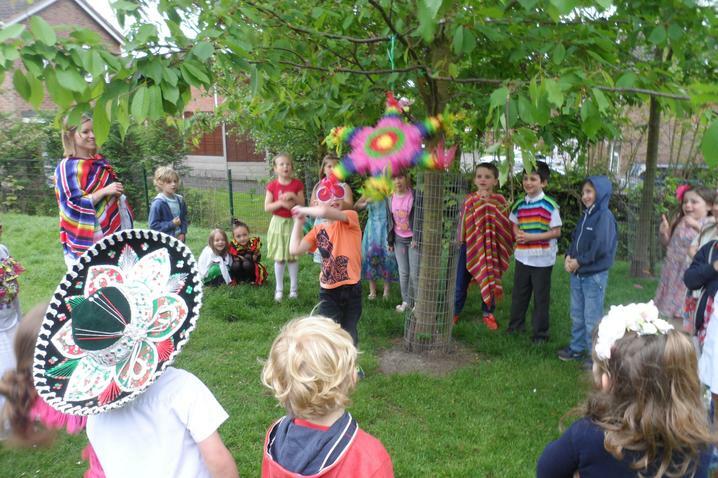 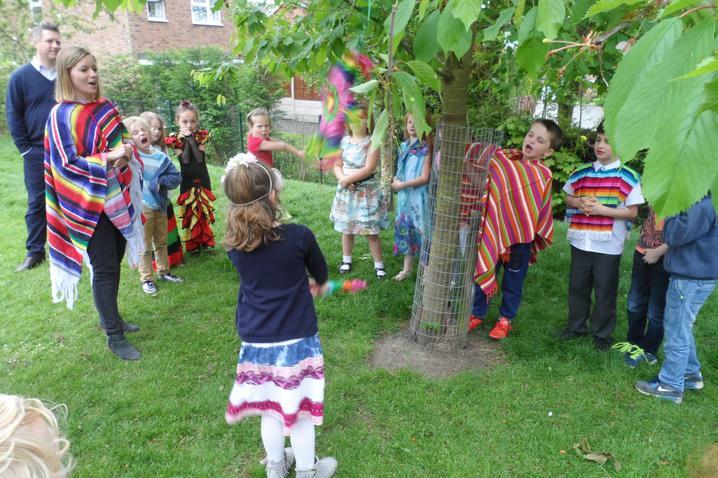 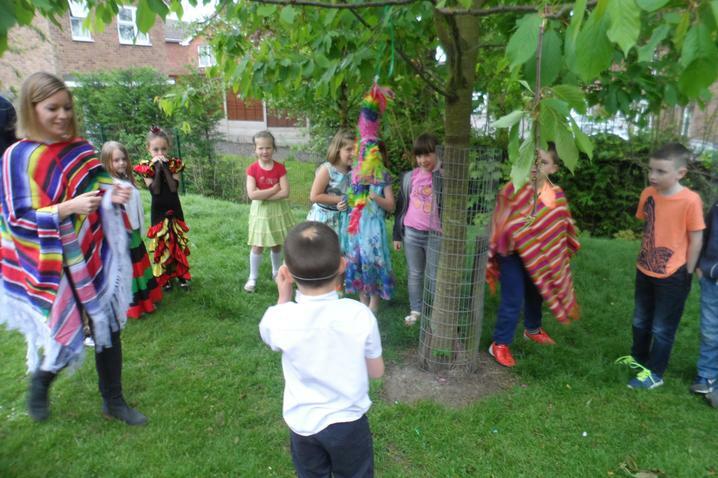 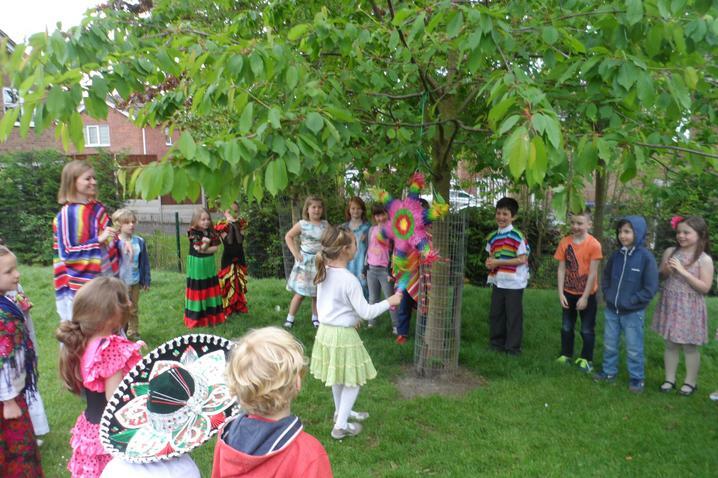 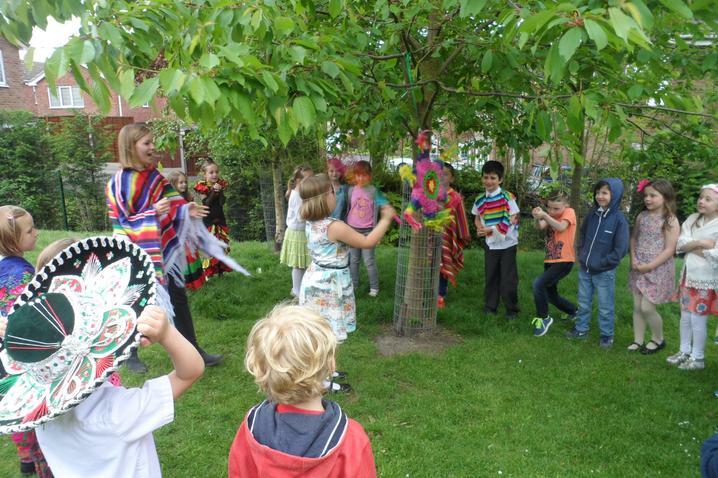 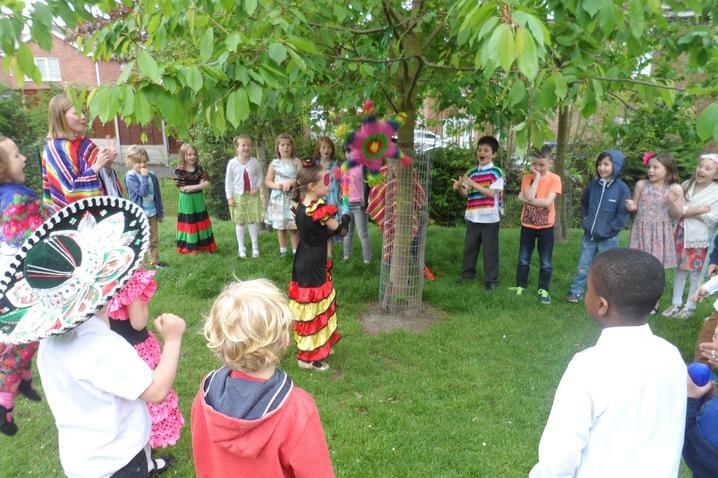 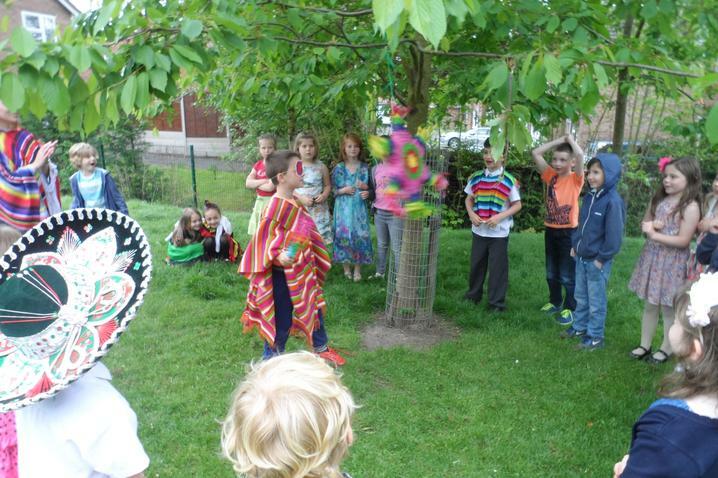 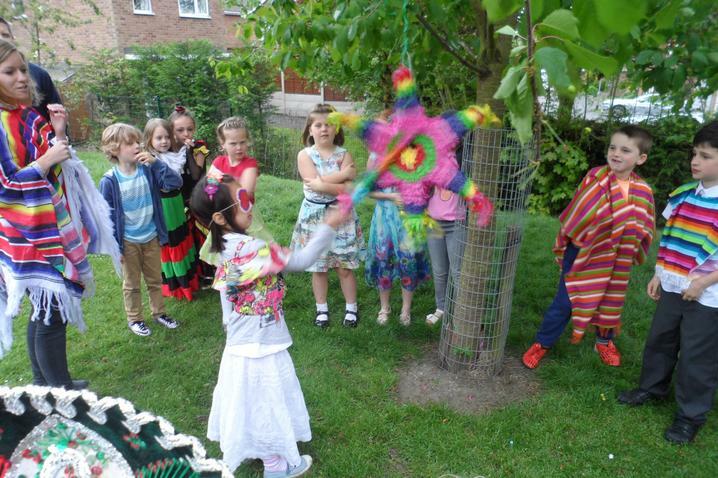 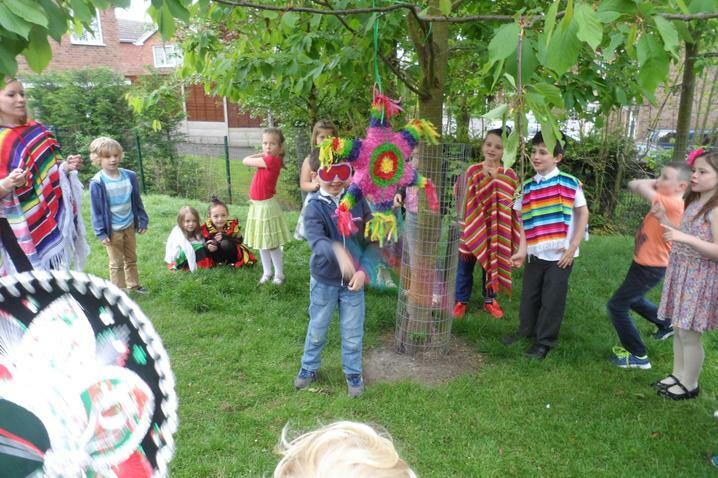 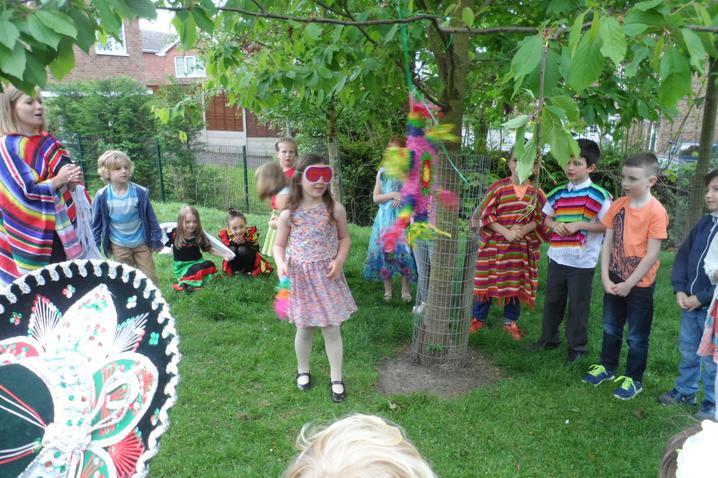 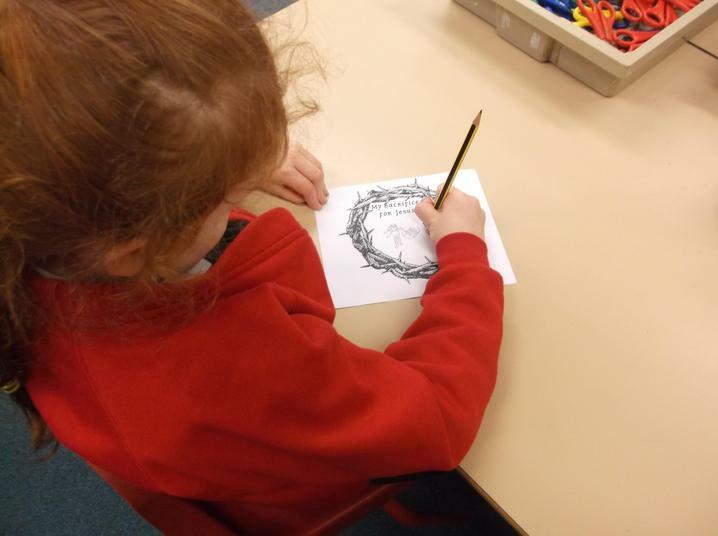 Who is Mr Grinling and what adventures does he have? 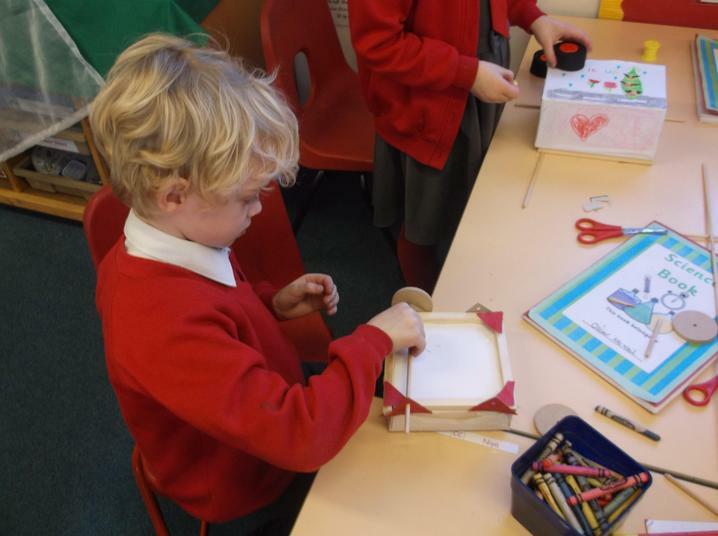 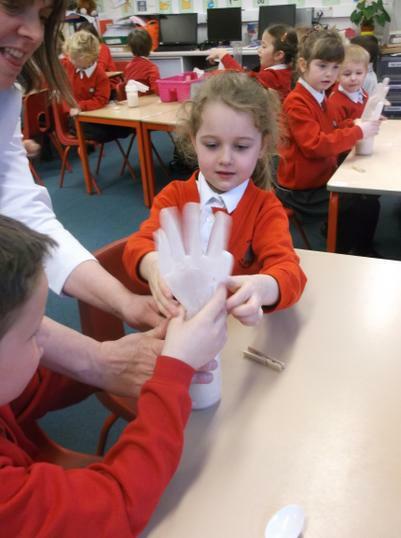 Can we design a safety jacket for a lighthouse keeper? 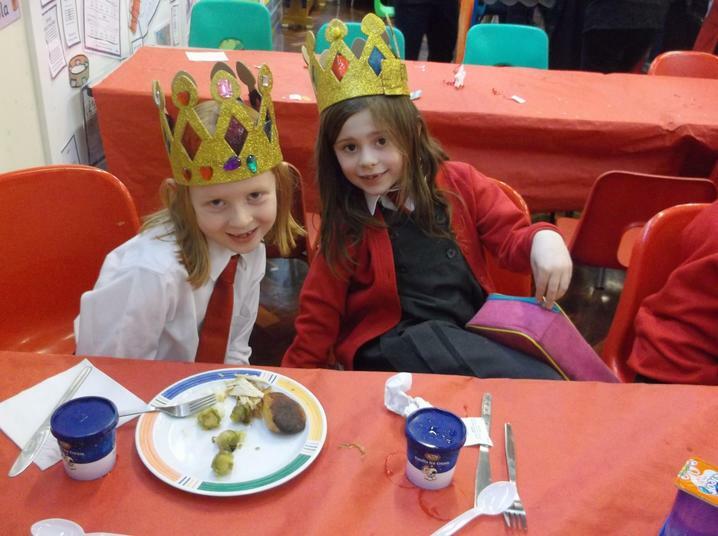 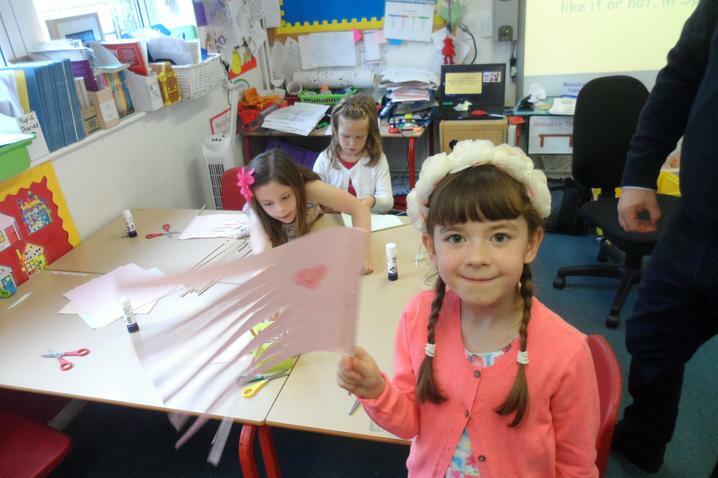 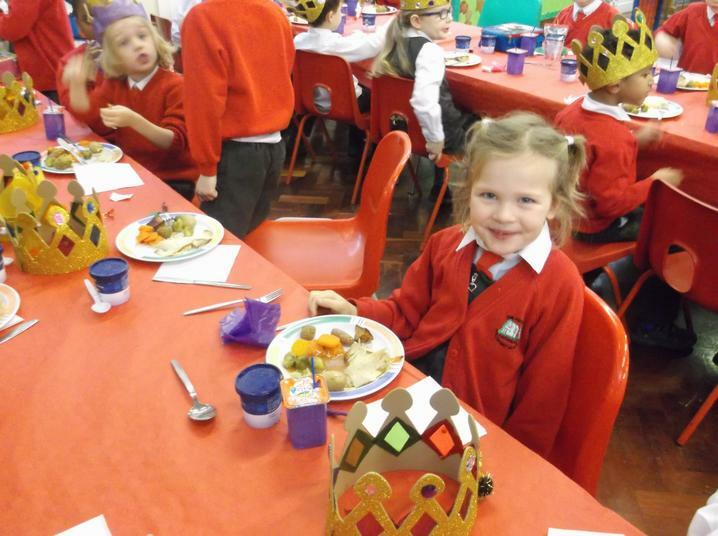 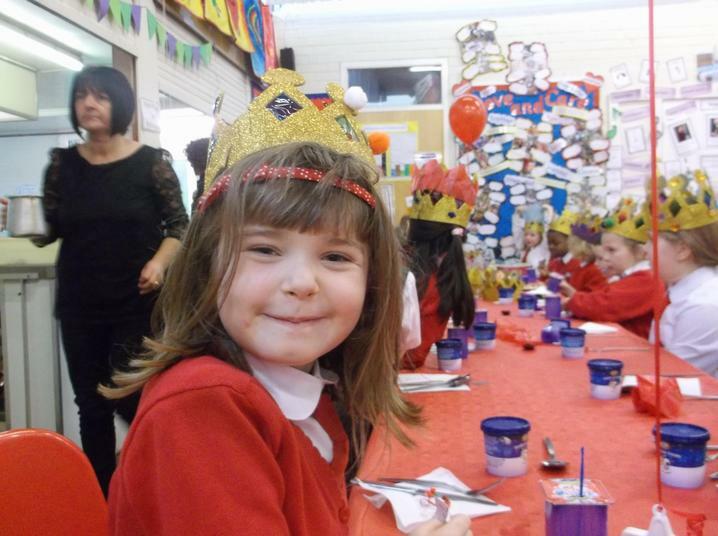 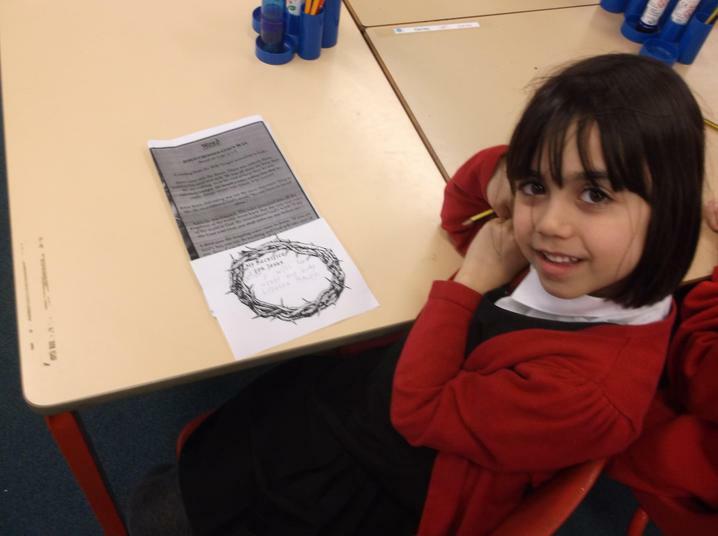 Who was Grace Darling and why was she famous? 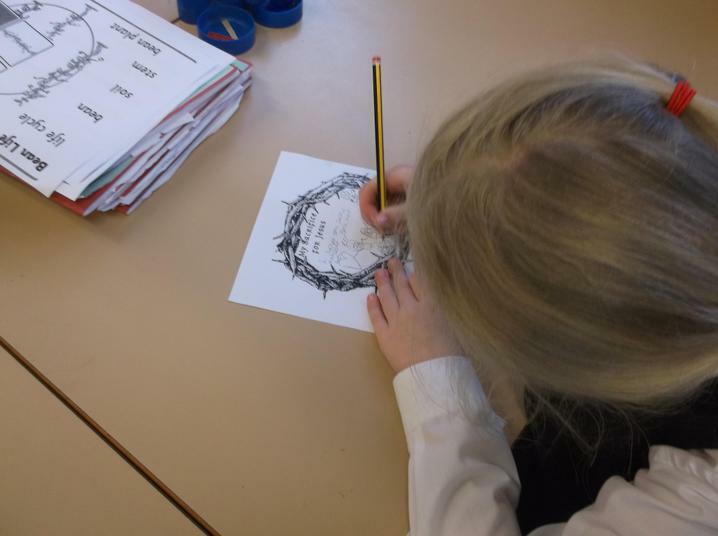 What do we find in seaside habitats? 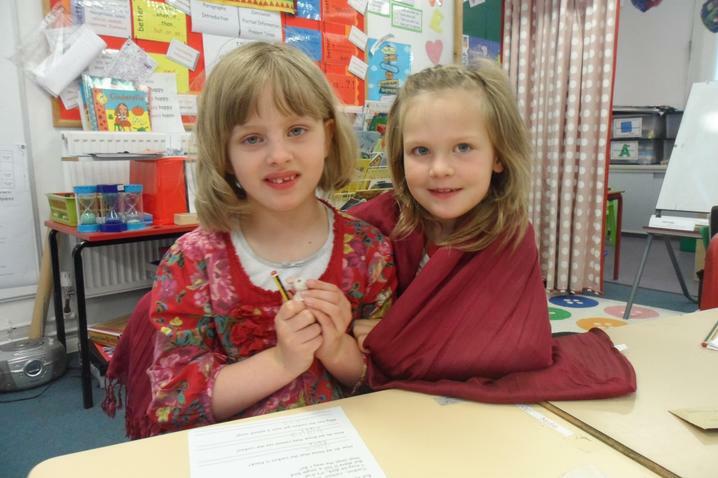 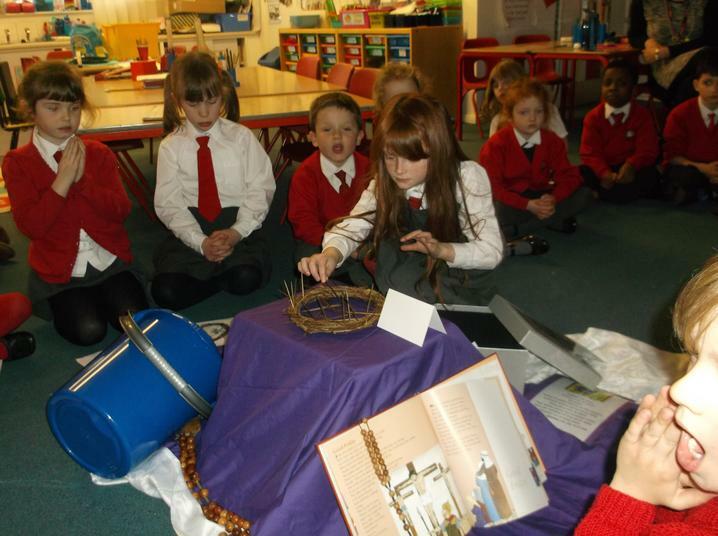 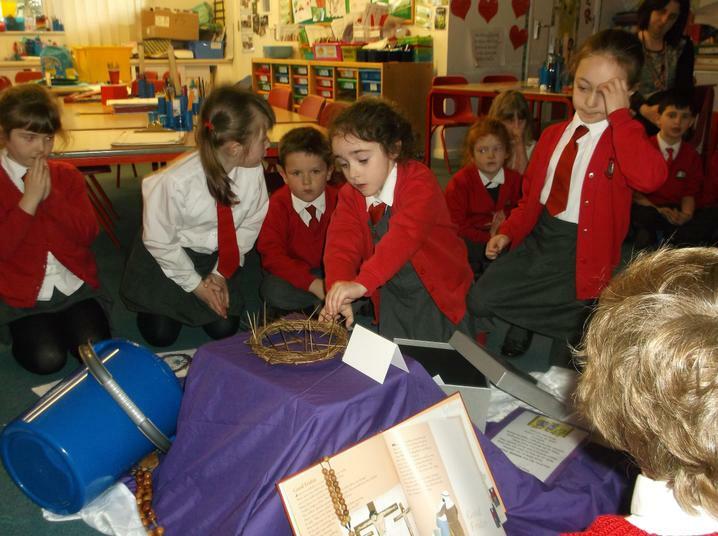 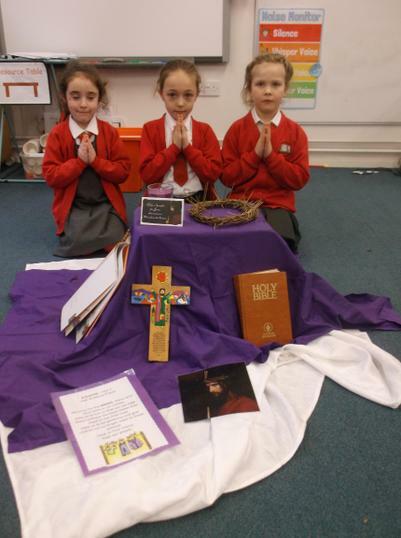 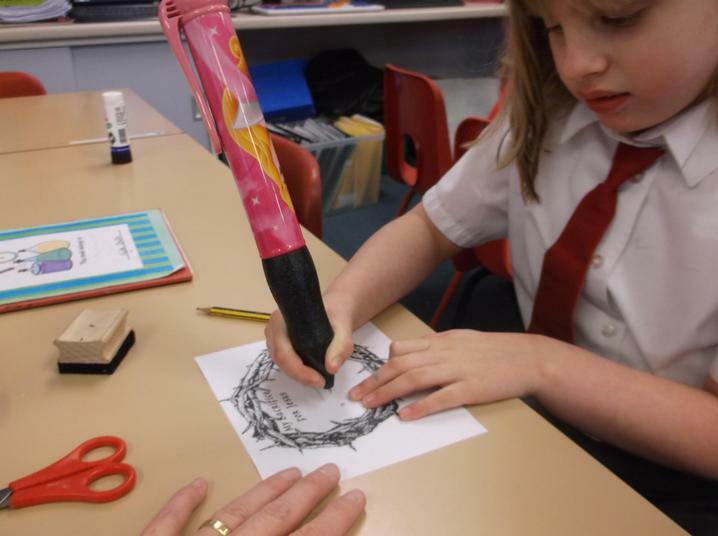 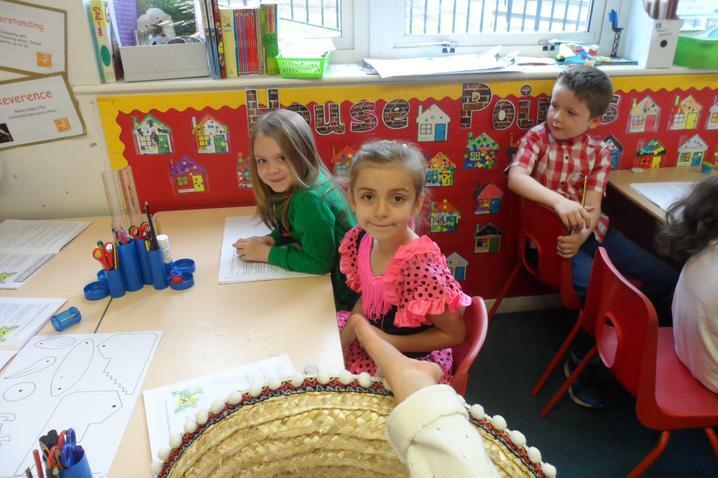 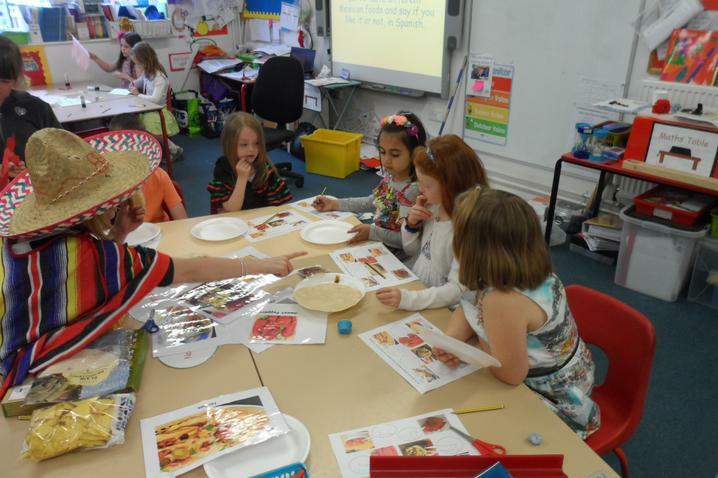 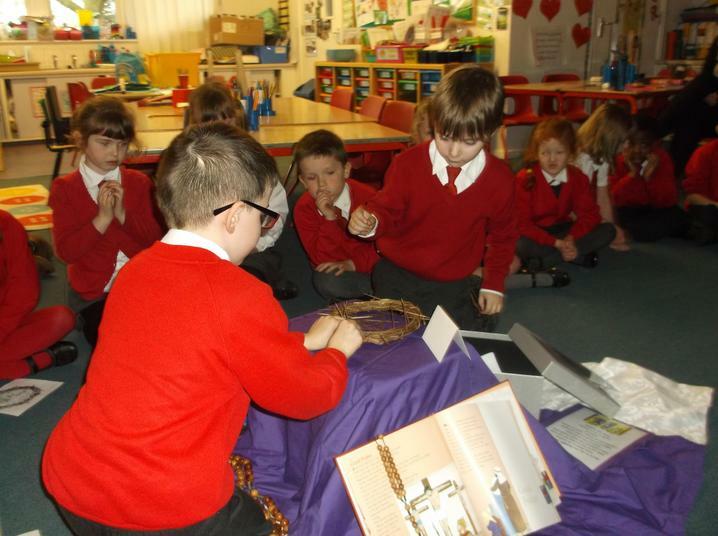 We are learning about other Faiths. 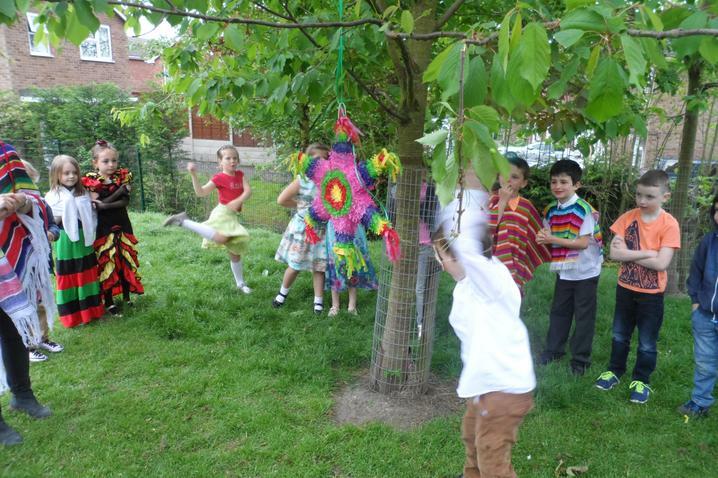 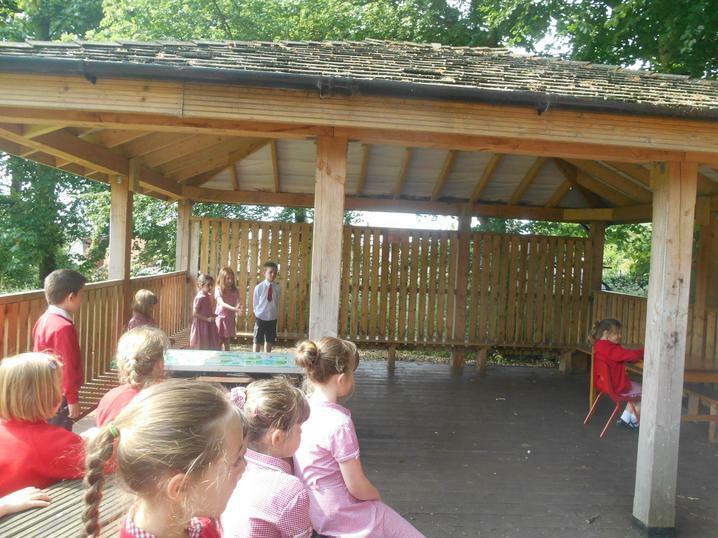 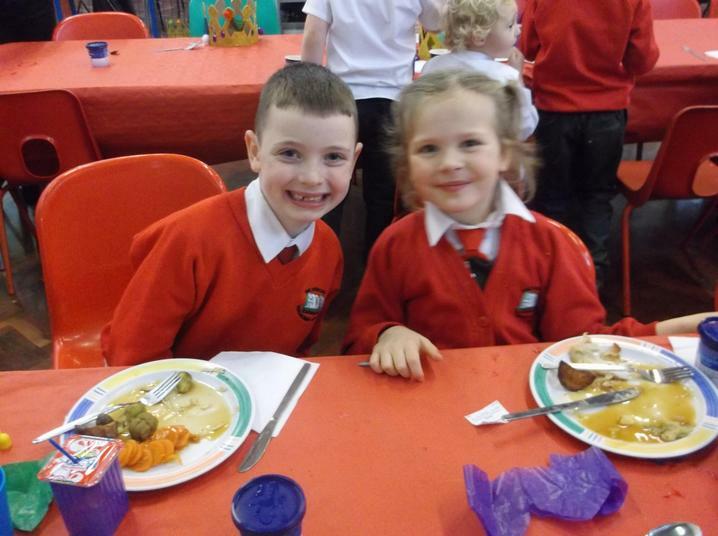 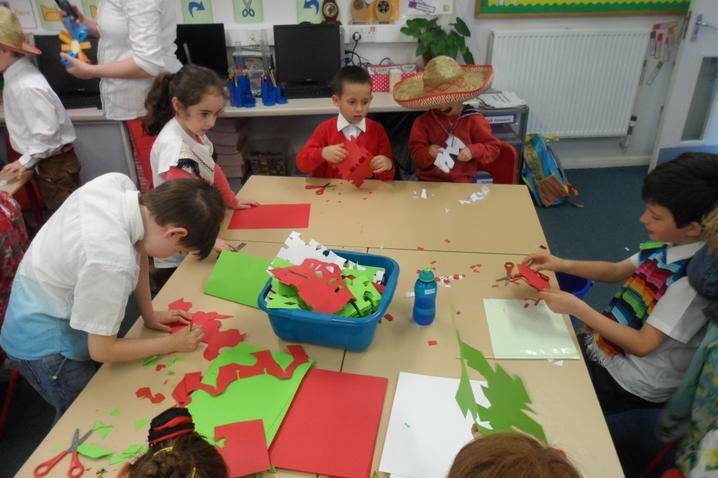 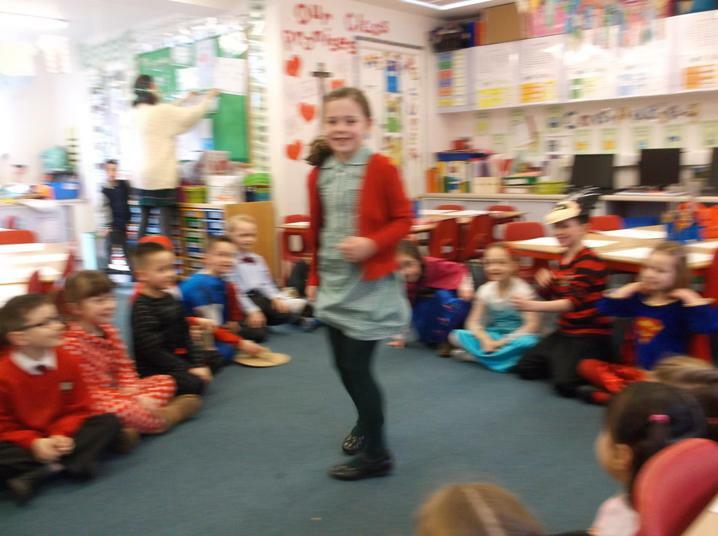 A visit from the RSPB and a wonderful nature hunt around school!  Check out their website. 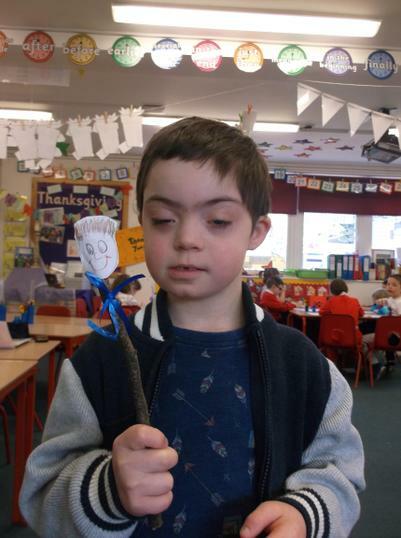 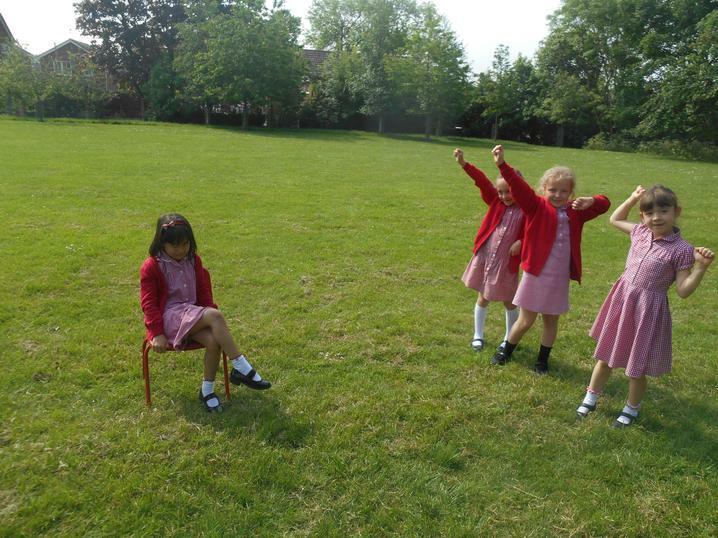 Acting out the story of the lonely lighthouse keepr. 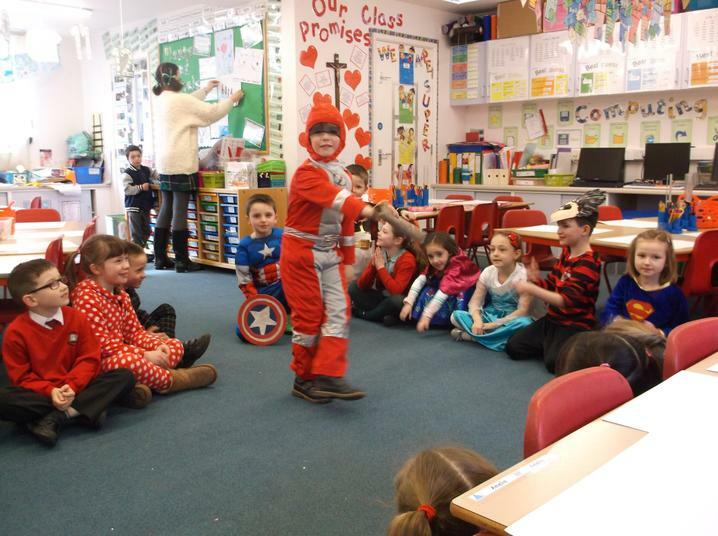 The Lonely Lighthouse Keeper How does help arrive? 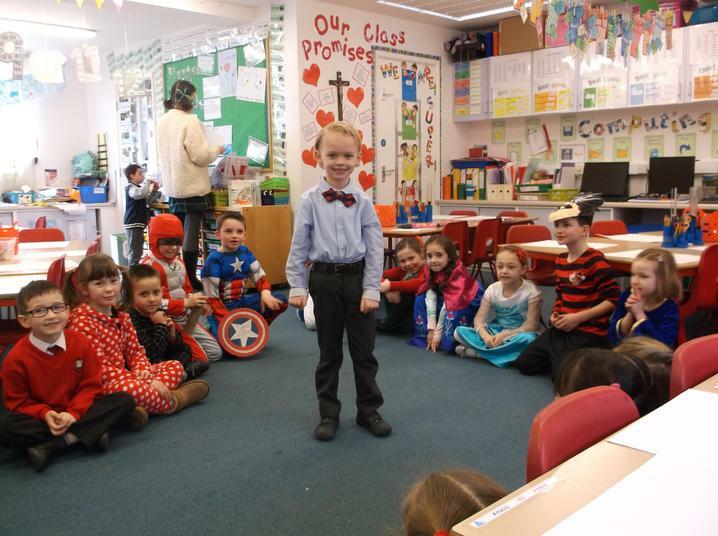 How does he change? 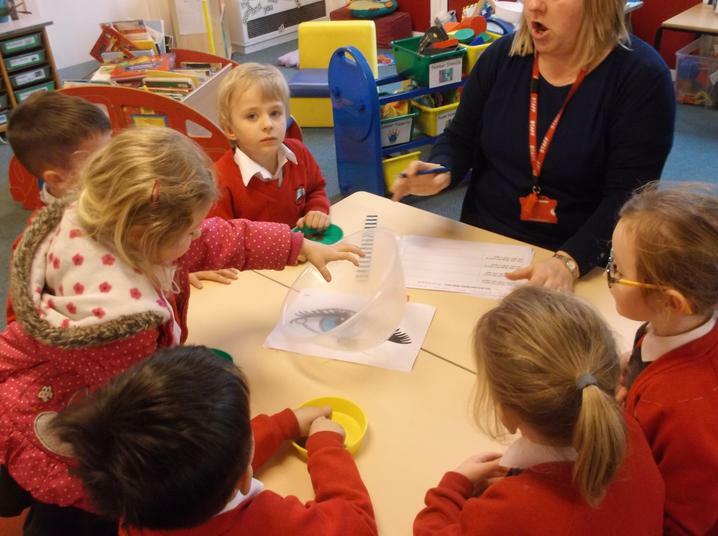 What can you find in a rockpool? 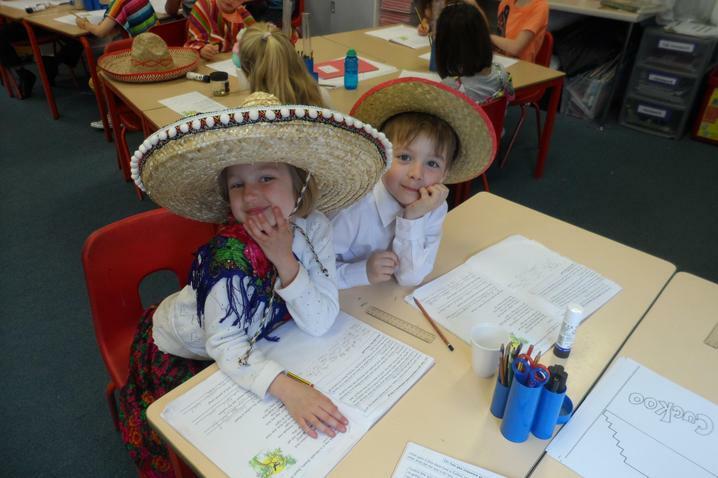 What can you find out about Tocuaro? 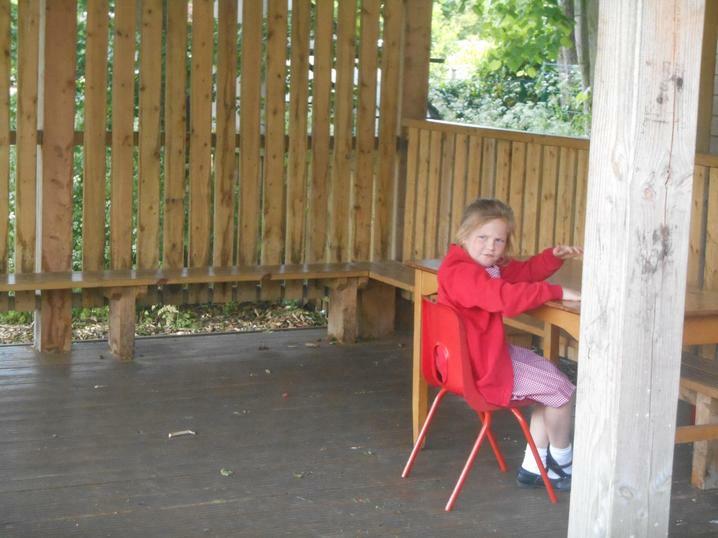 How is this place different to Eastwood? 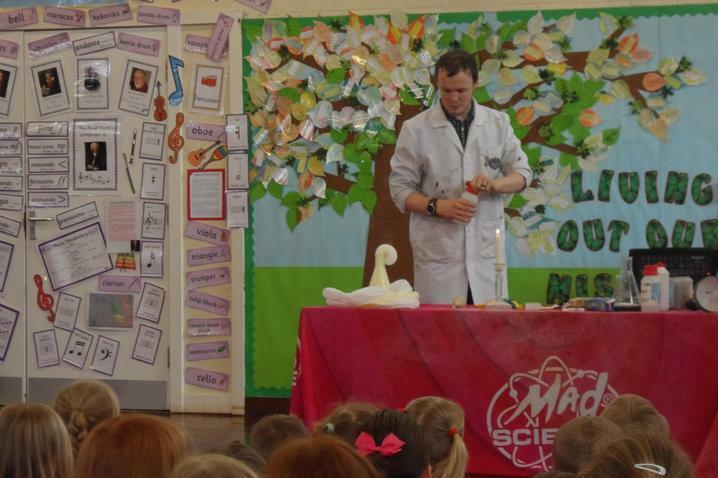 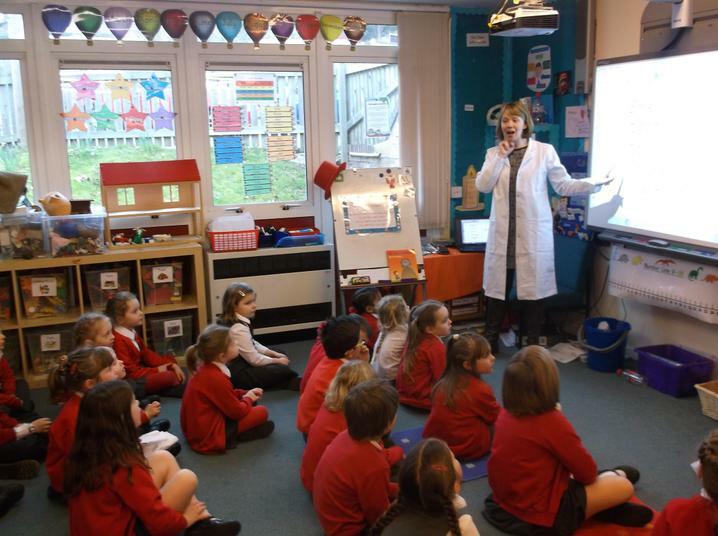 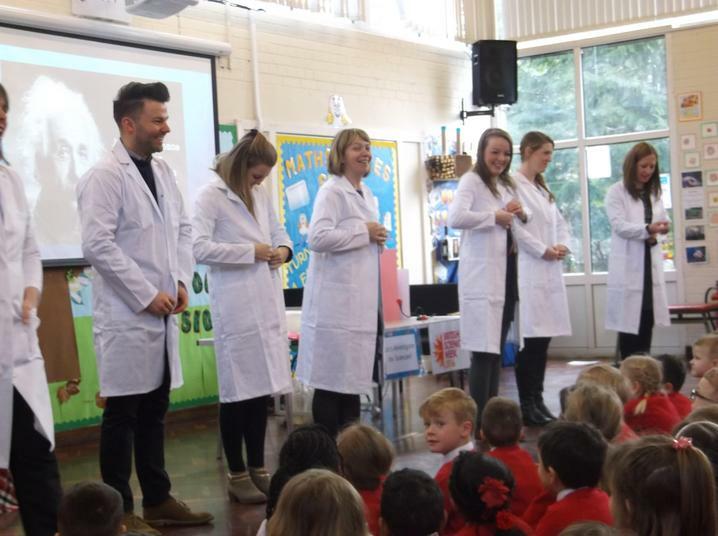 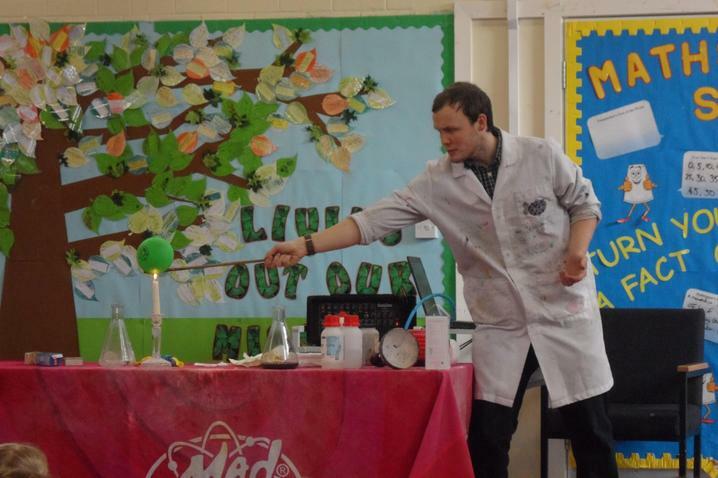 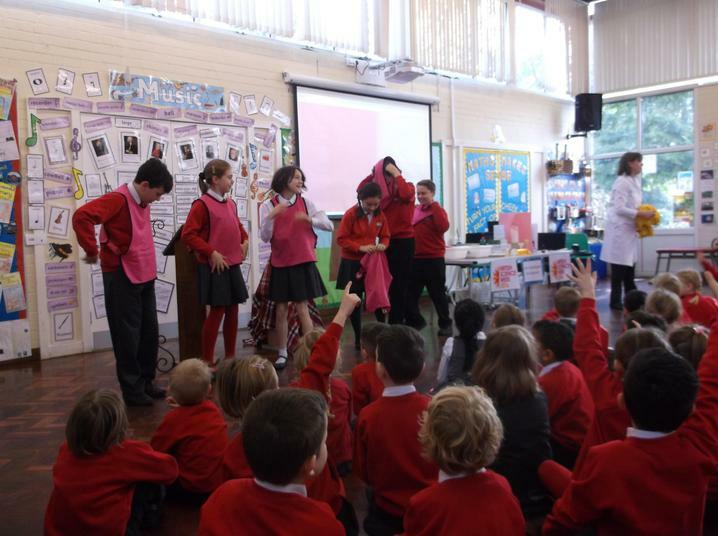 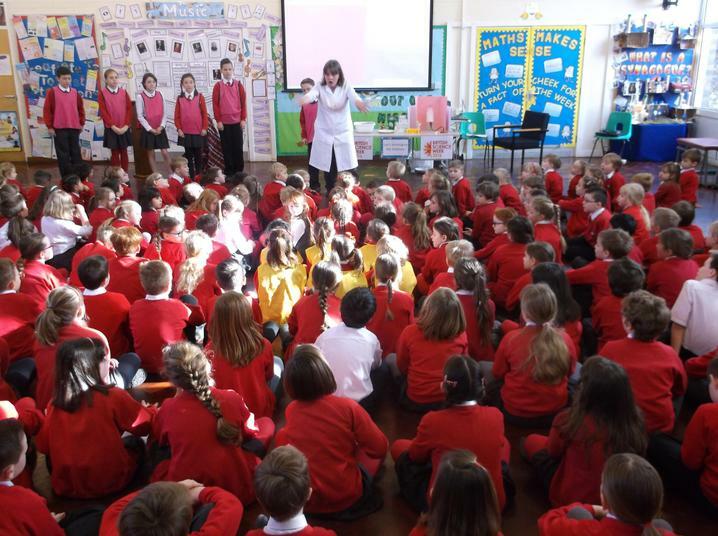 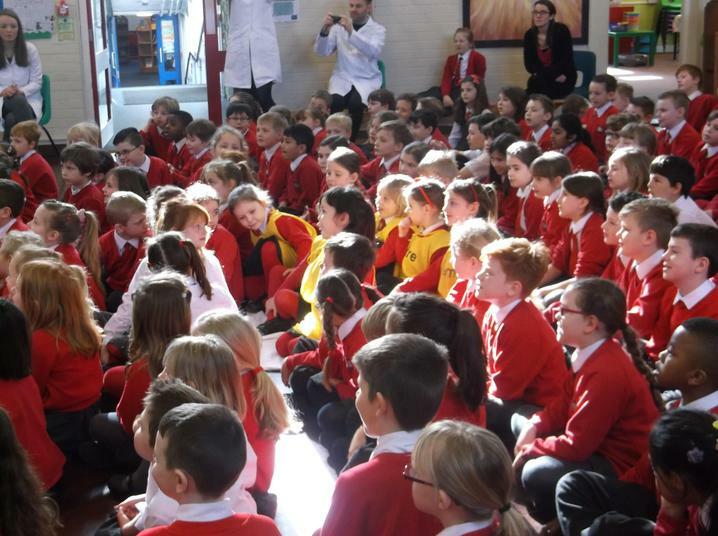 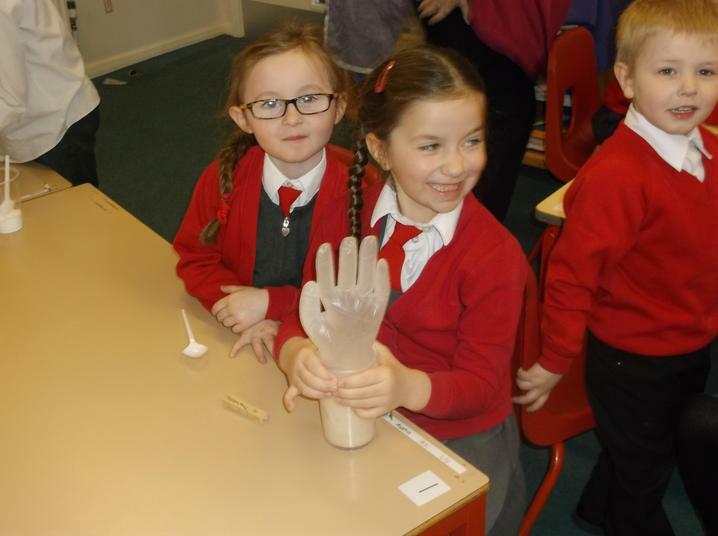 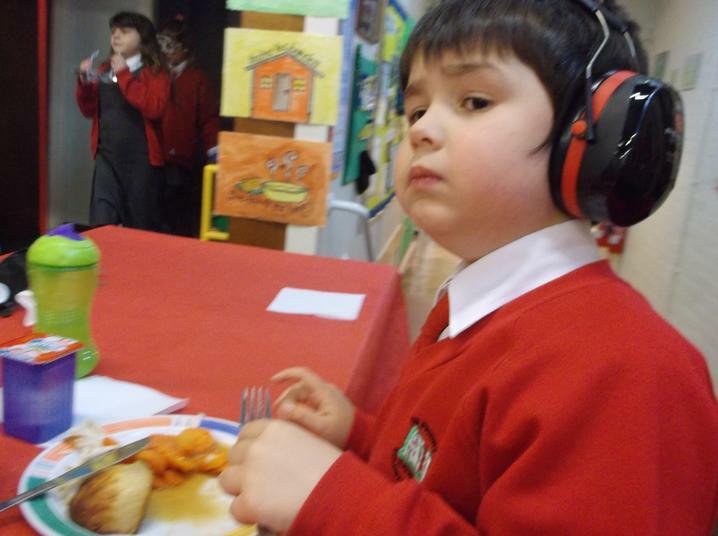 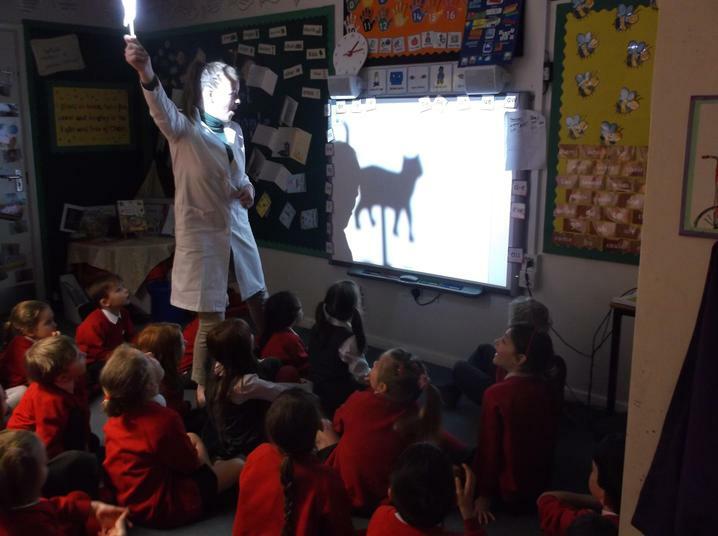 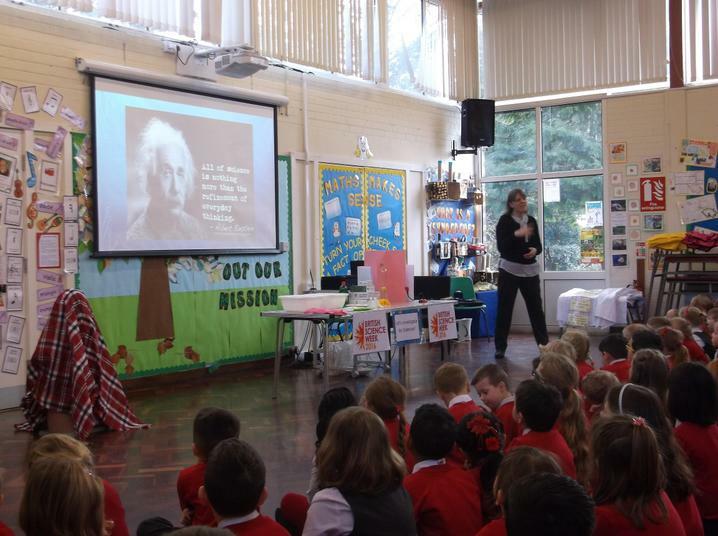 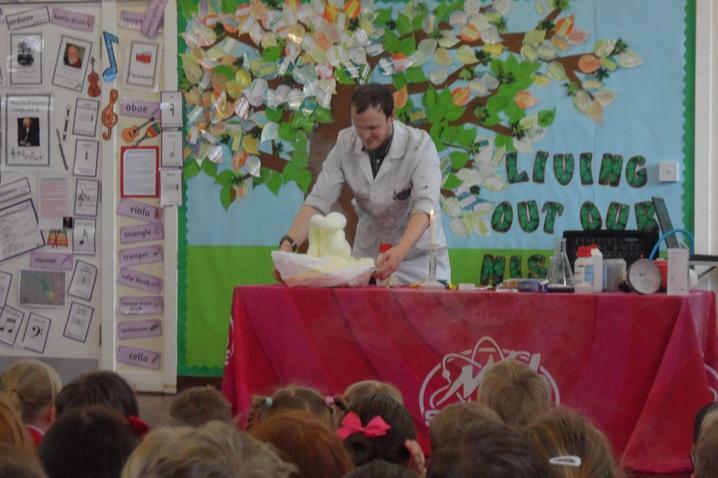 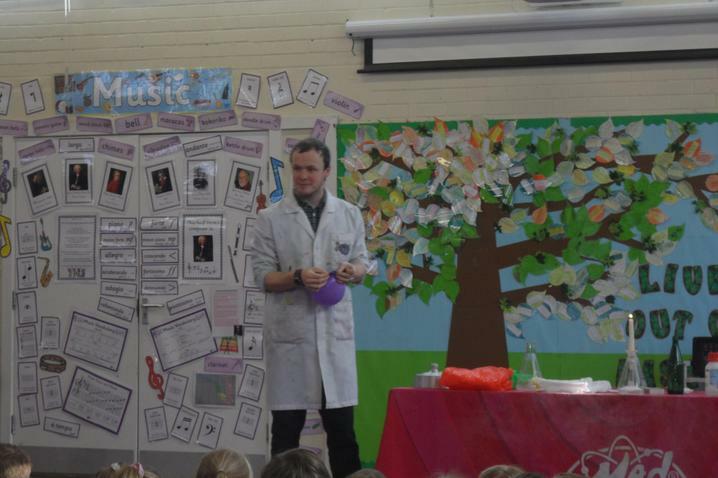 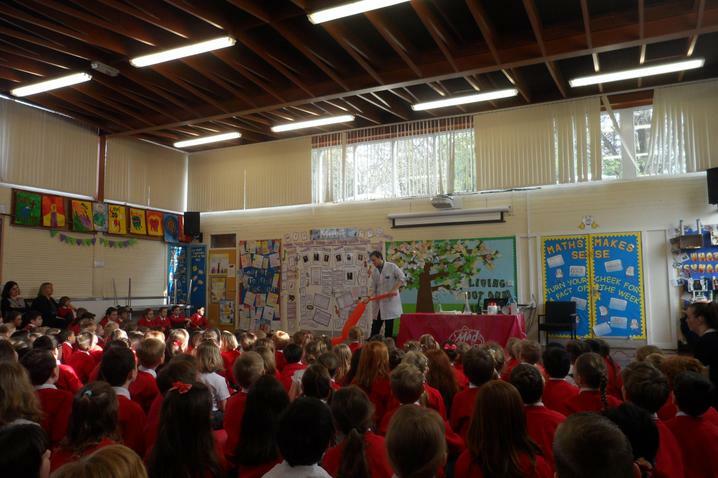 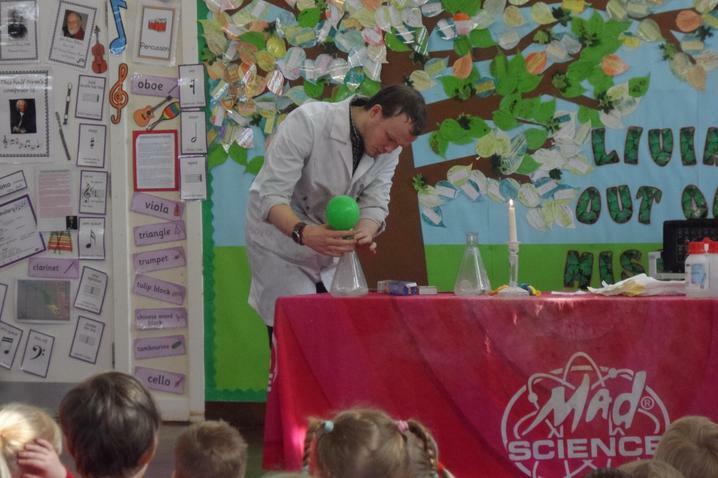 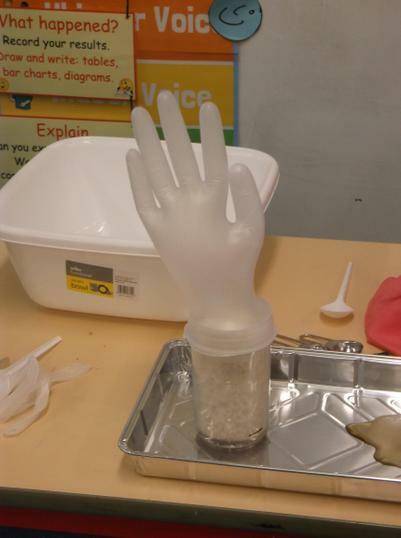 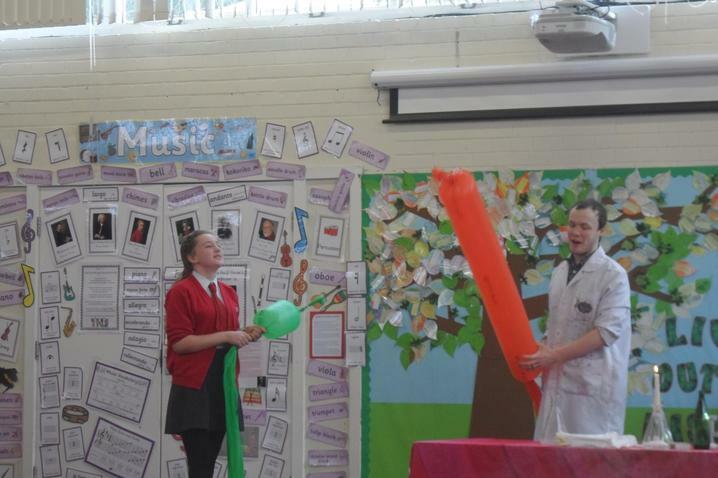 The children have had a wonderful time developing their science skills this week and learning about elements of biology (super senses), physics (light) and chemistry (states of matter) through assemblies, a thoroughly enjoyable activity day and a visit from the Mad Scientist - Chemical Charlie. 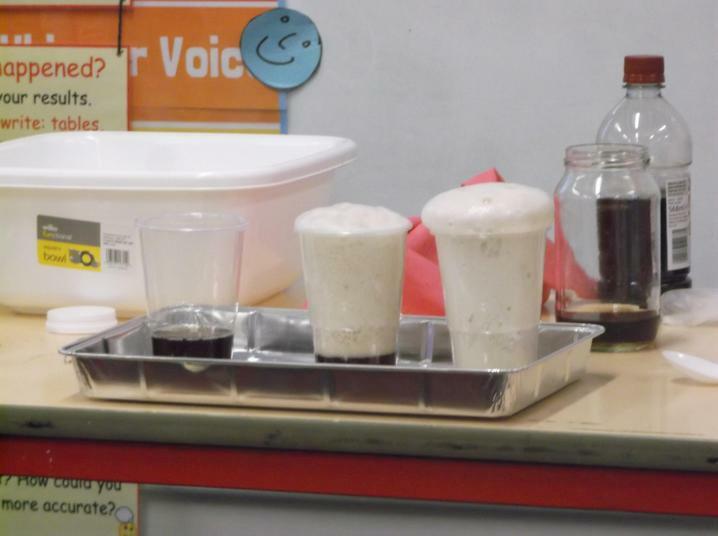 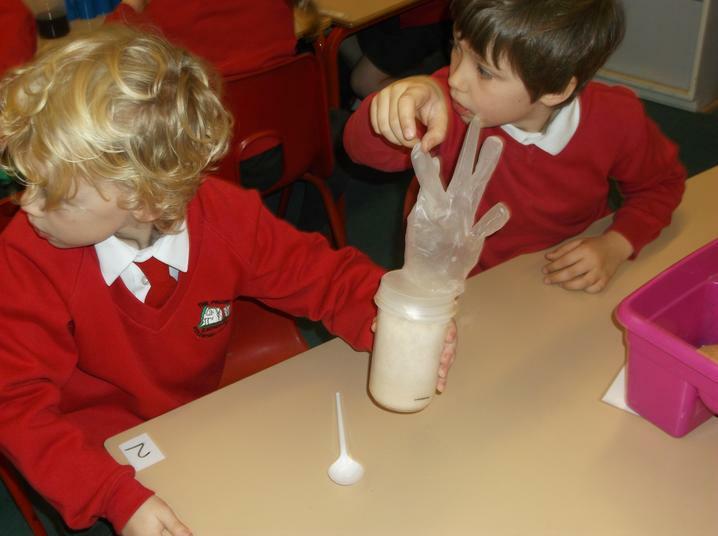 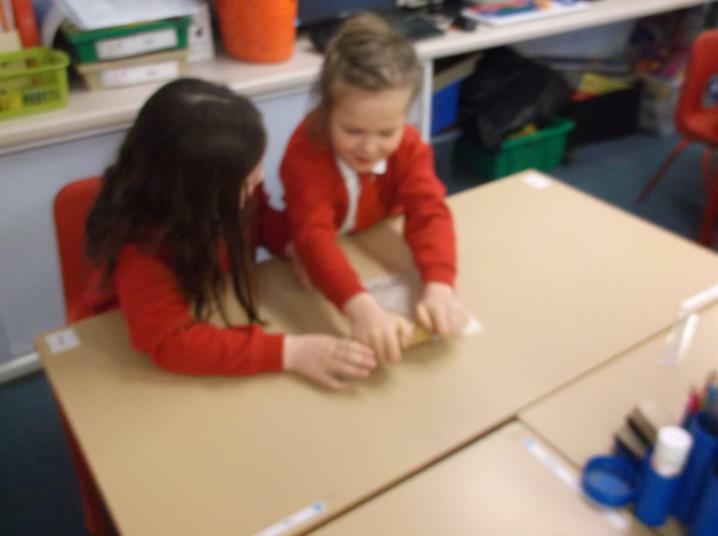 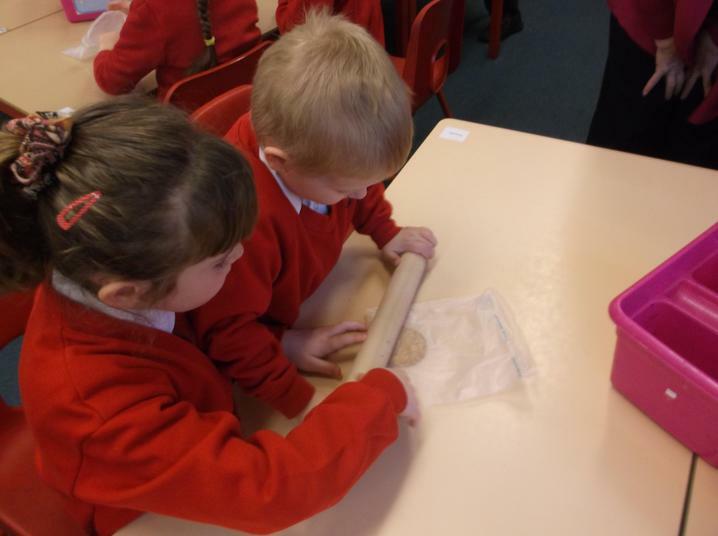 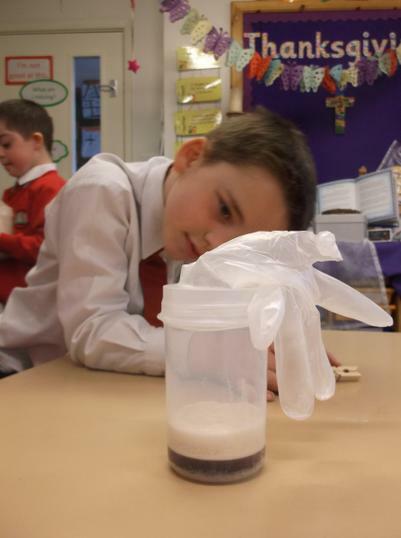 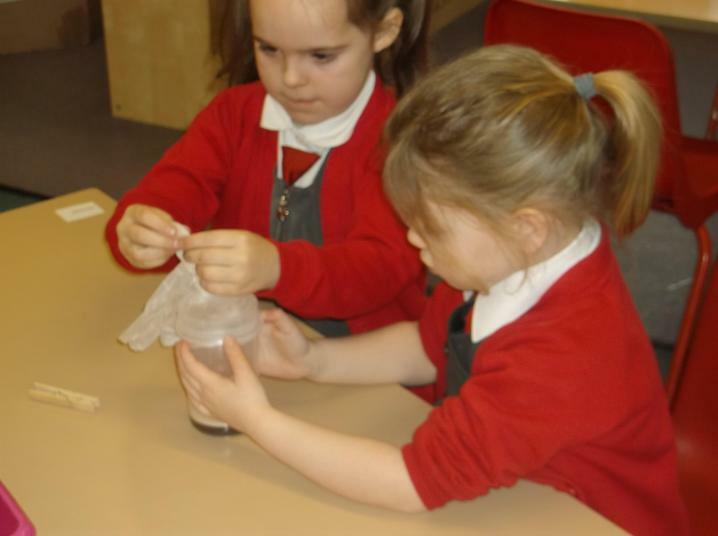 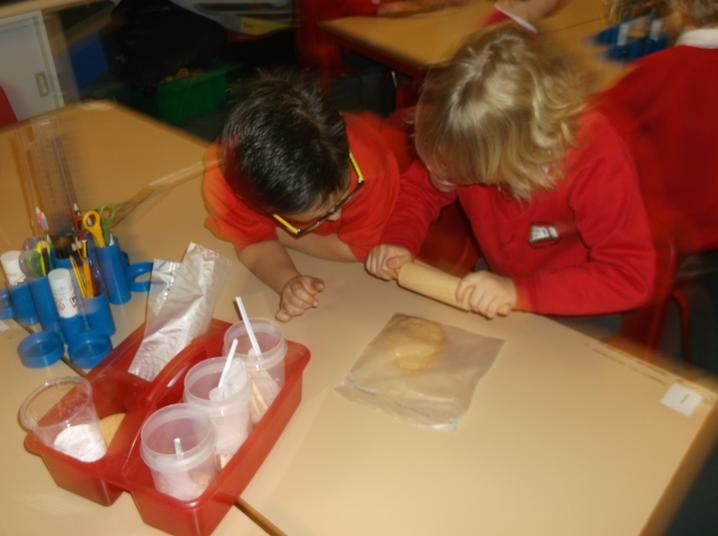 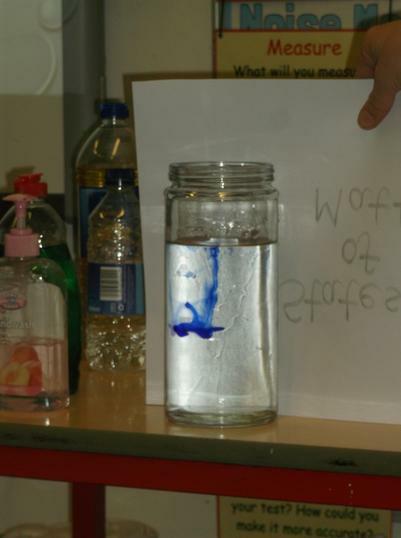 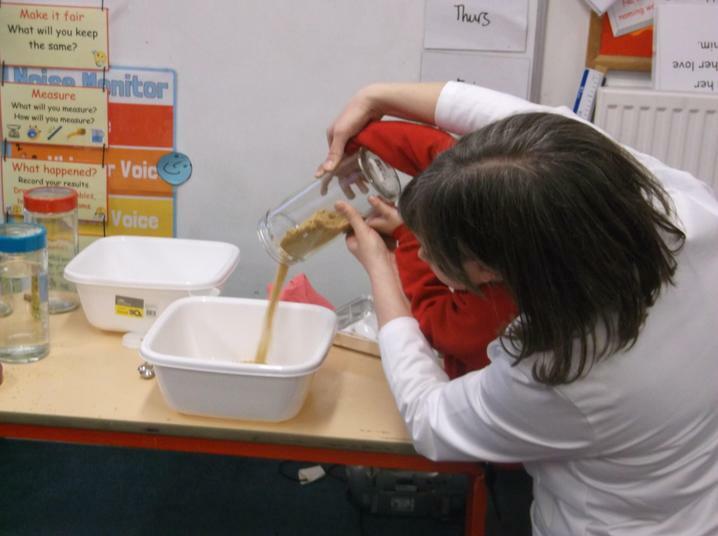 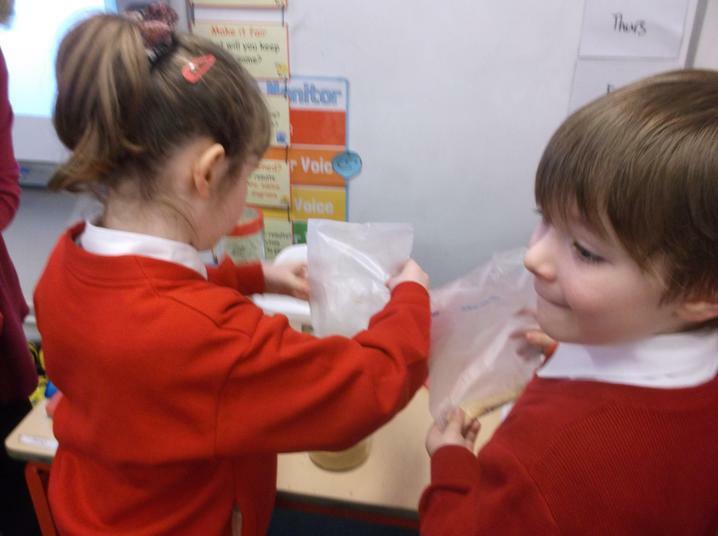 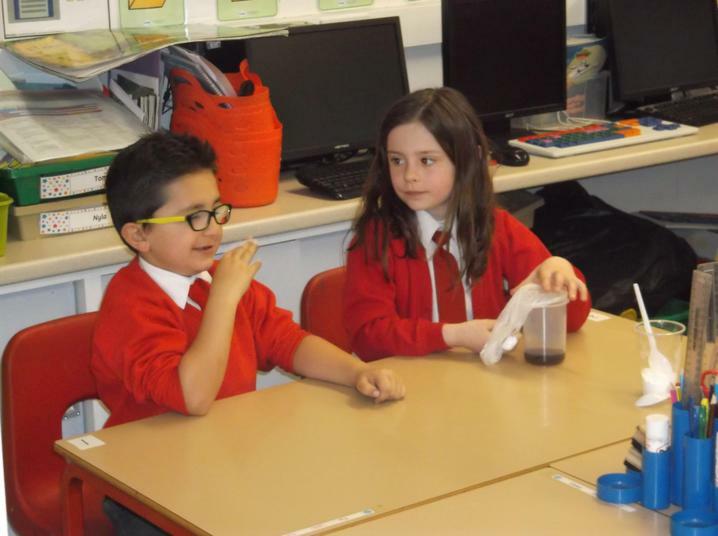 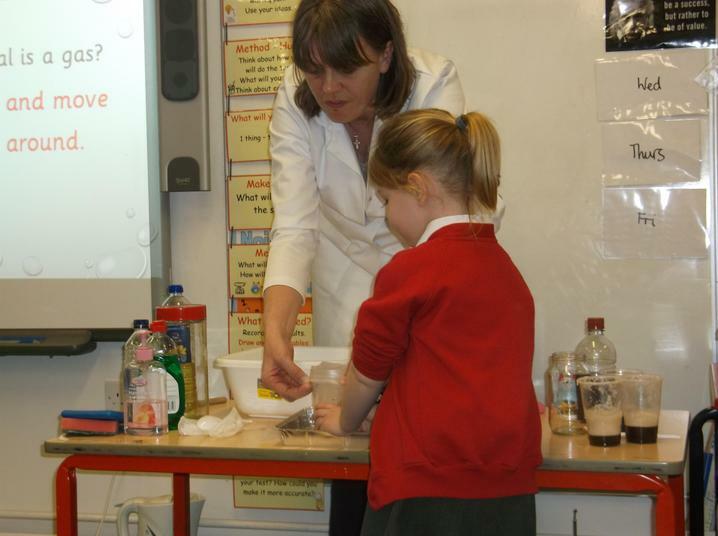 In the Year 2 'lab' we investigated if you can pour a biscuit, how liquids move and we trapped a gas. 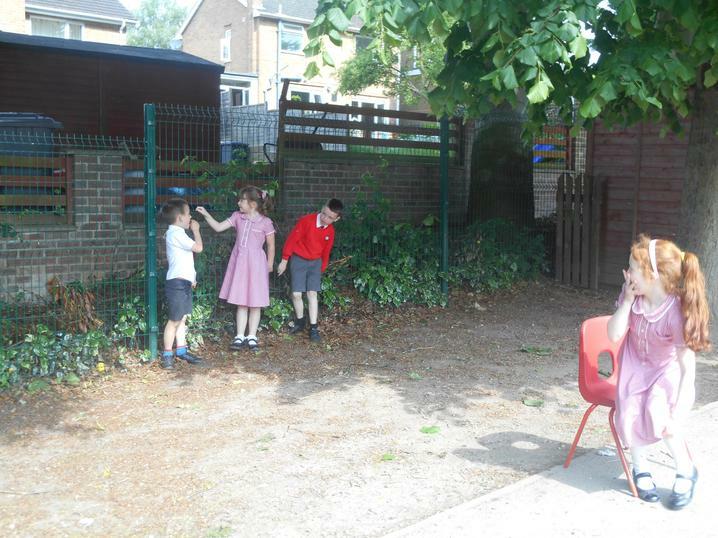 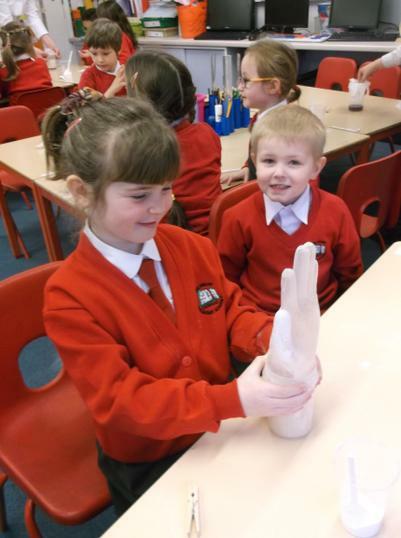 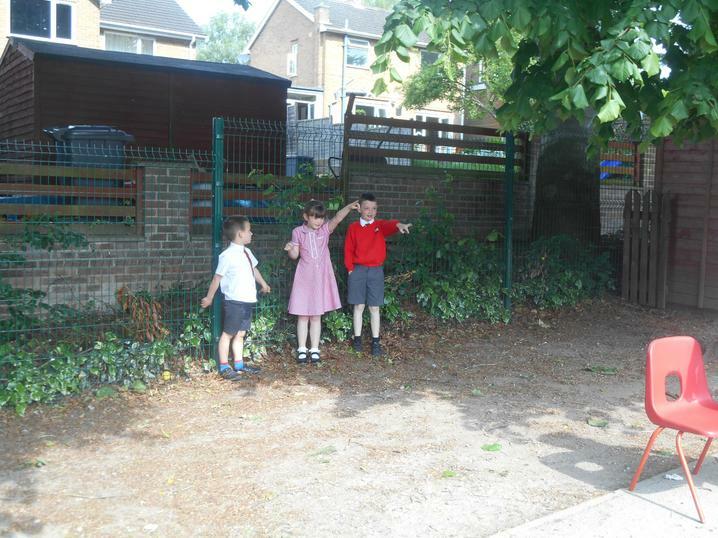 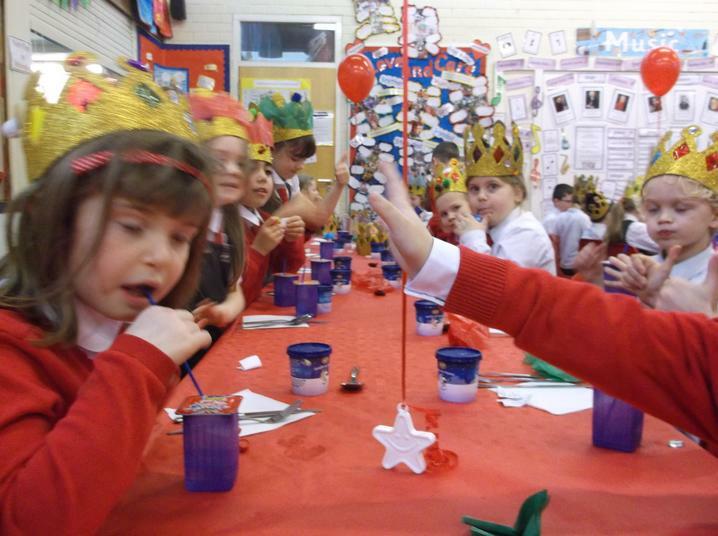 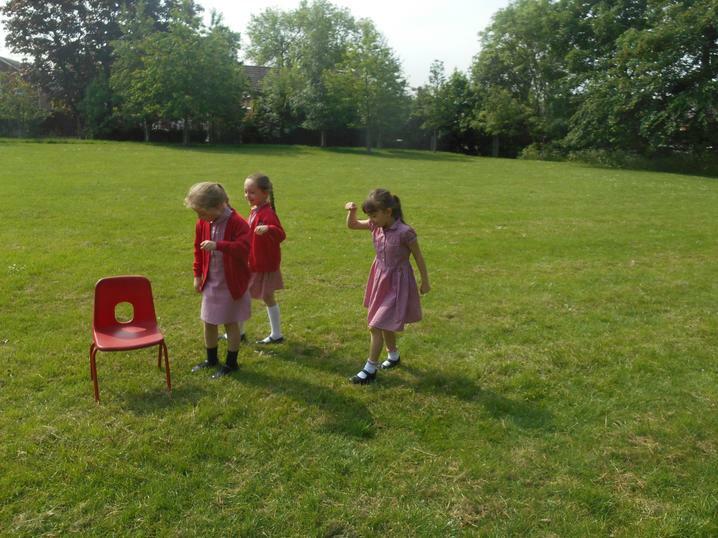 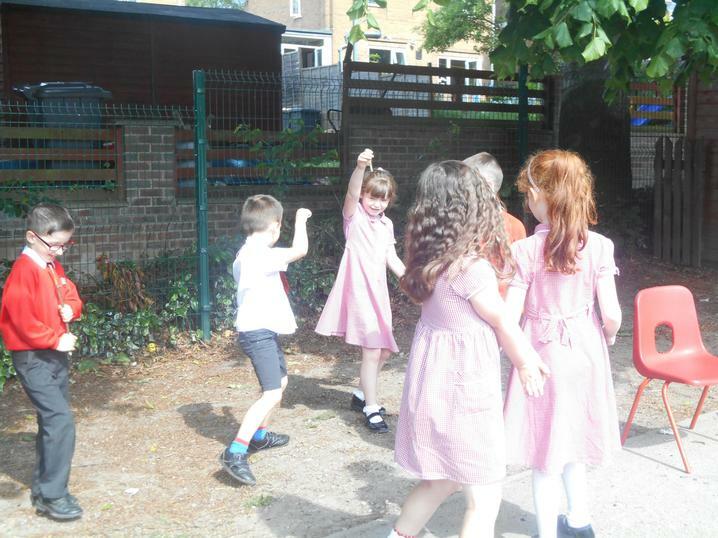 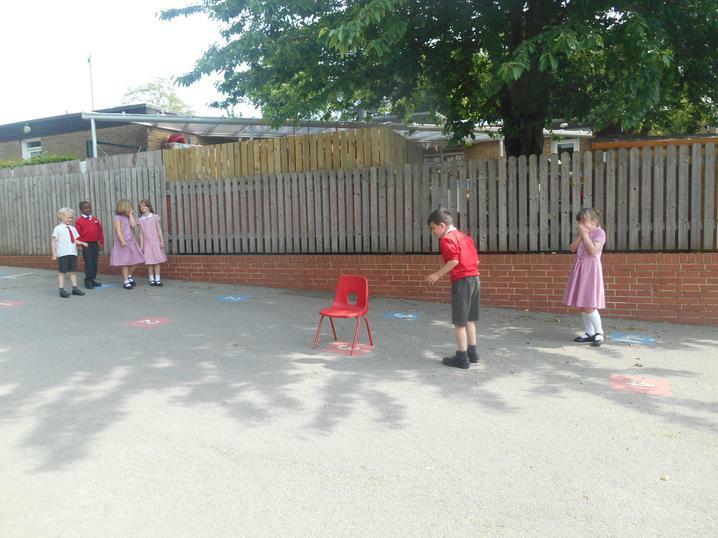 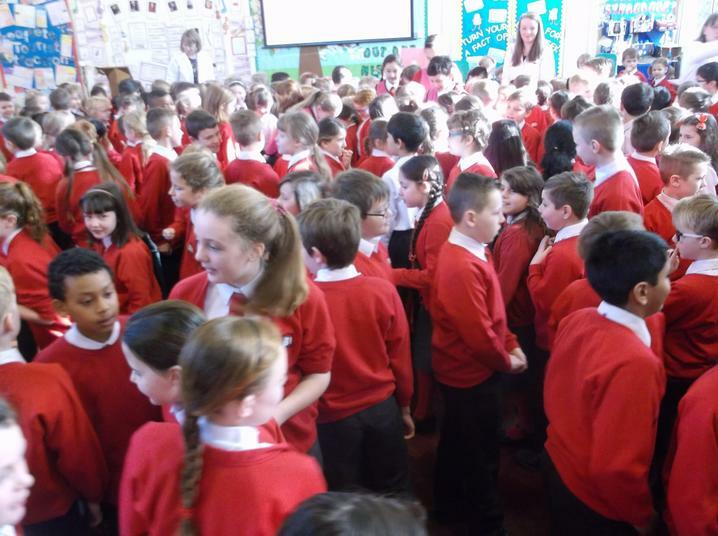 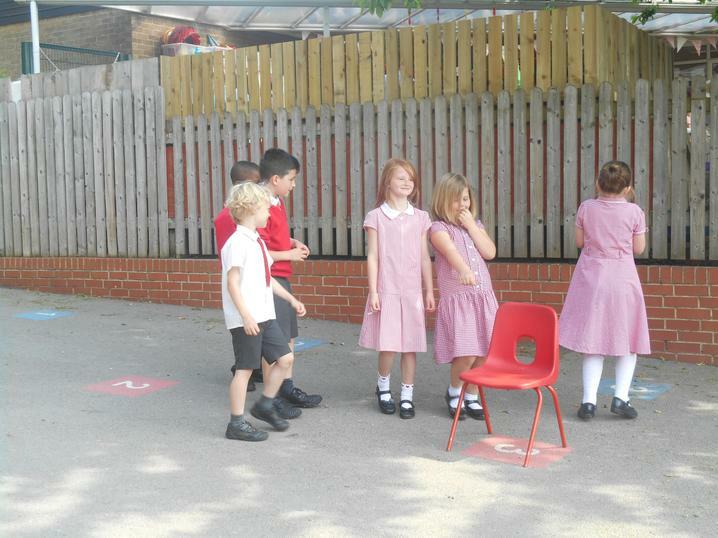 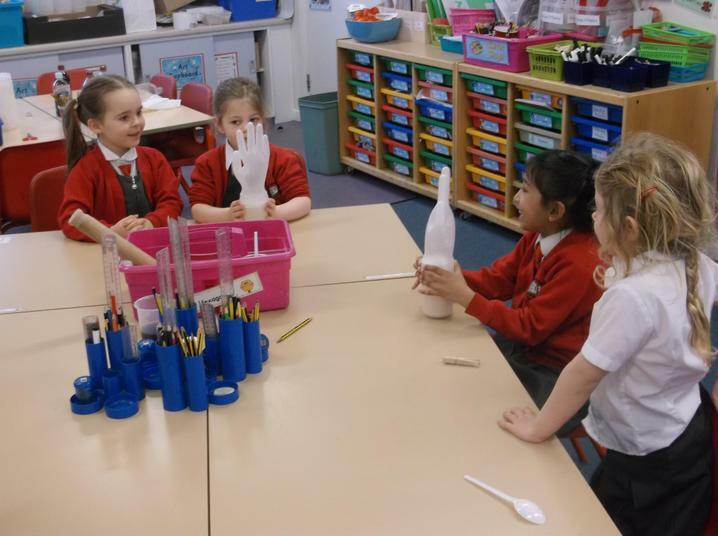 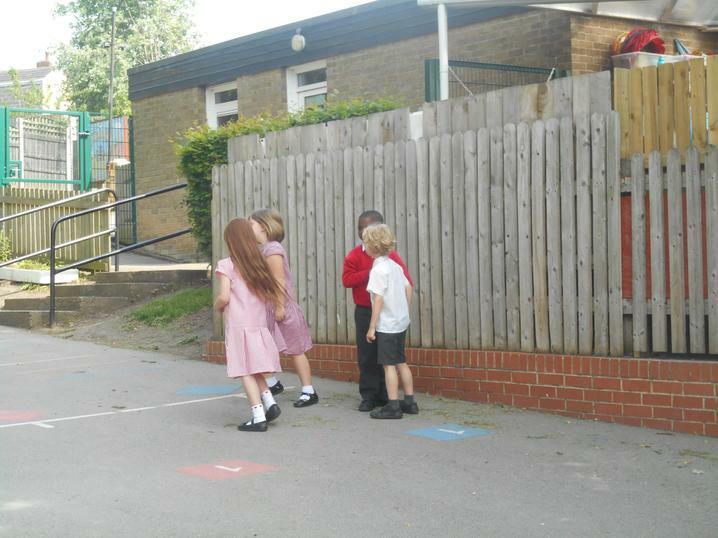 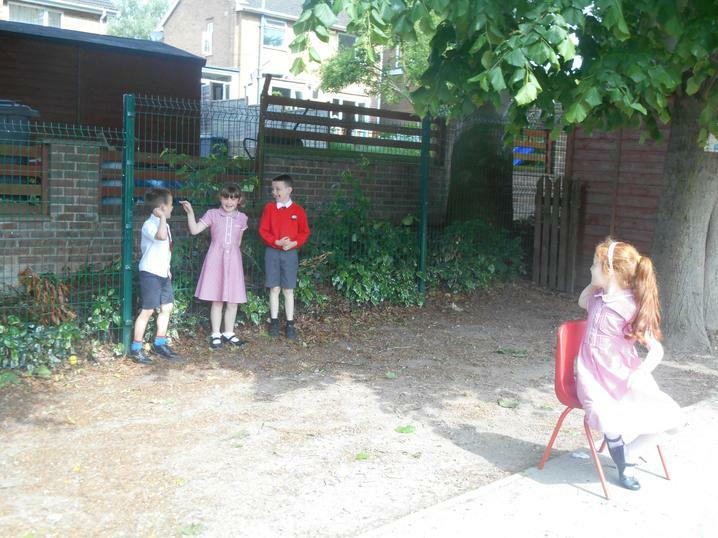 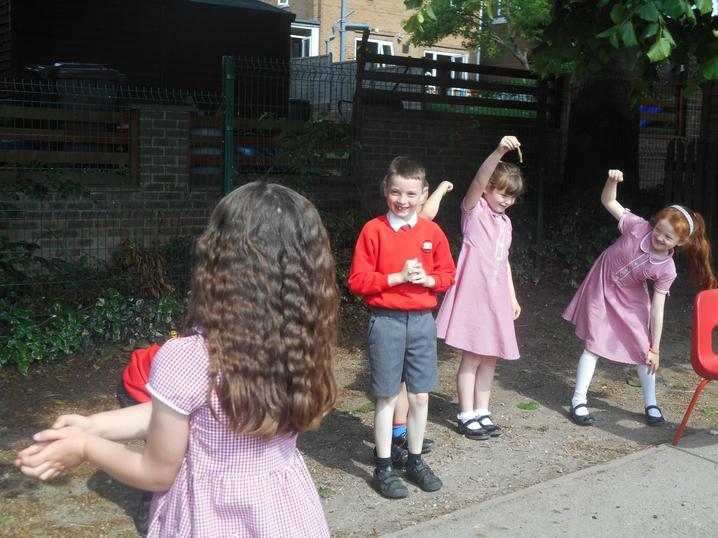 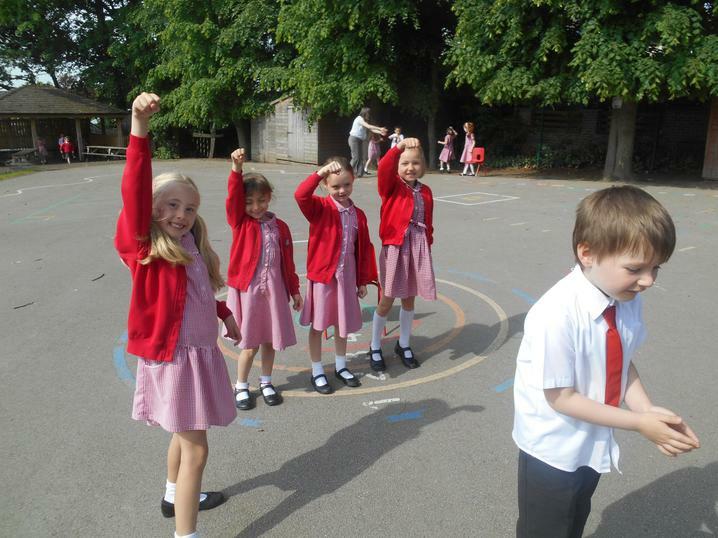 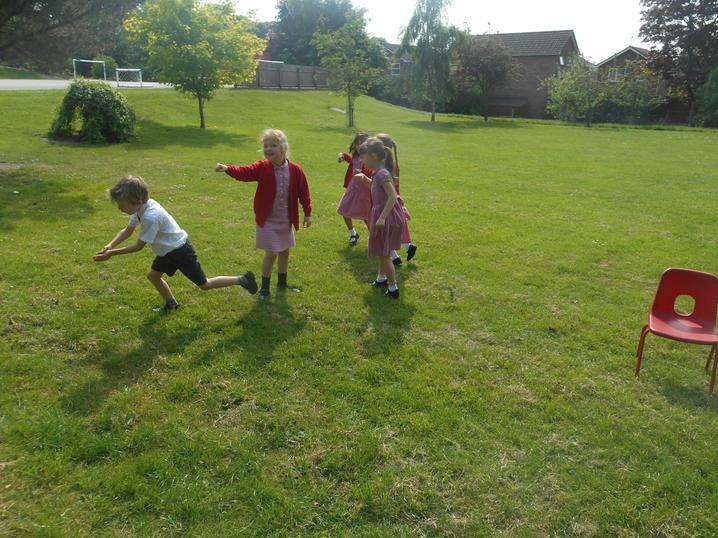 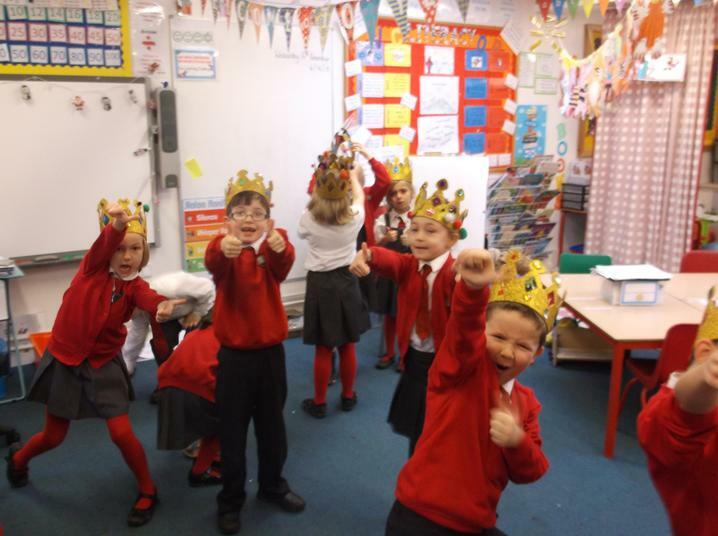 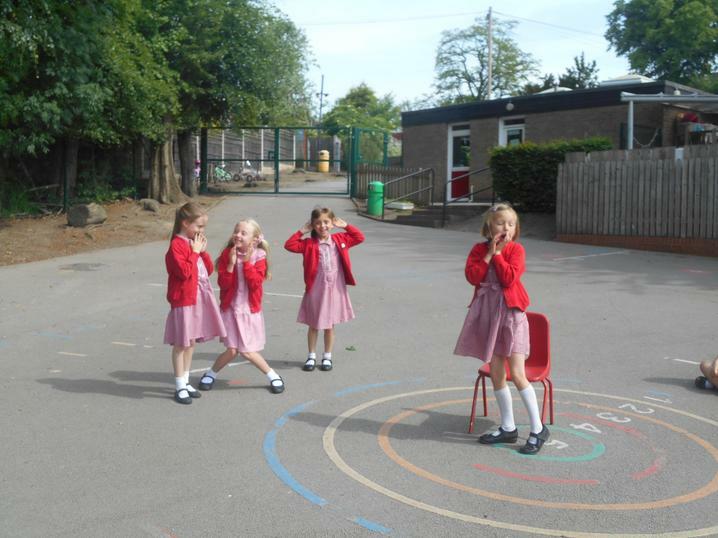 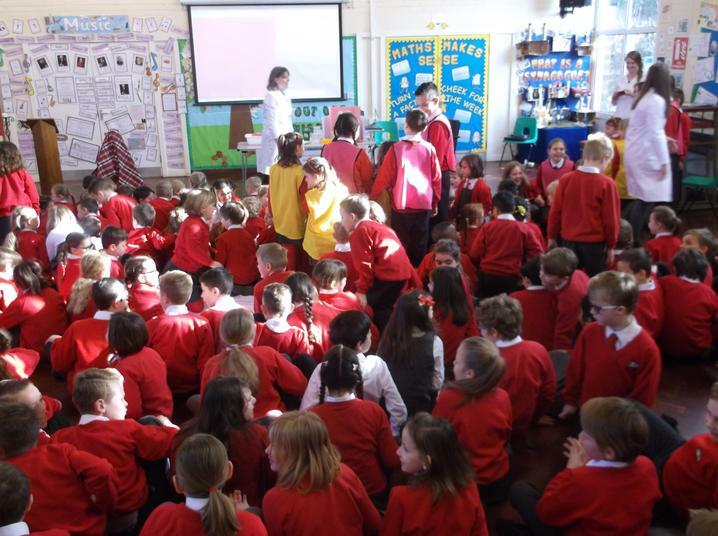 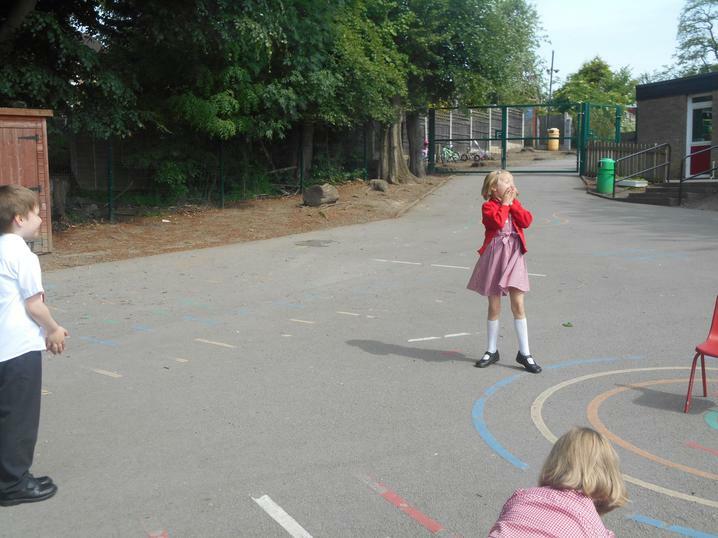 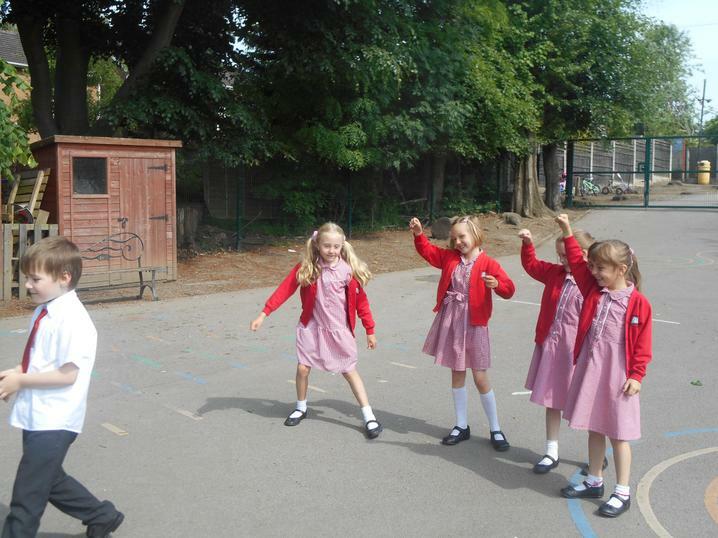 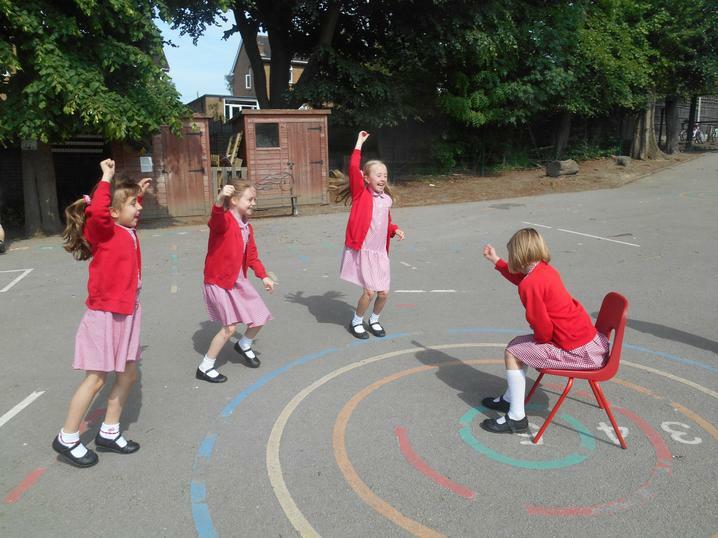 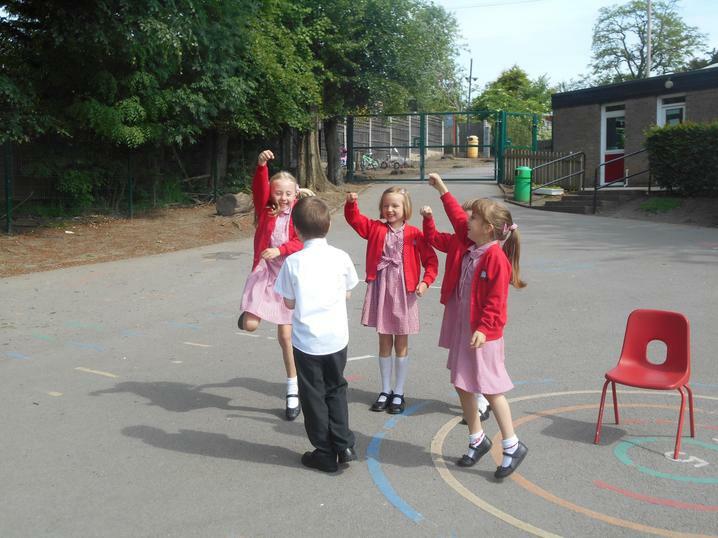 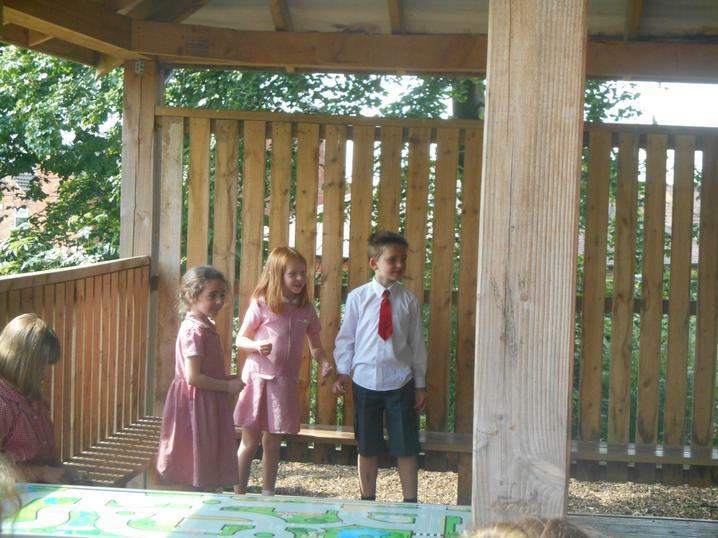 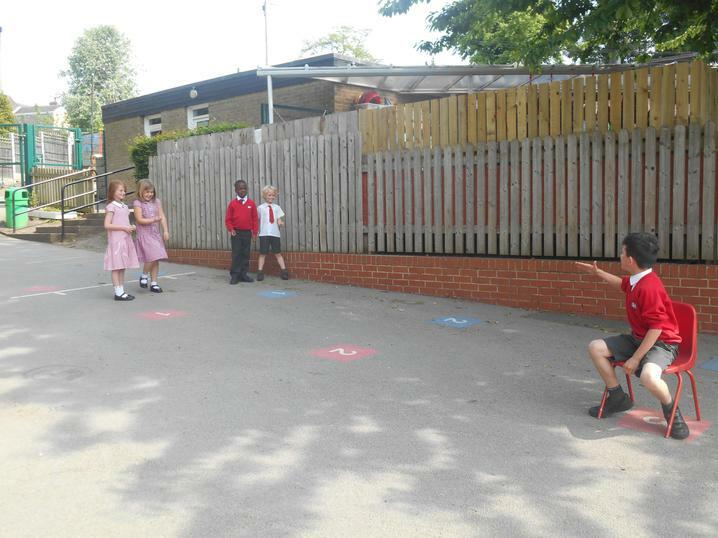 We acted out being solid, liquid and gas molecules. 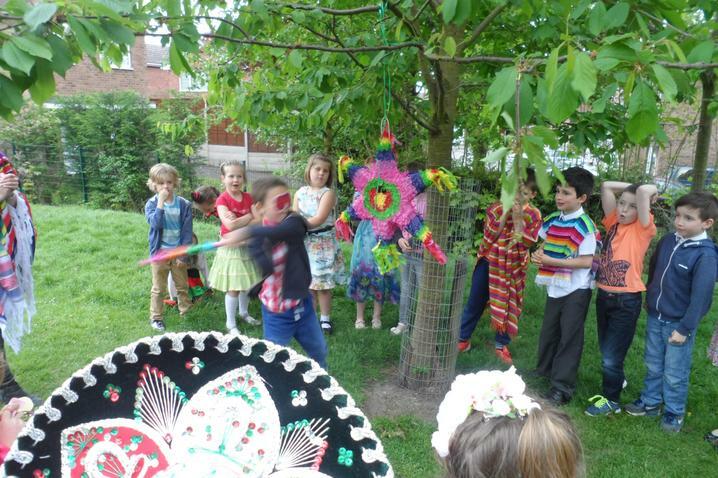 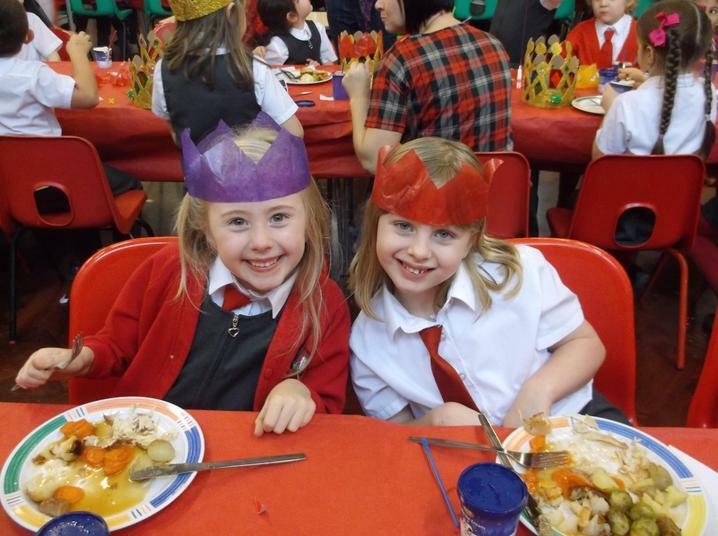 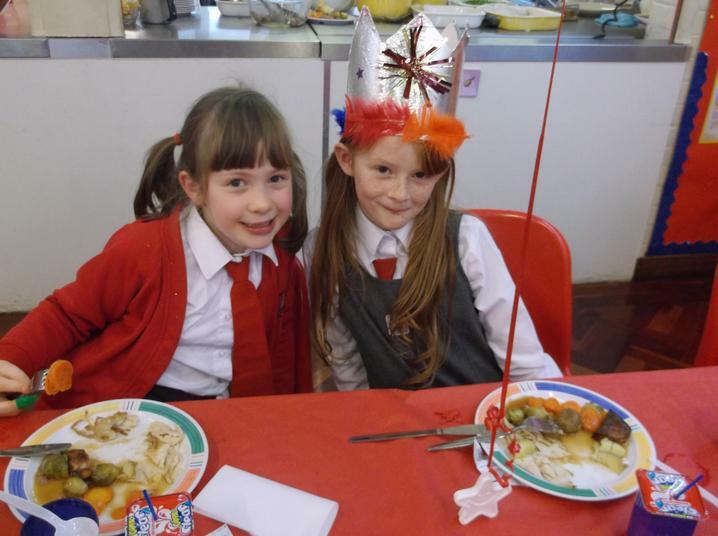 Check out our photos...to be uploaded shortly. 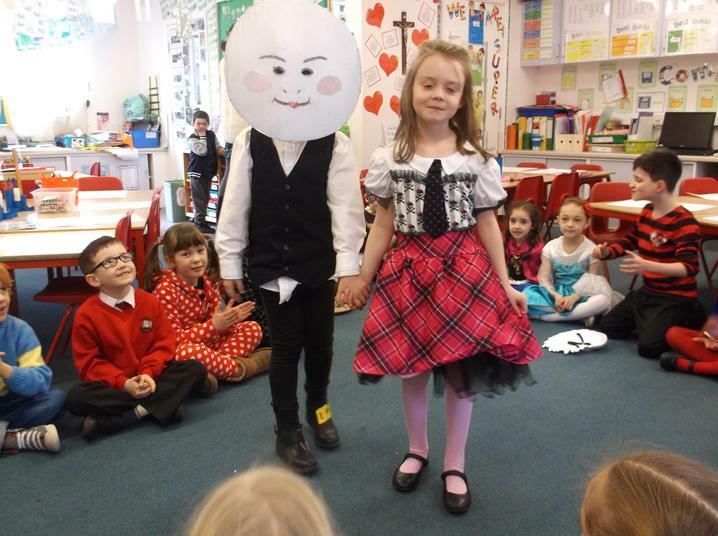 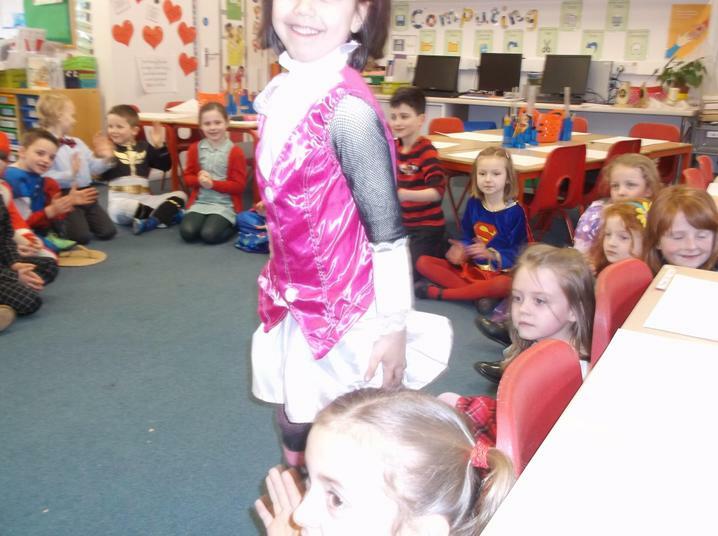 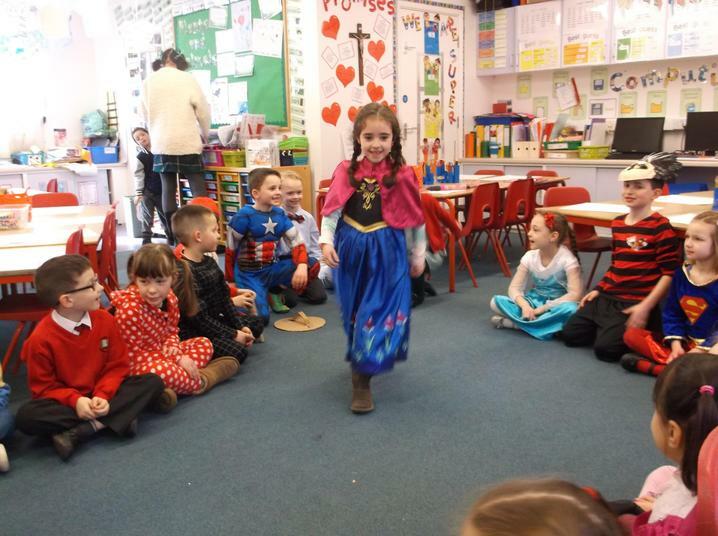 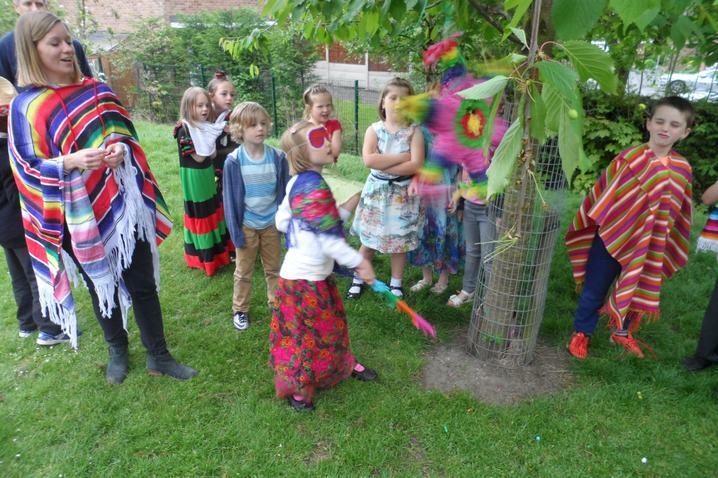 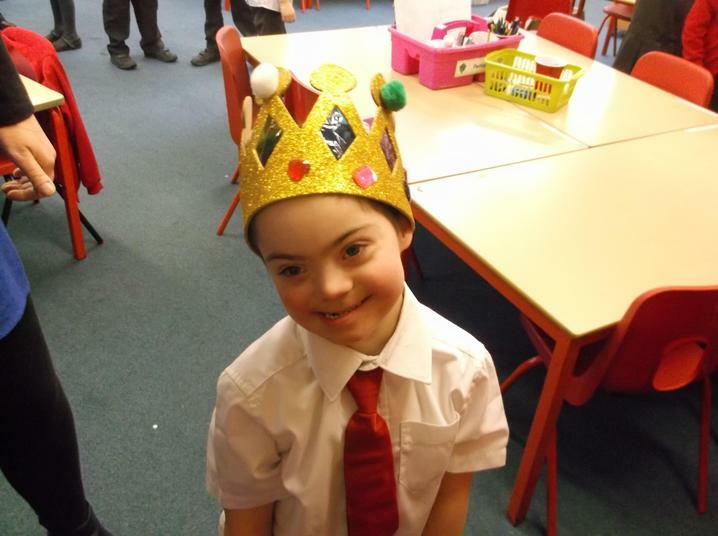 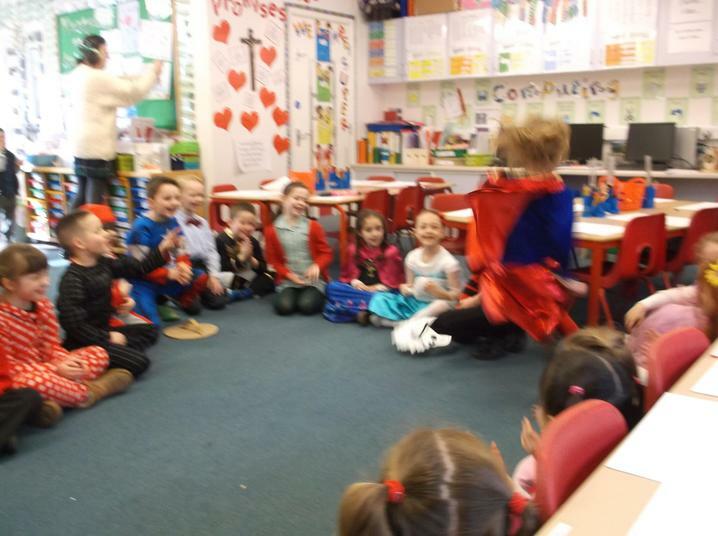 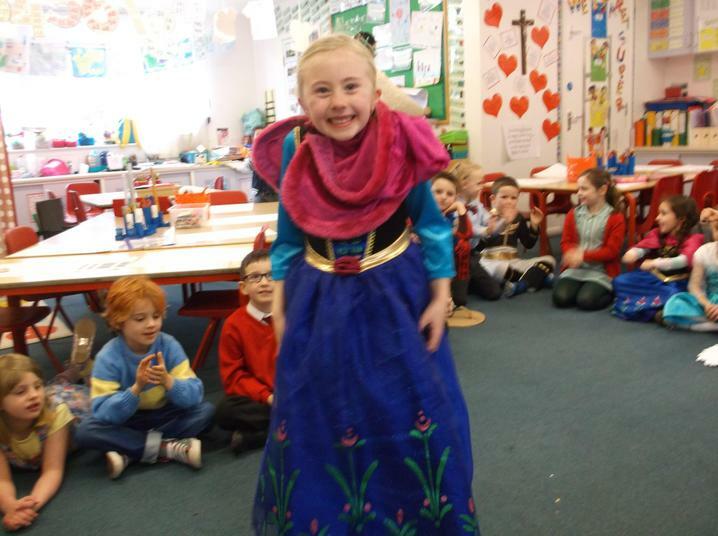 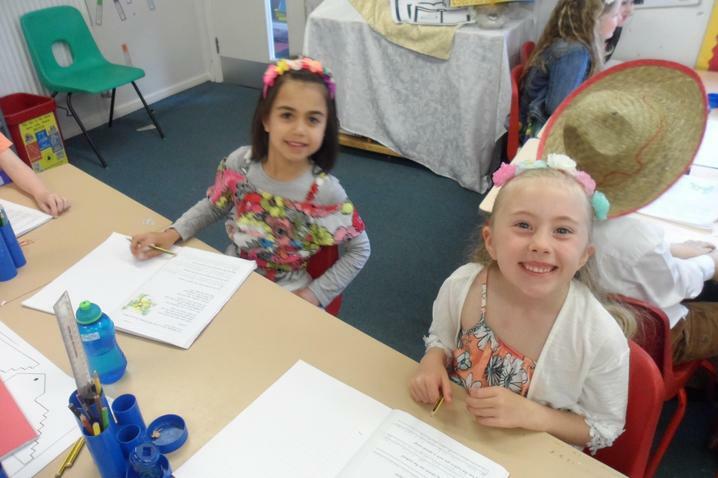 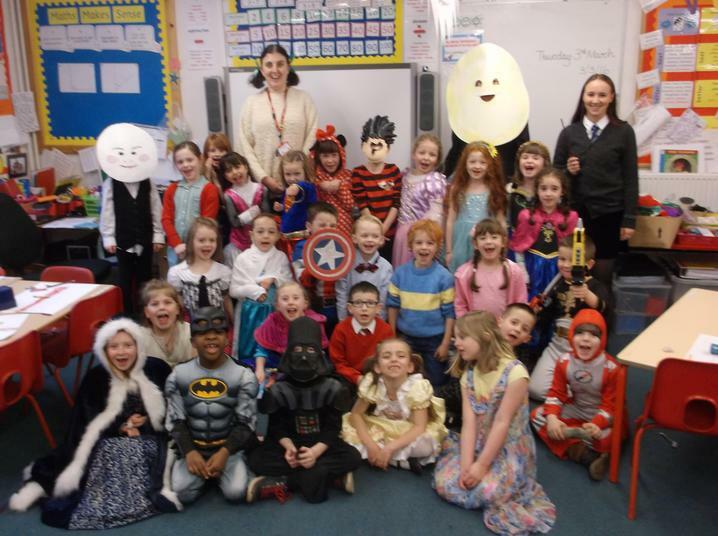 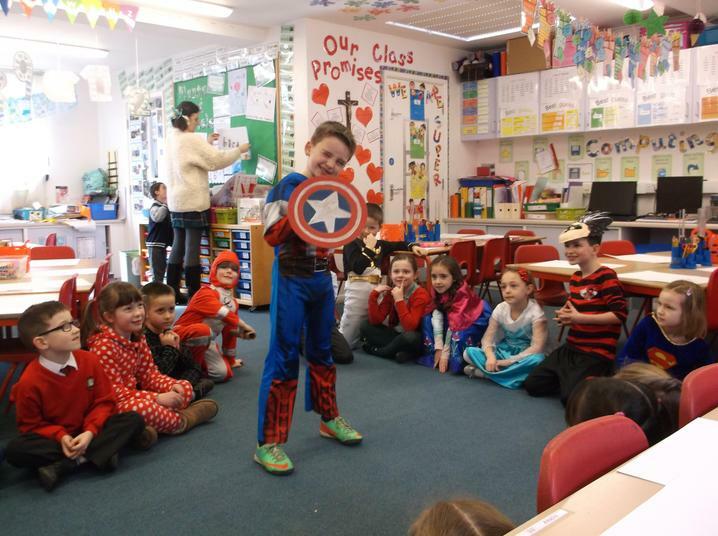 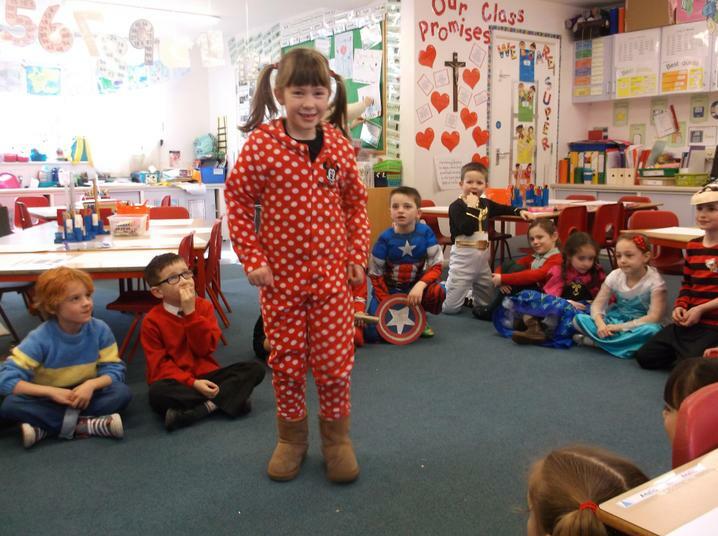 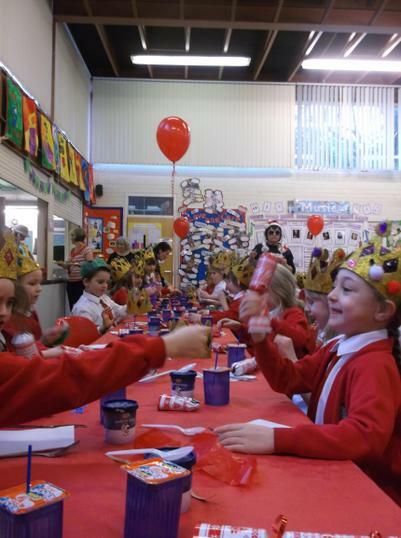 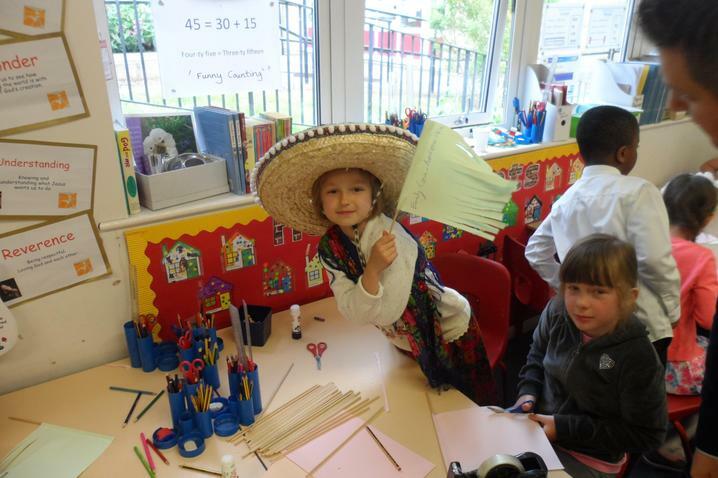 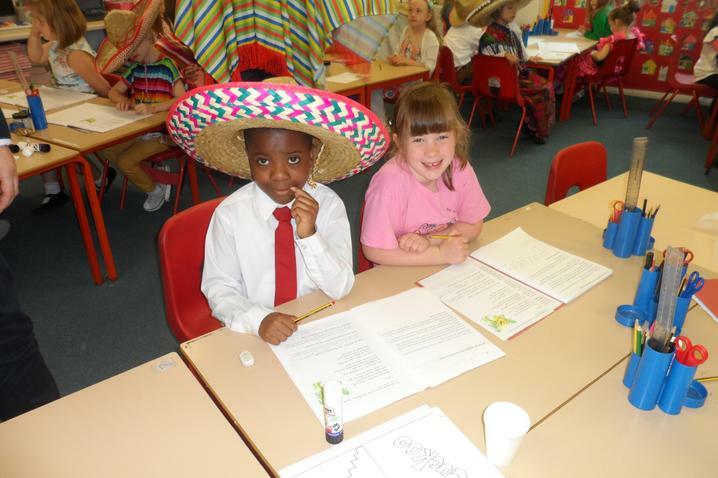 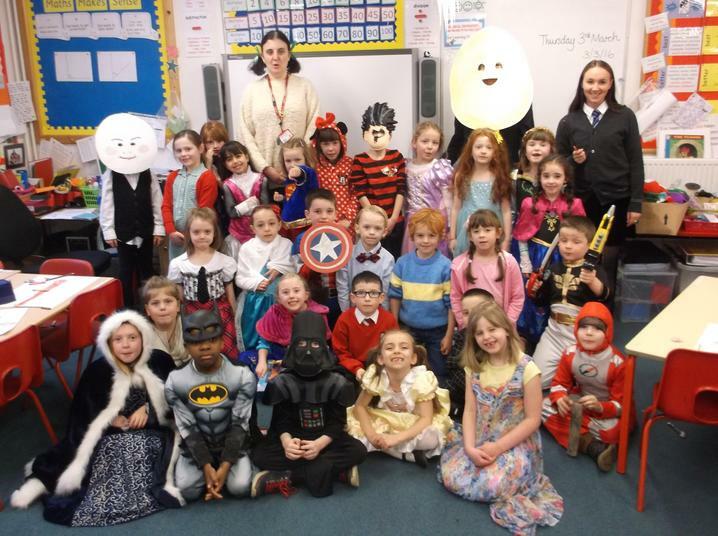 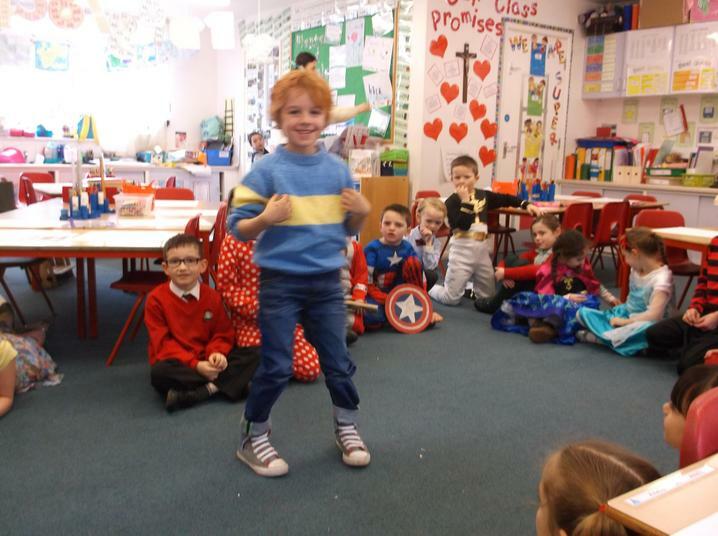 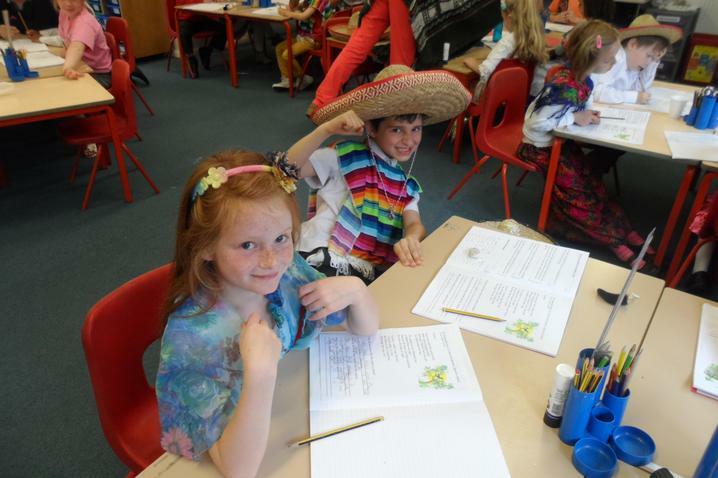 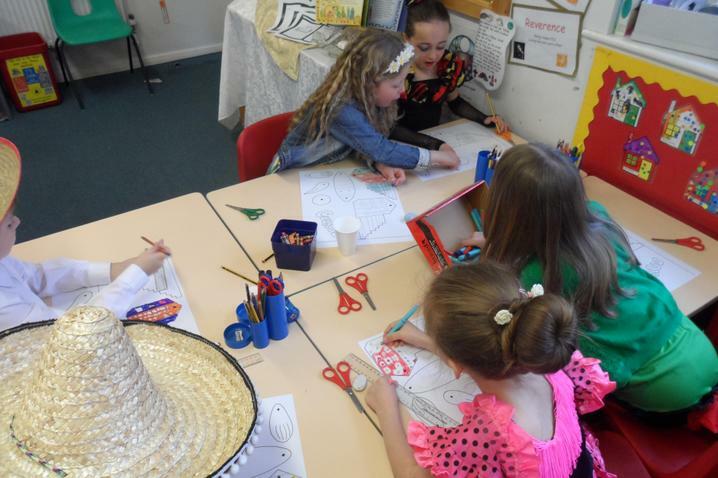 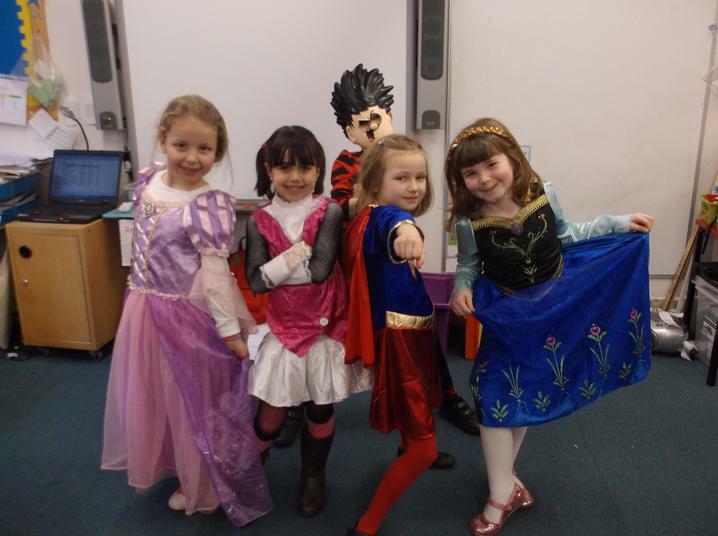 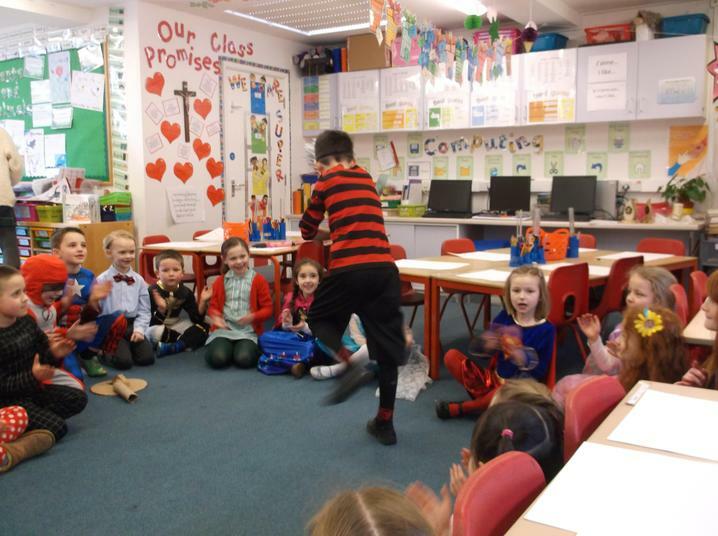 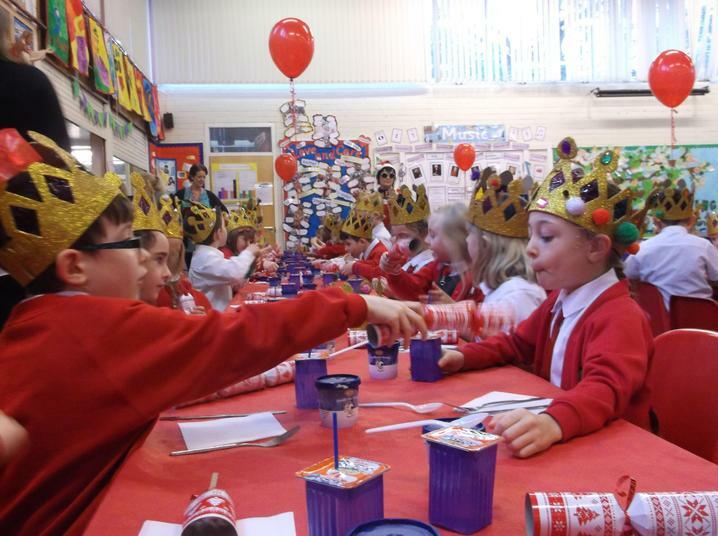 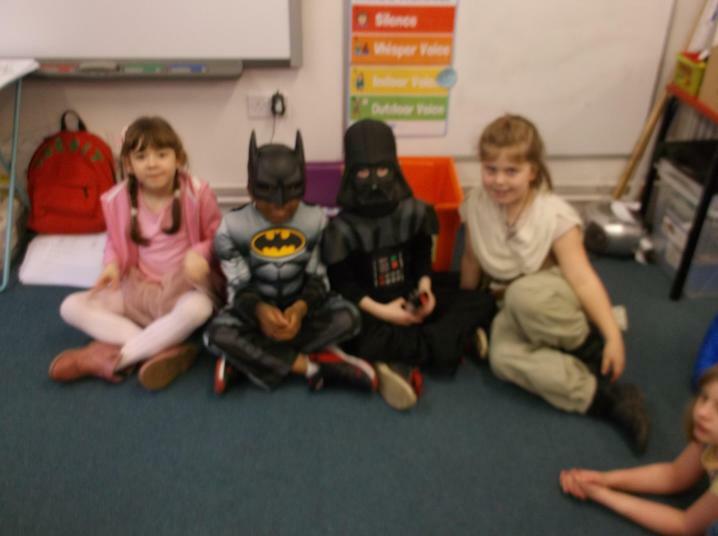 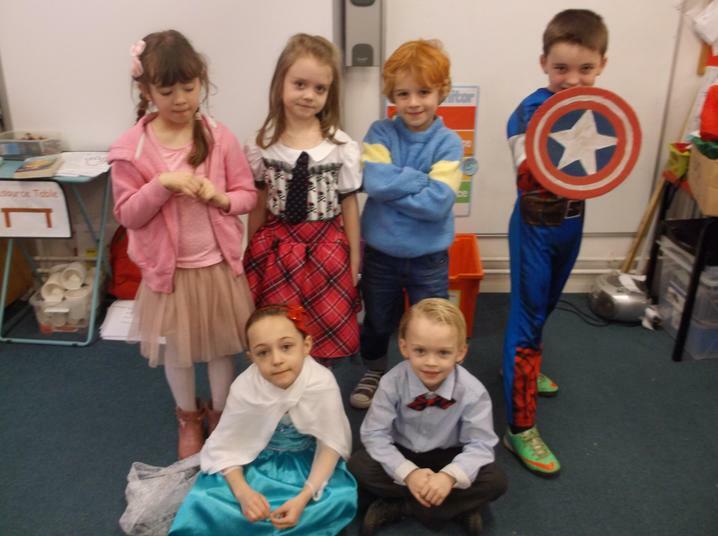 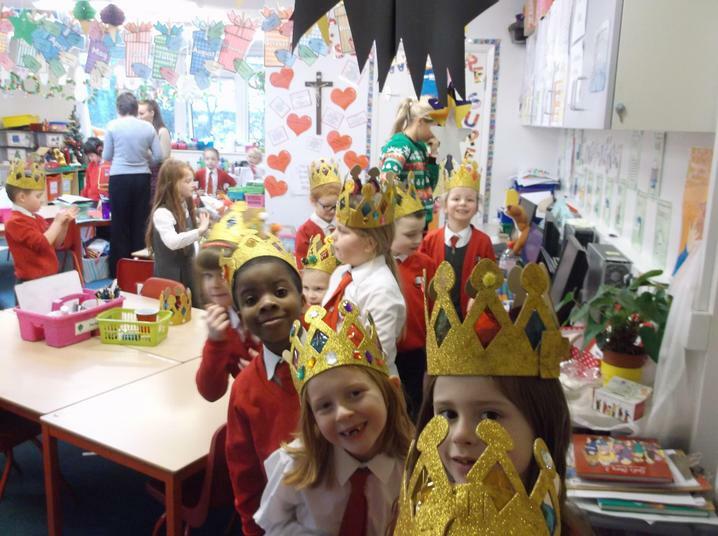 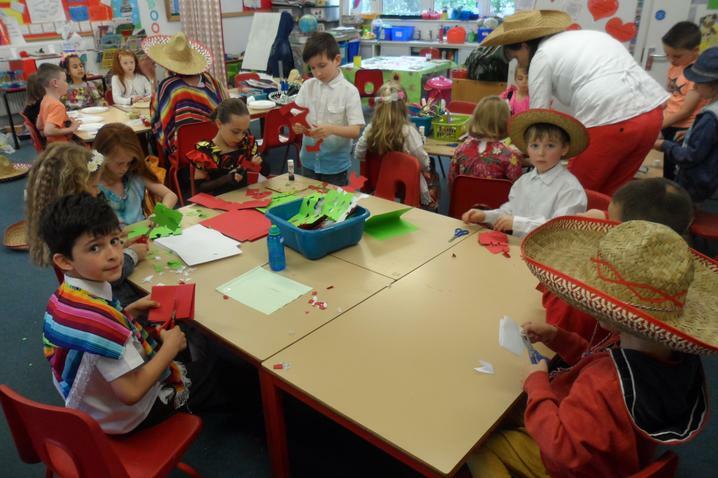 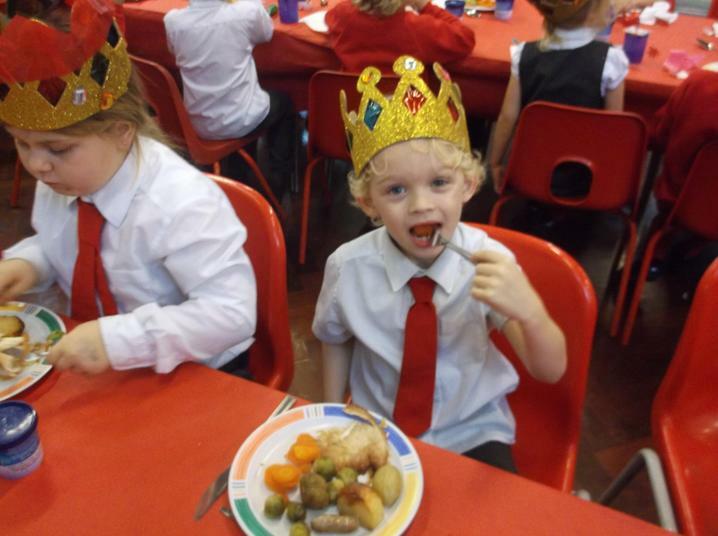 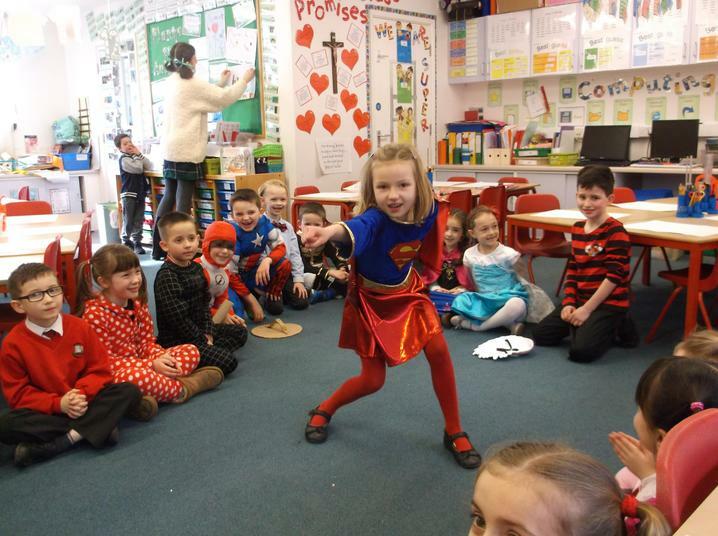 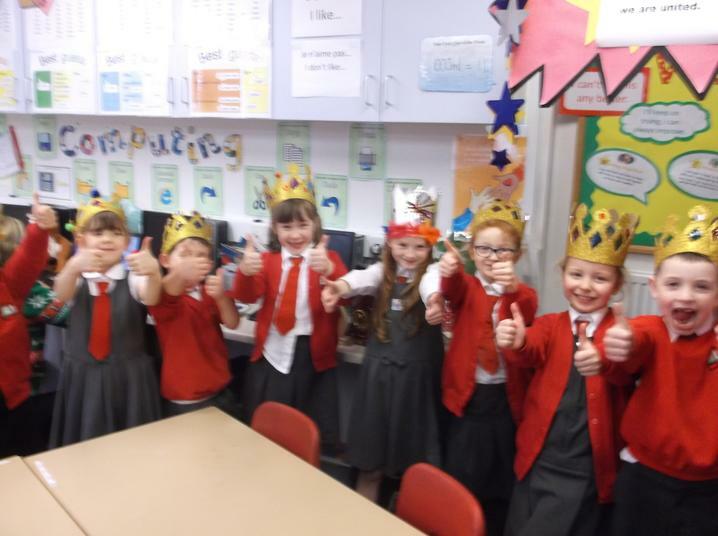 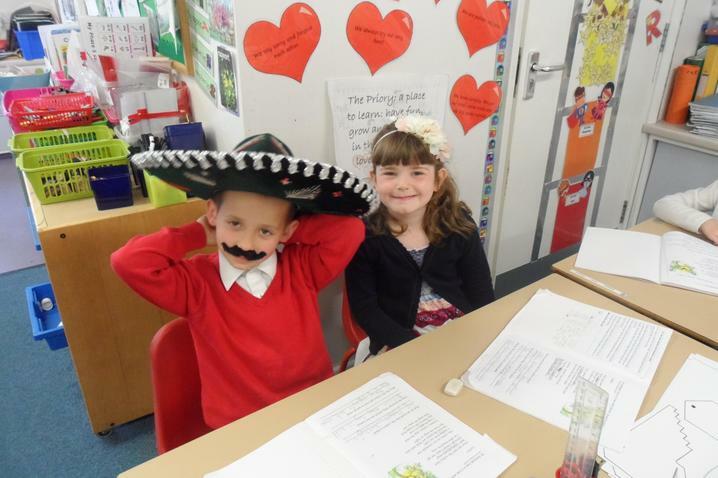 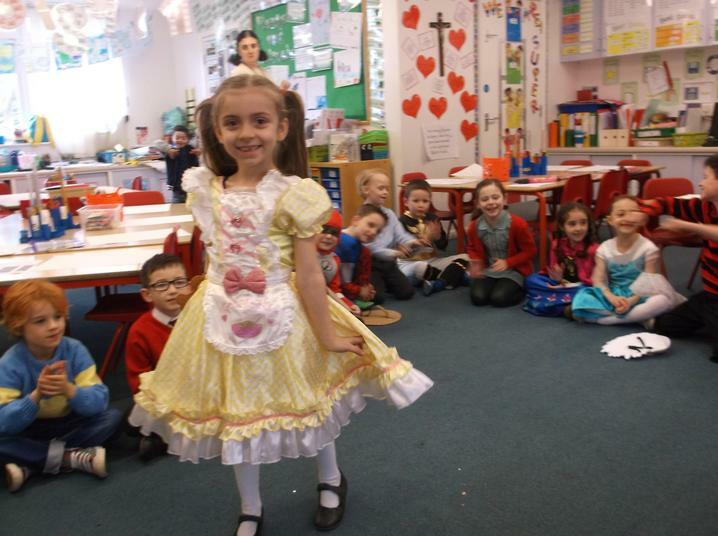 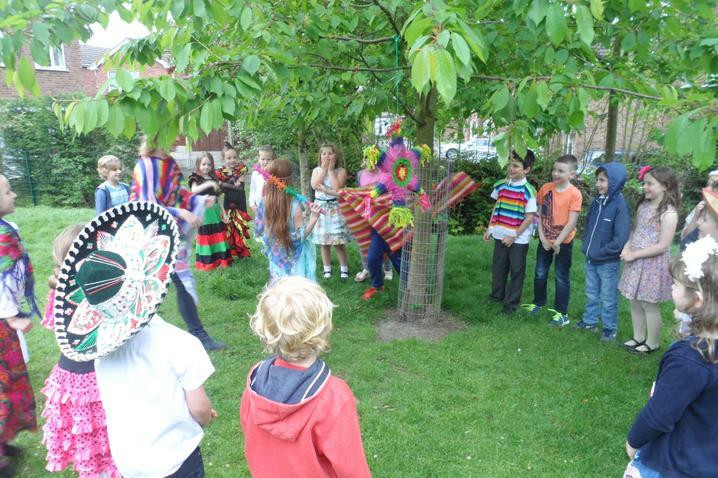 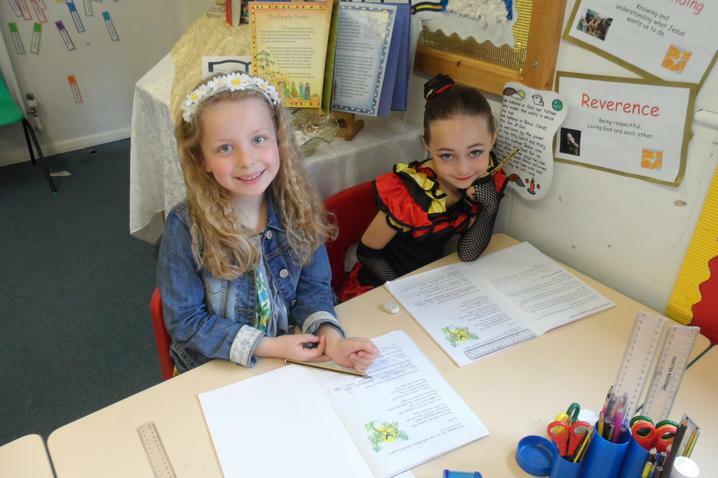 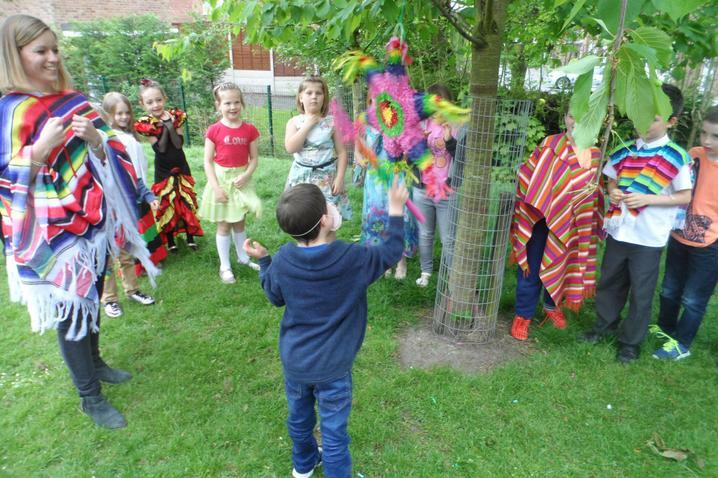 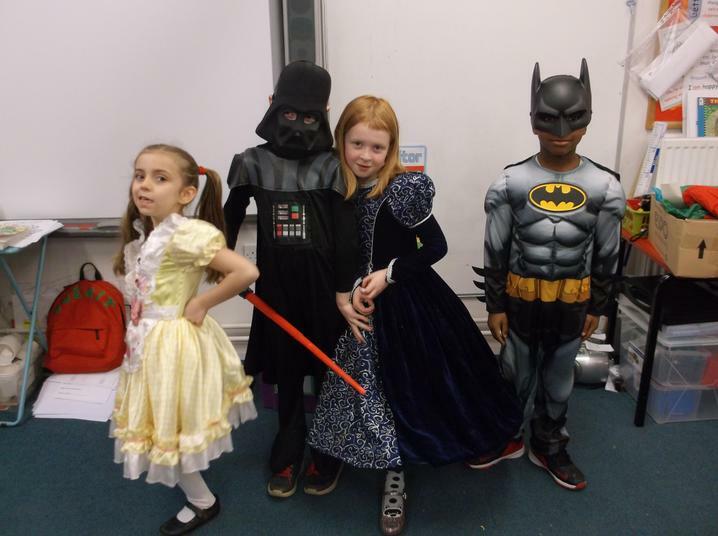 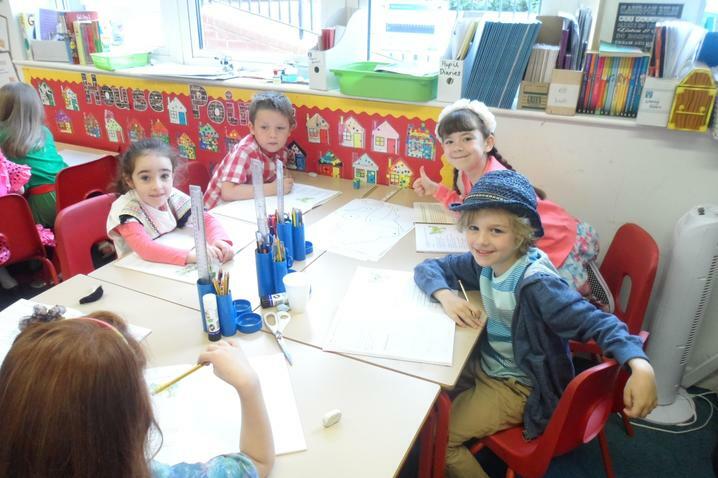 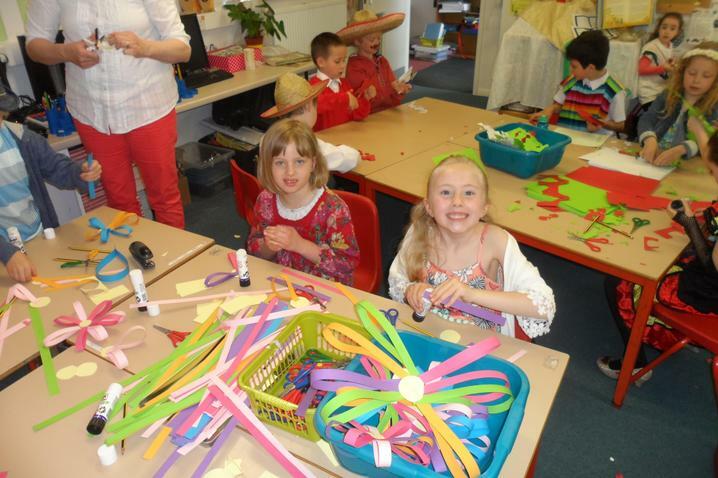 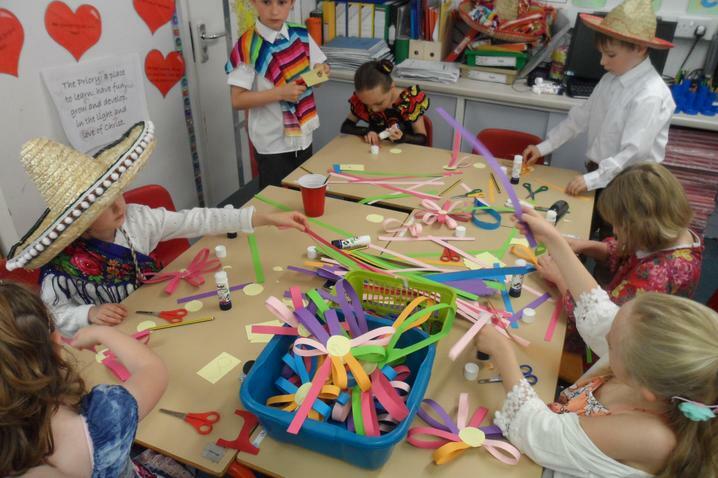 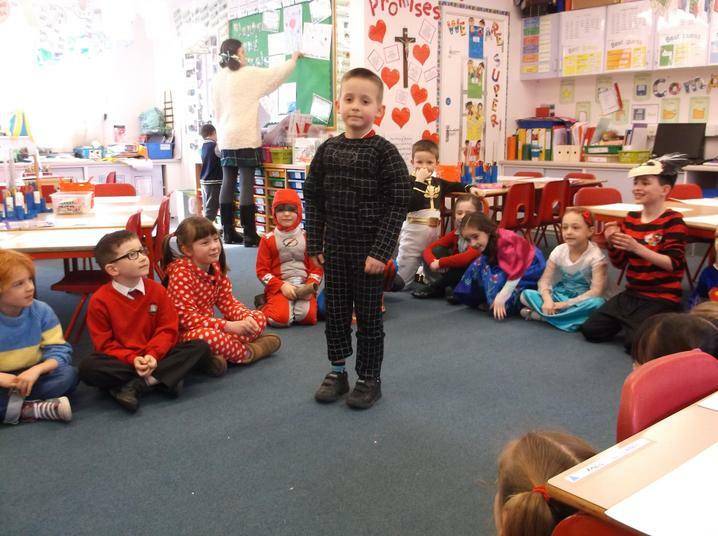 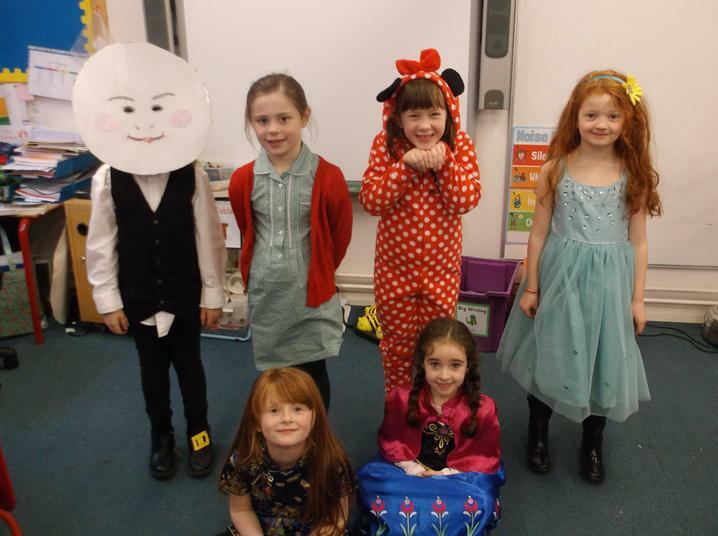 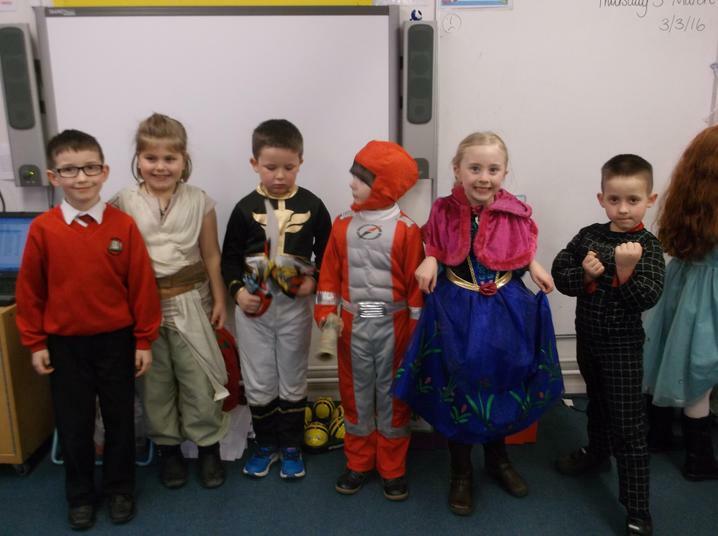 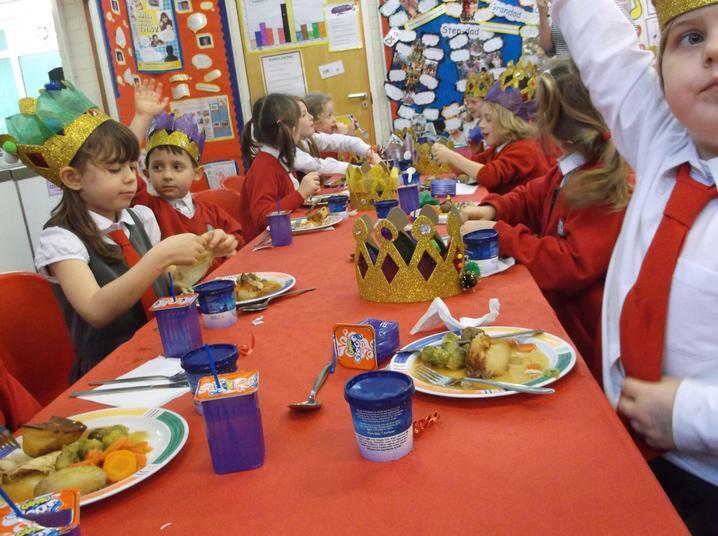 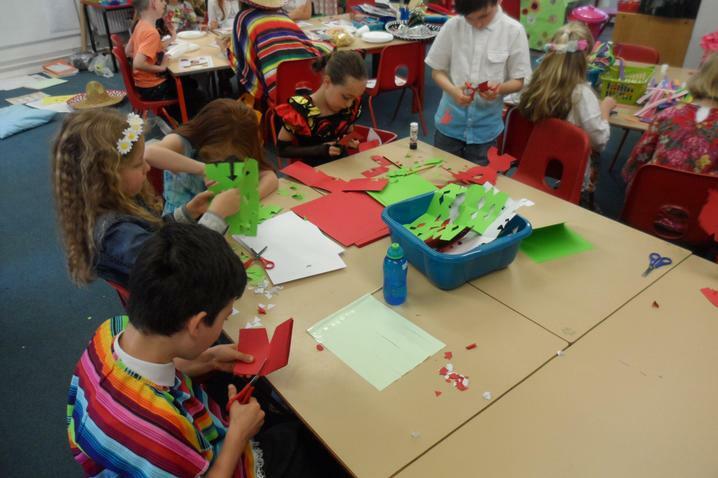 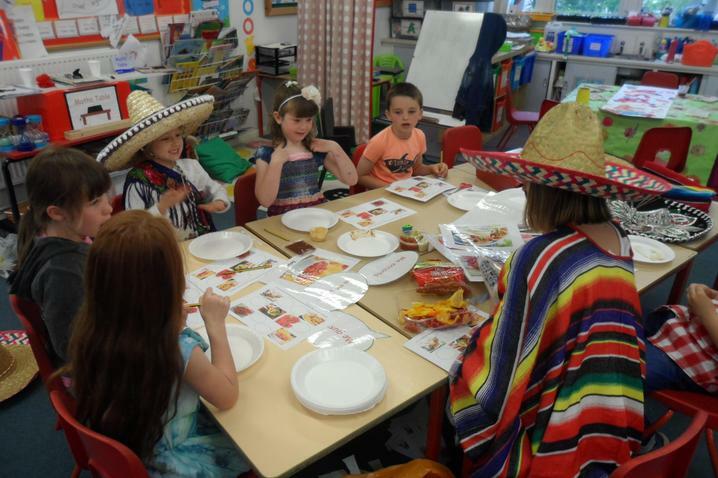 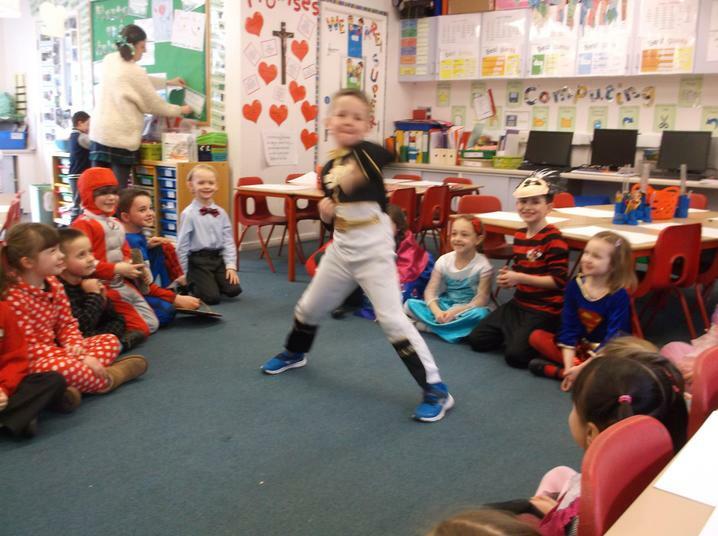 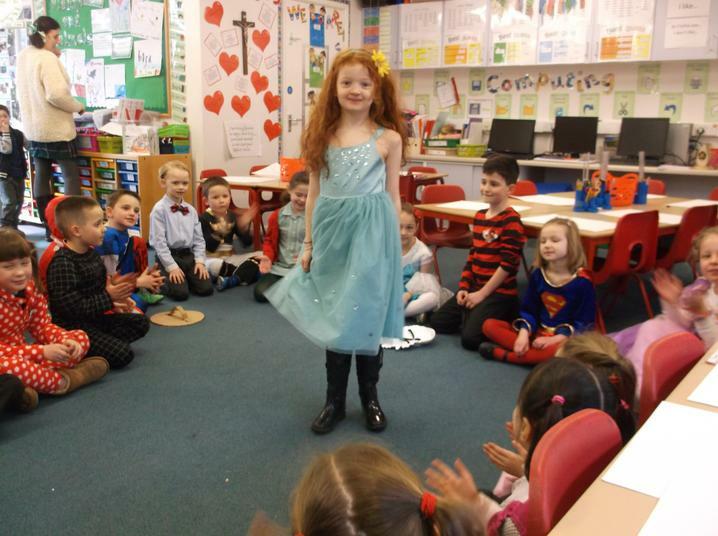 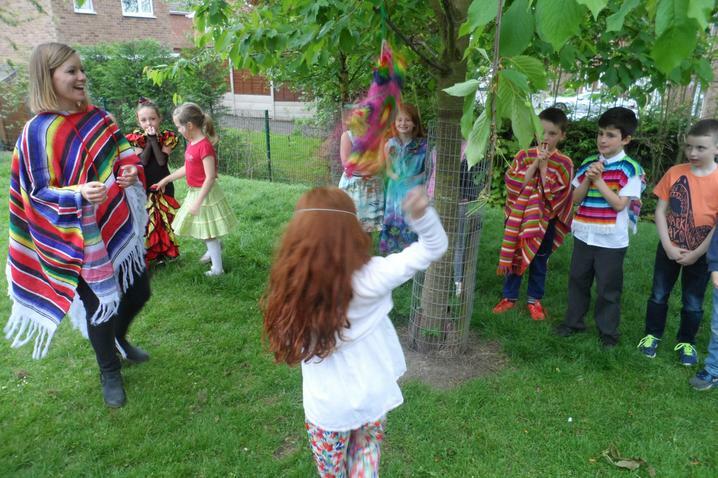 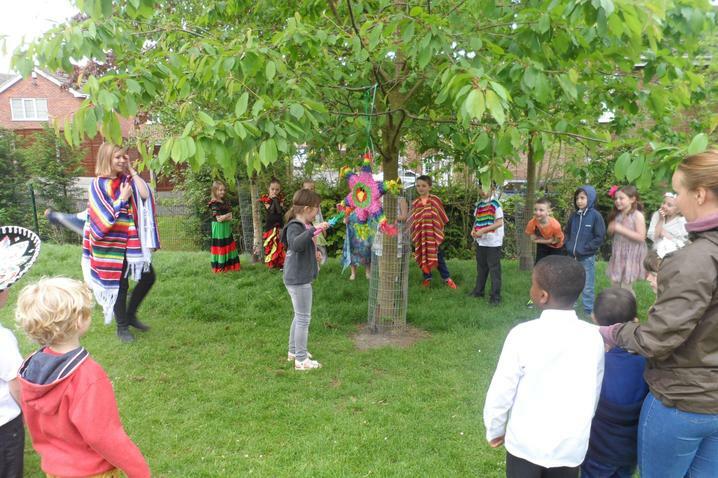 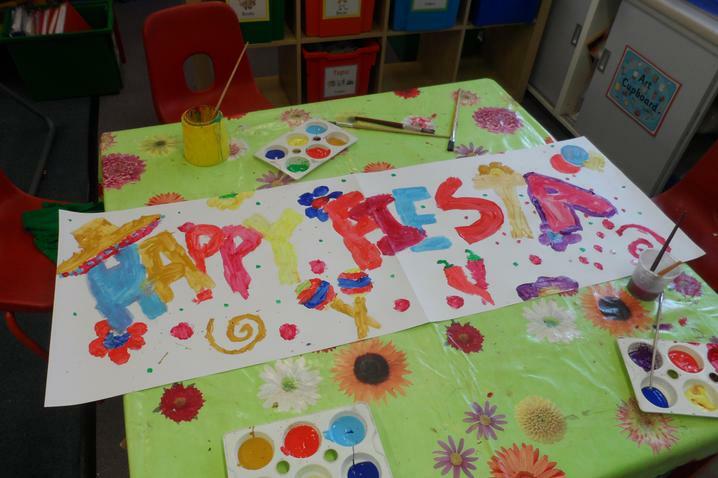 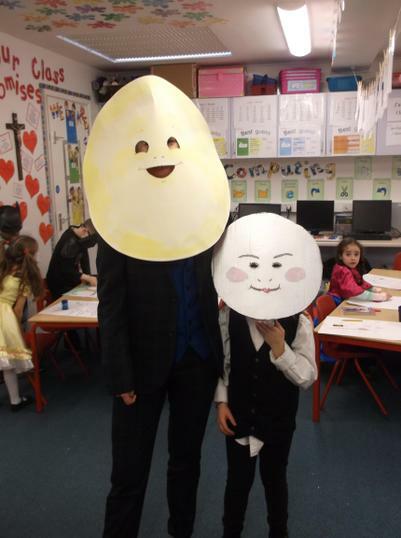 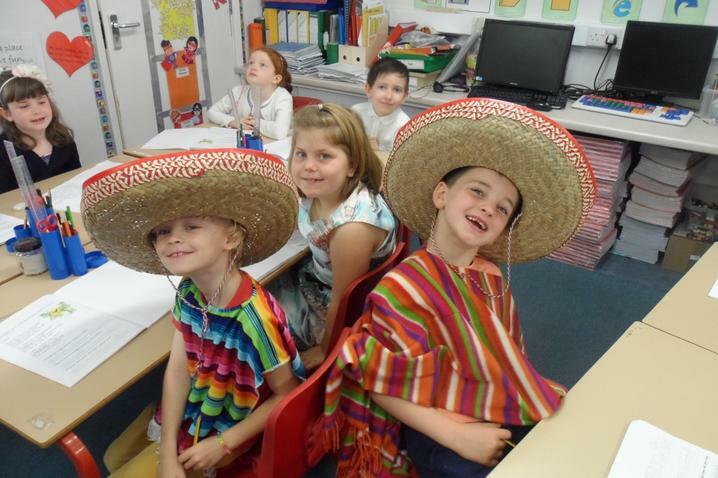 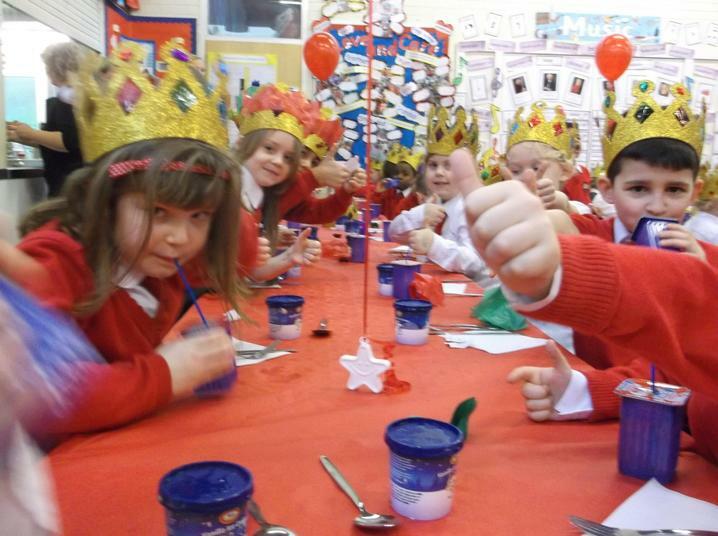 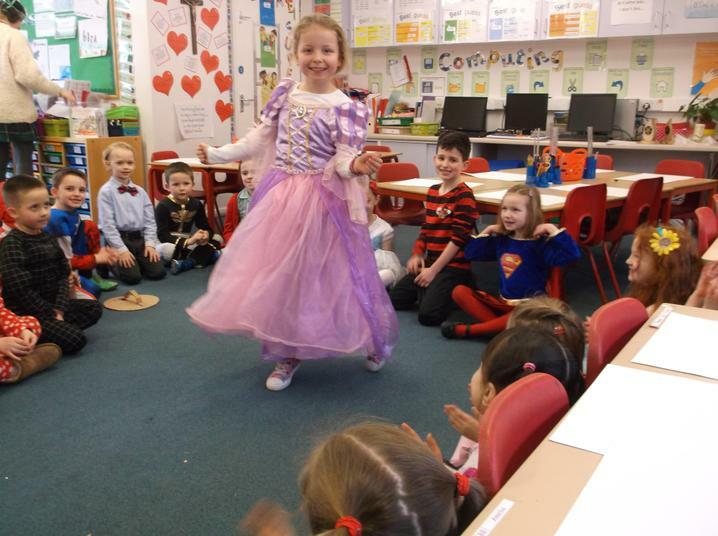 World Book Day Costumes - well done everyone! 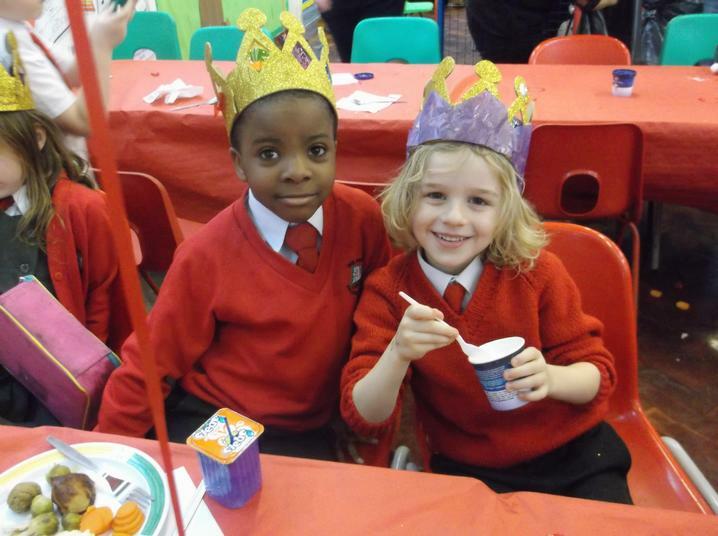 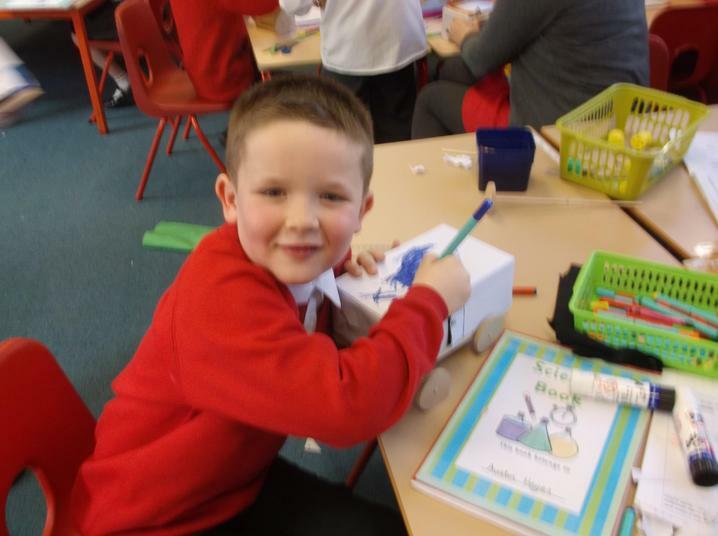 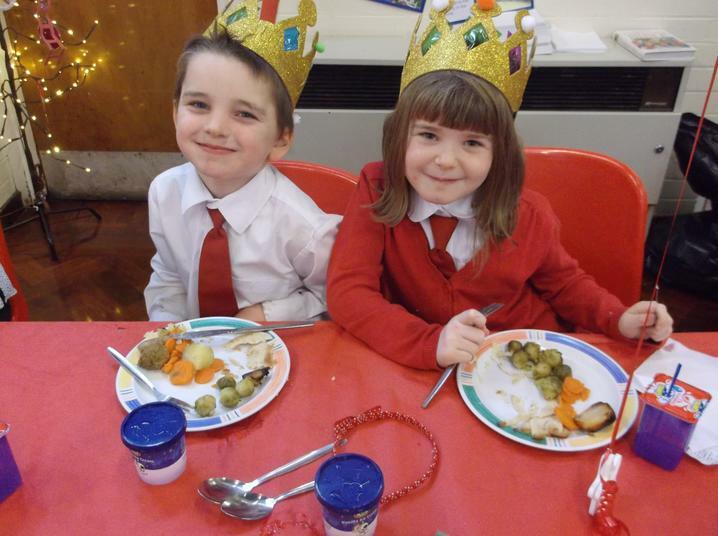 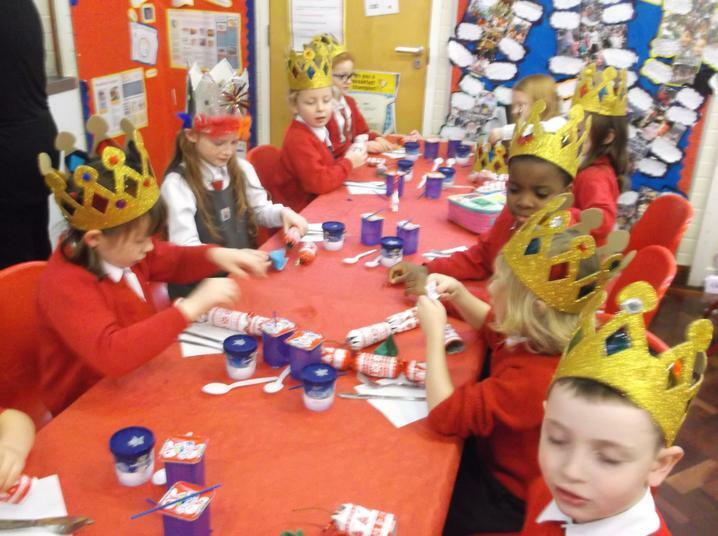 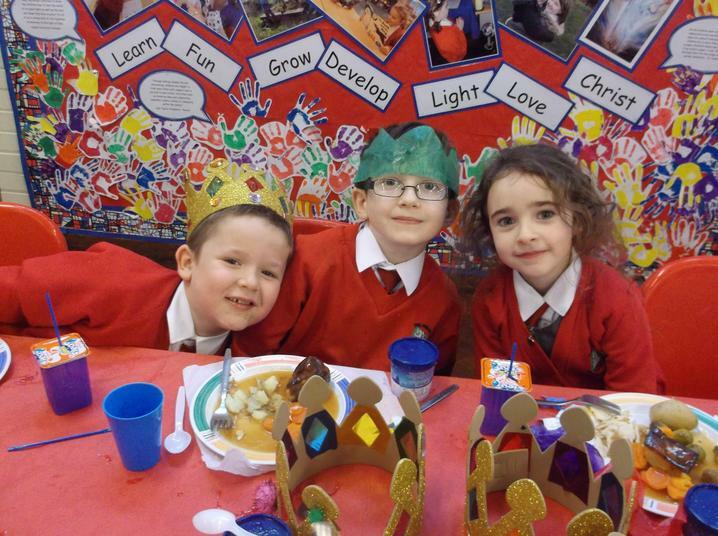 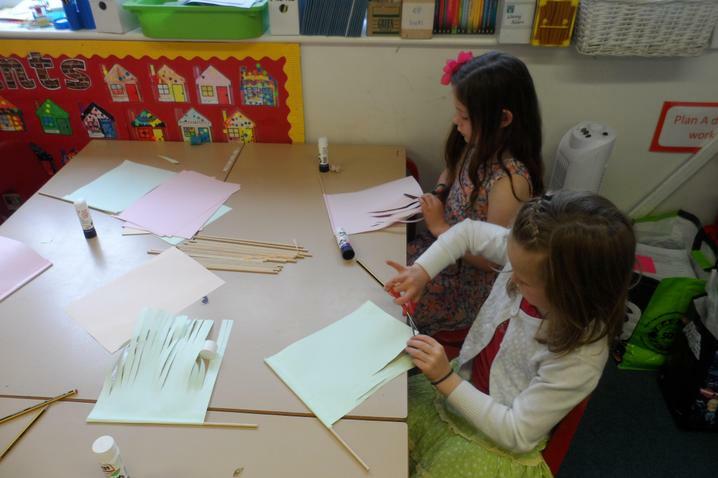 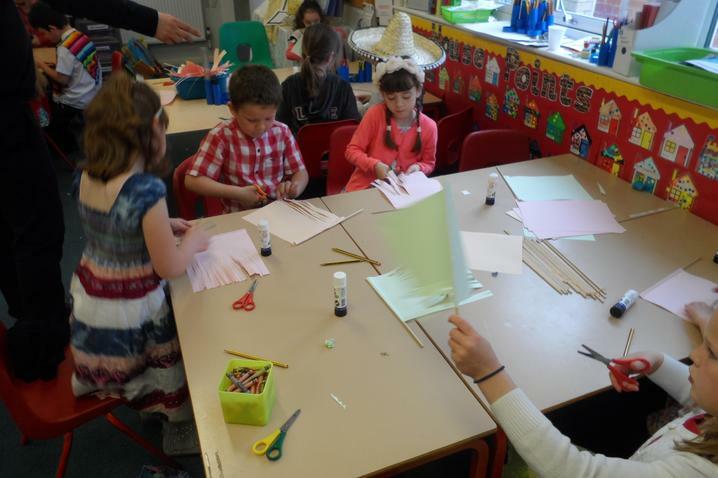 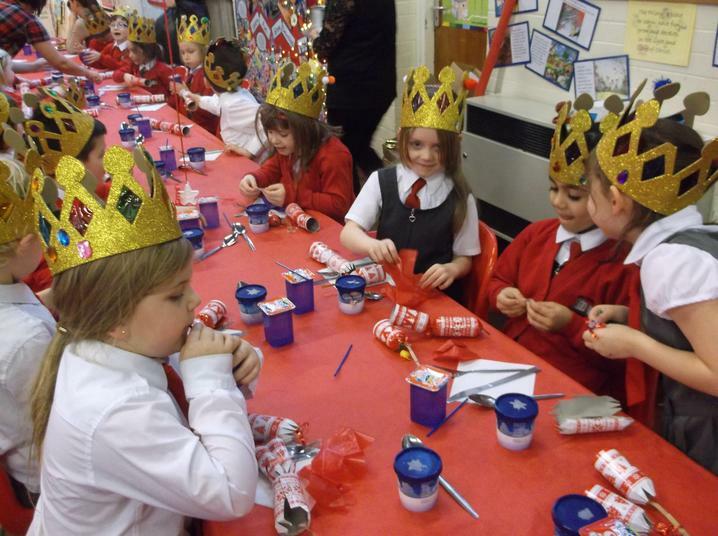 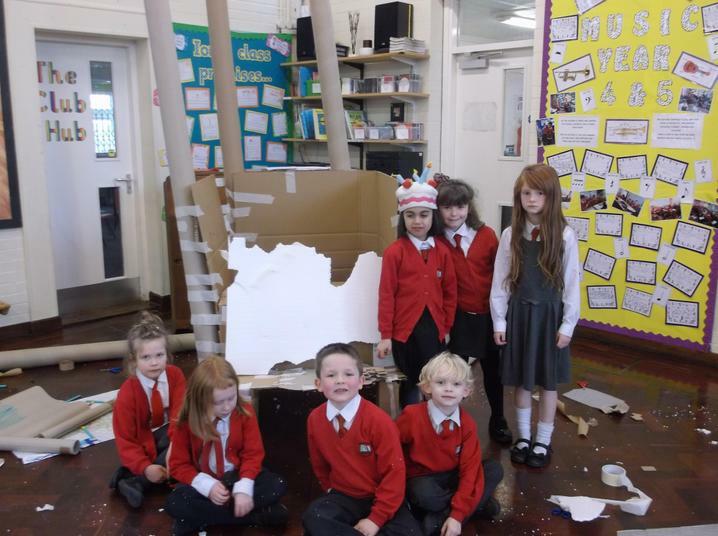 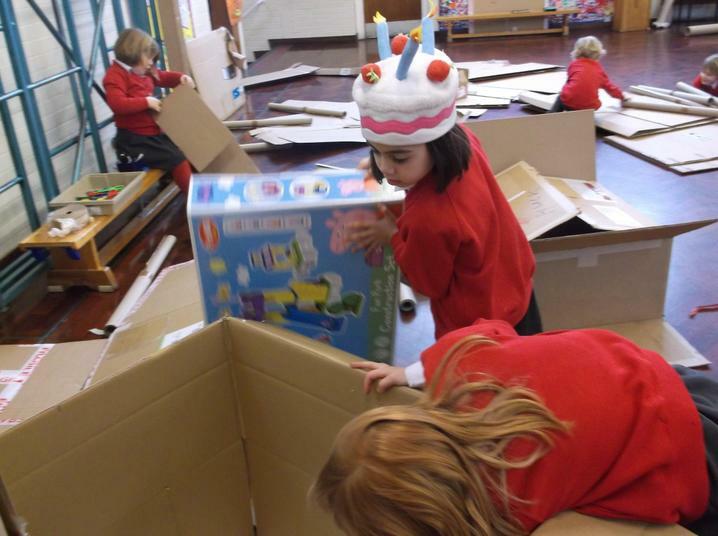 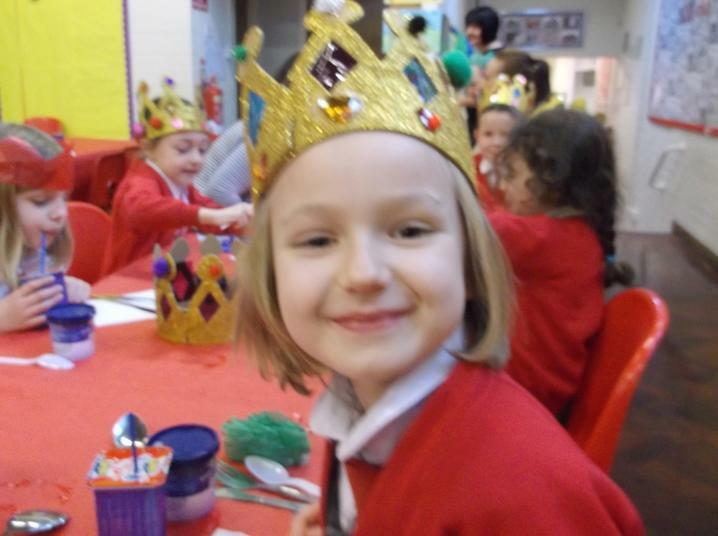 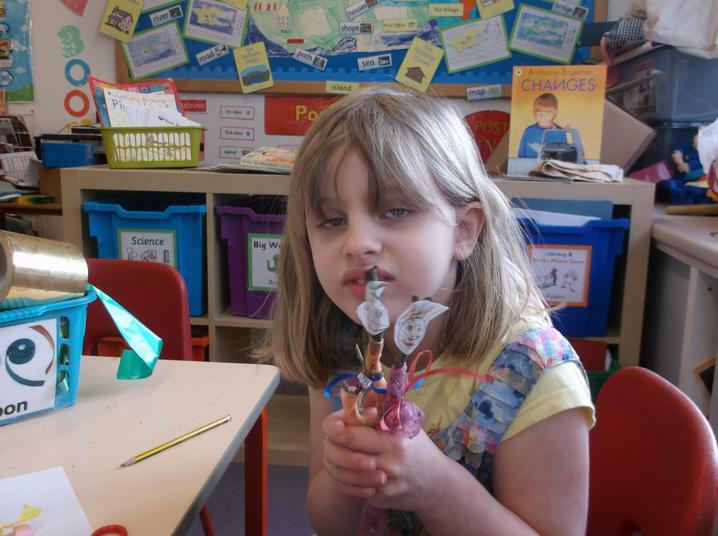 We had such fun designing and constructing our own castles using junk materials! 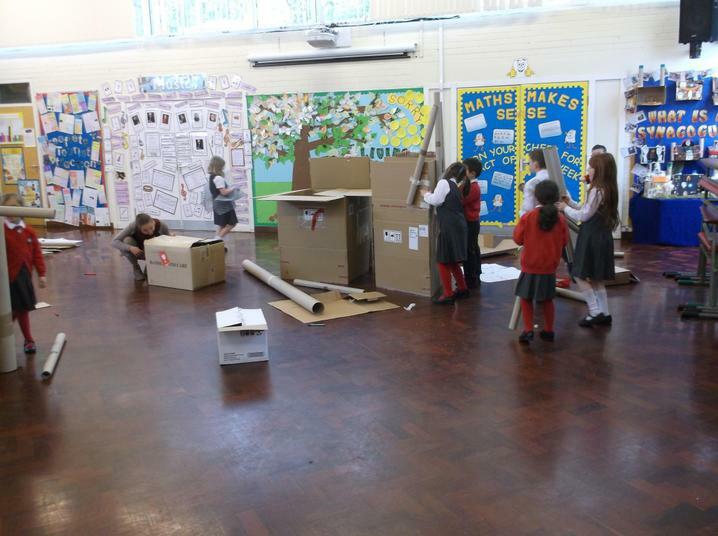 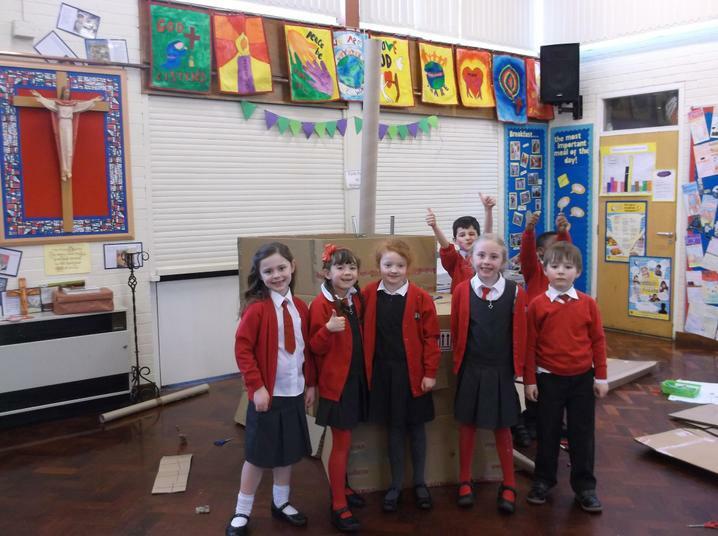 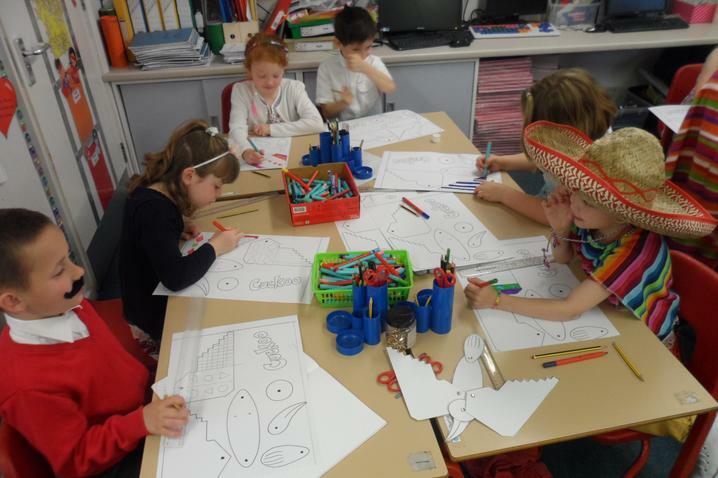 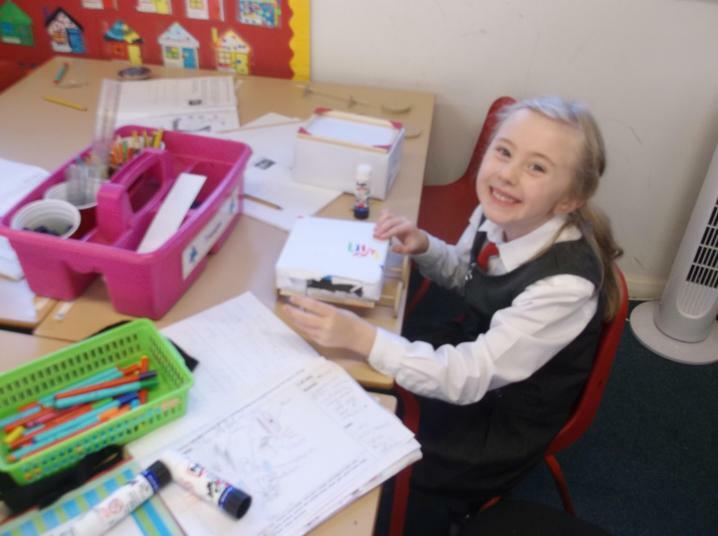 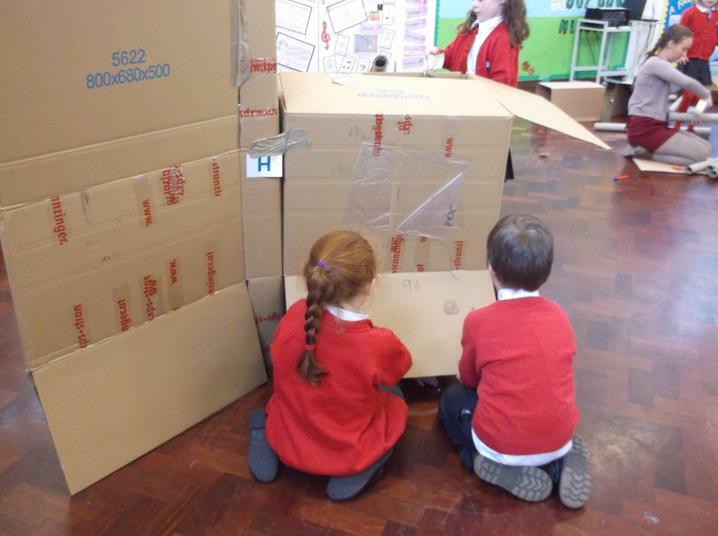 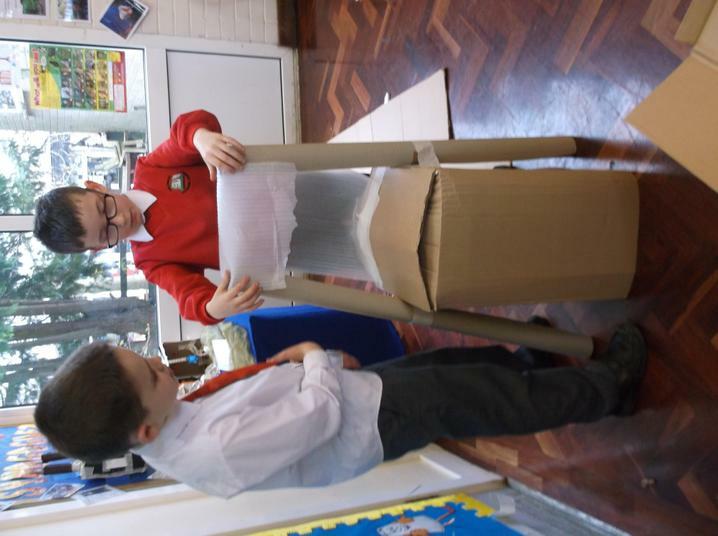 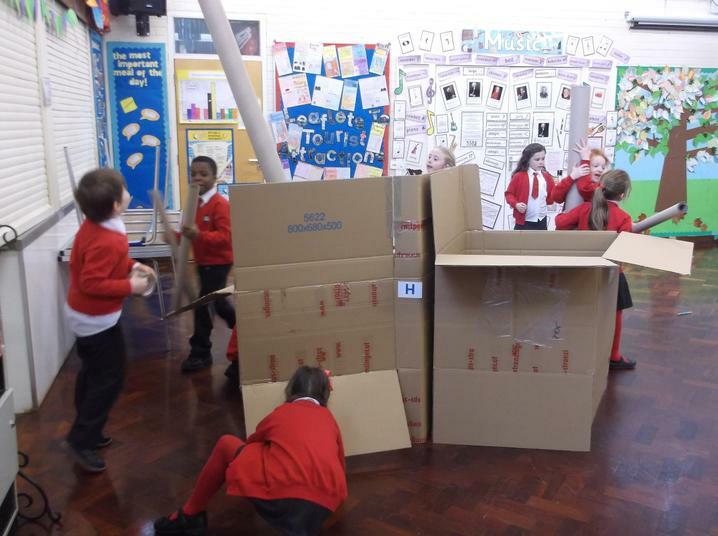 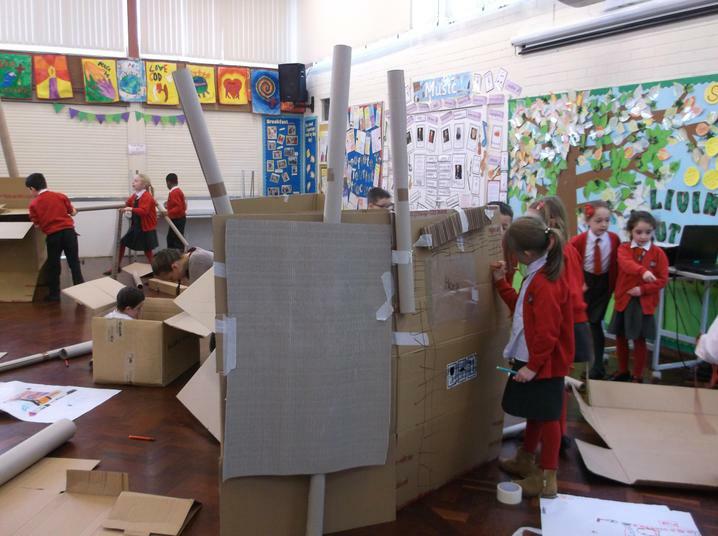 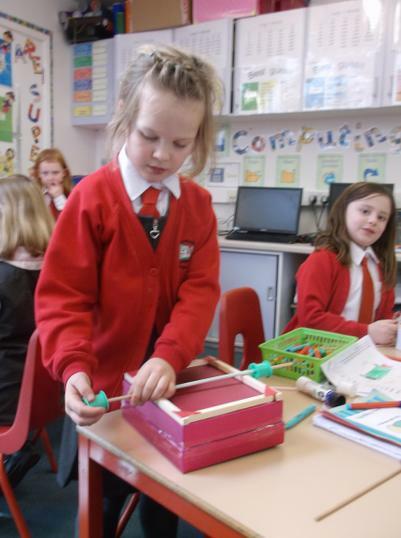 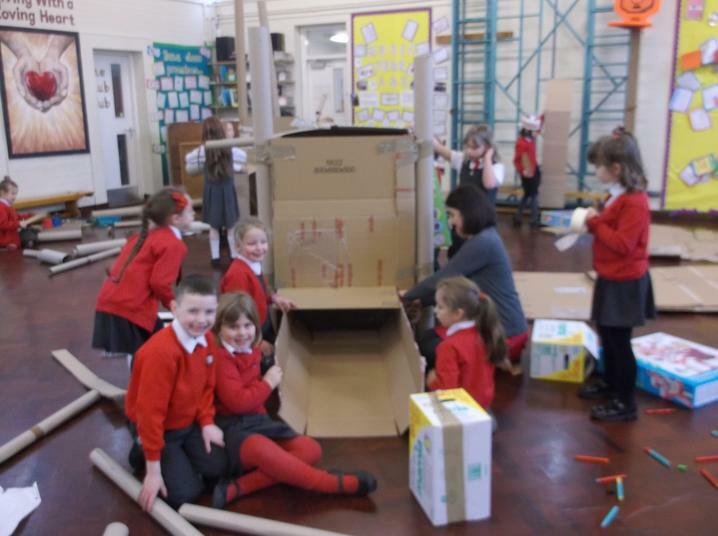 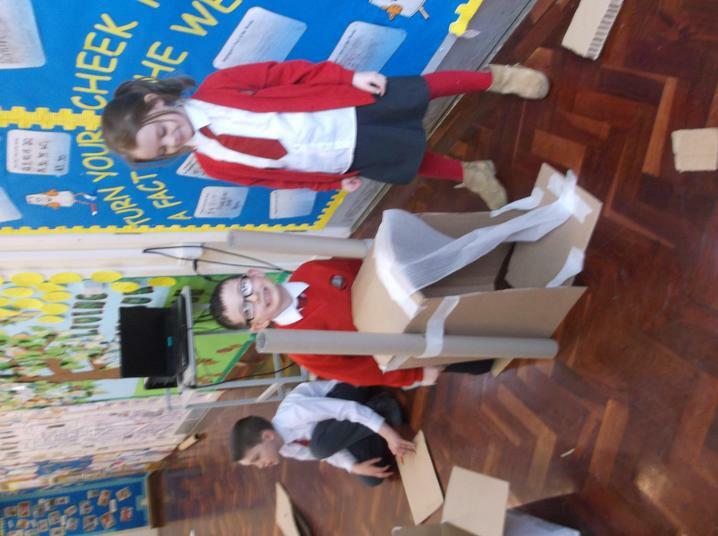 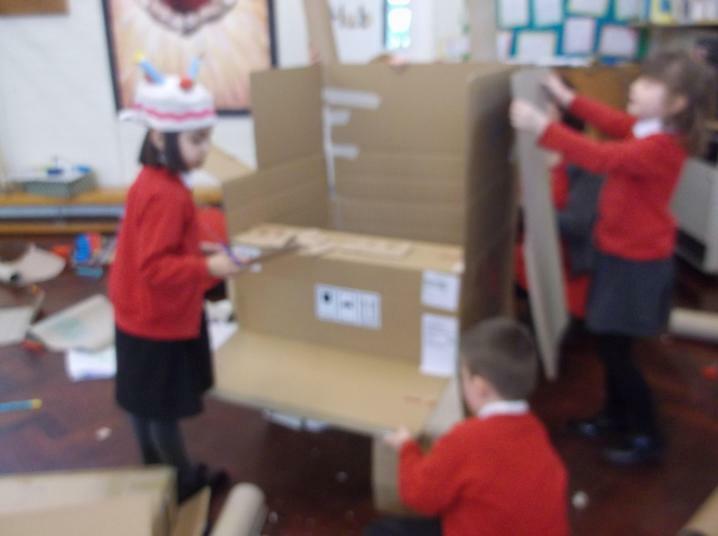 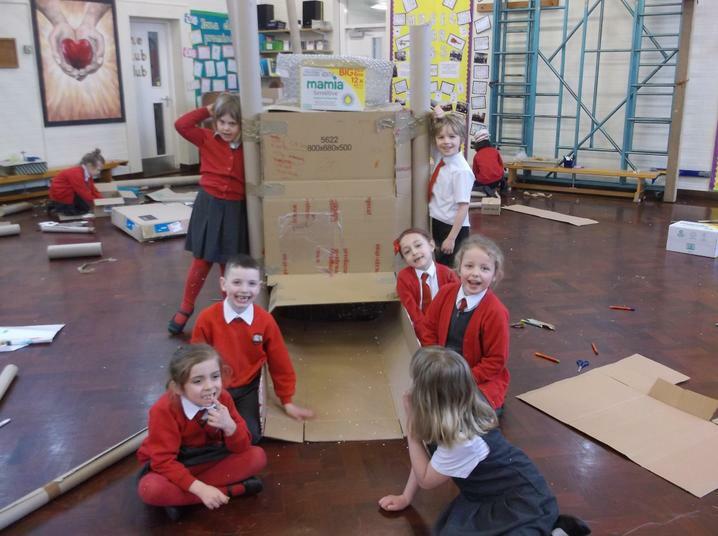 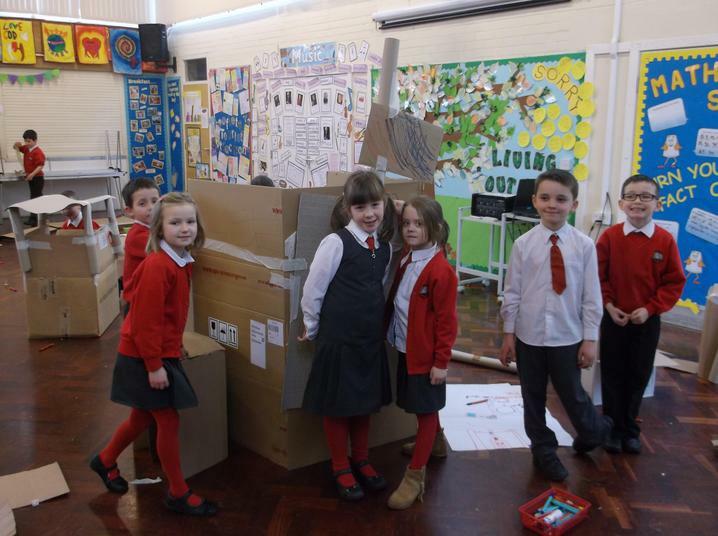 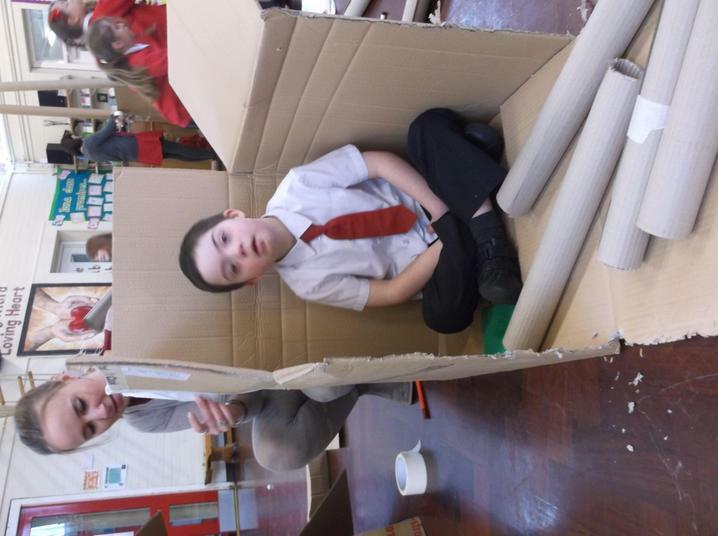 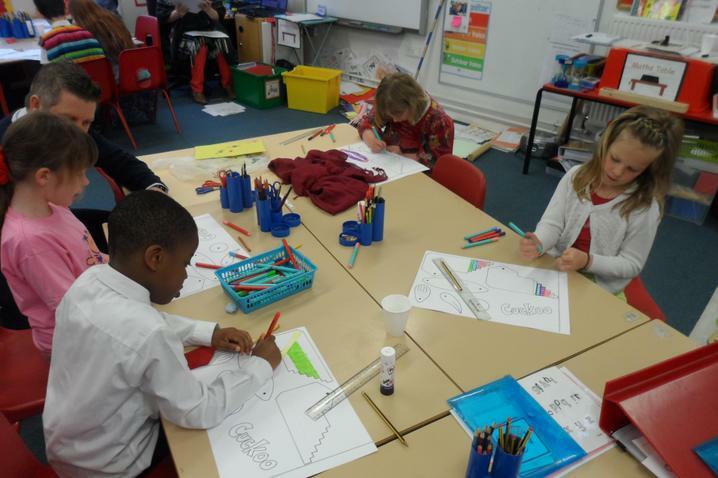 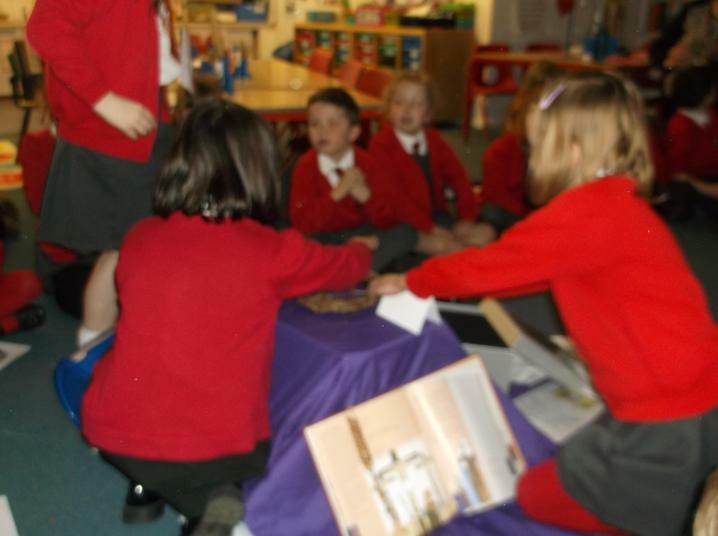 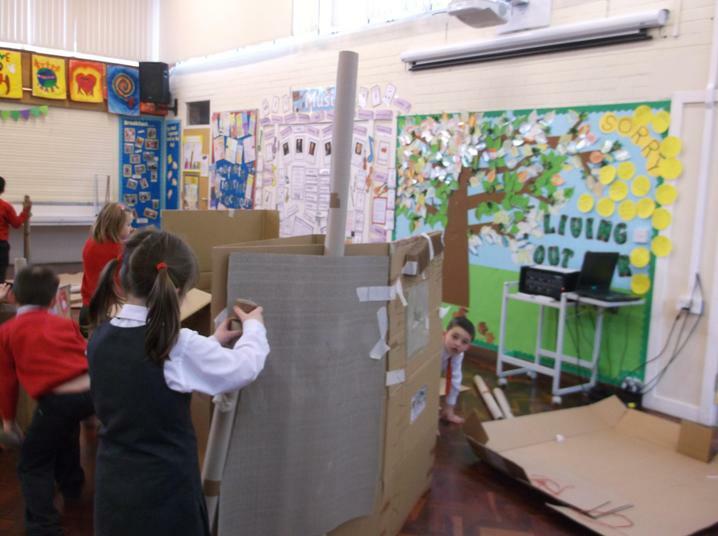 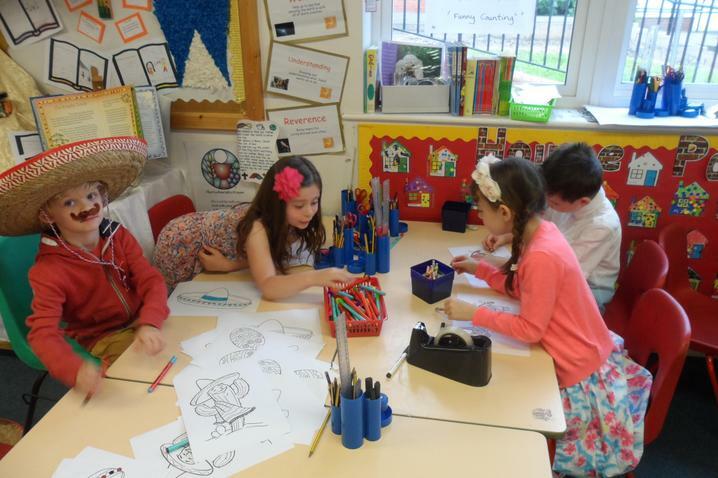 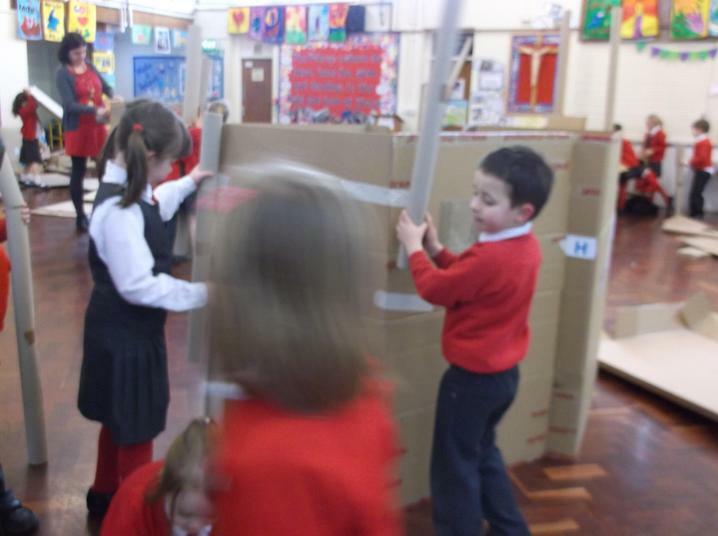 We used our knowledge of castle parts to help us in our designs and undertook some great teamwork! 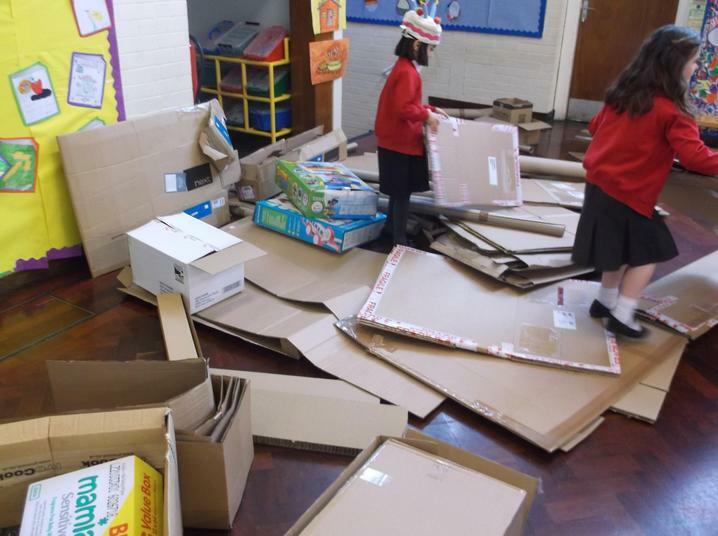 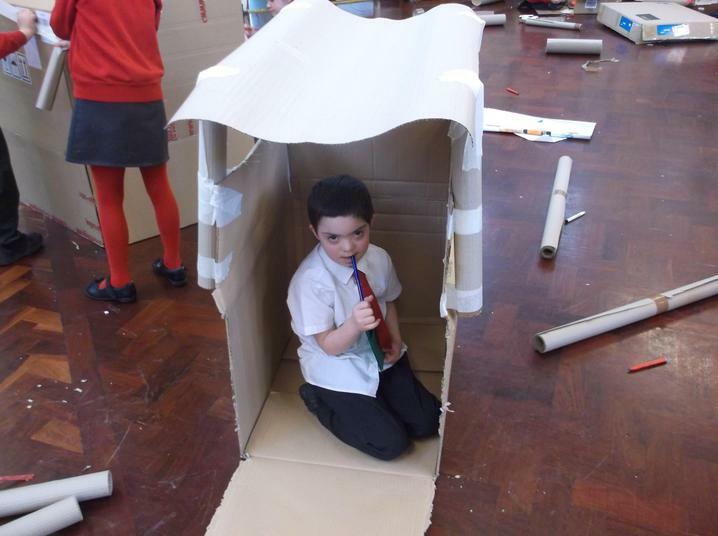 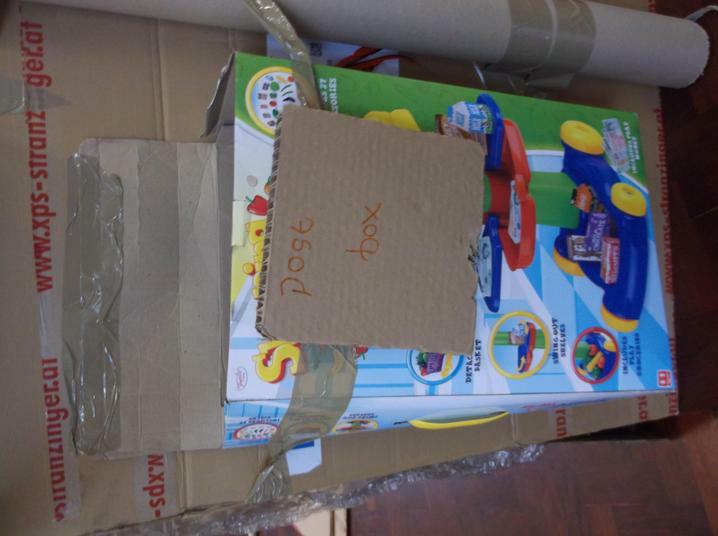 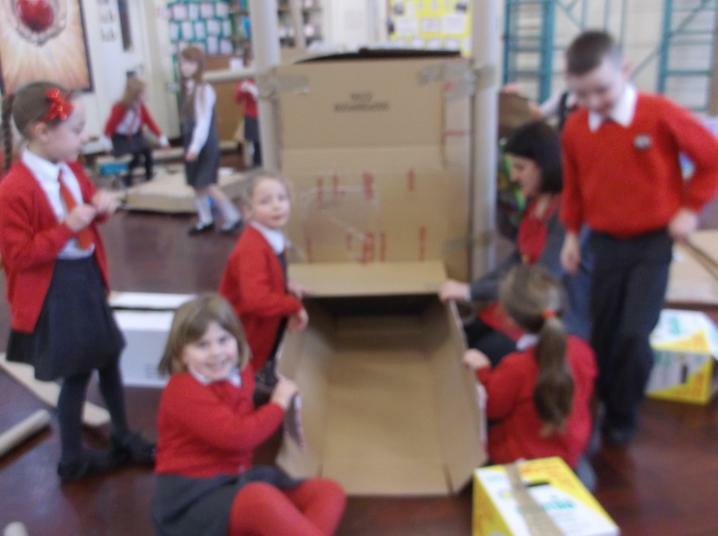 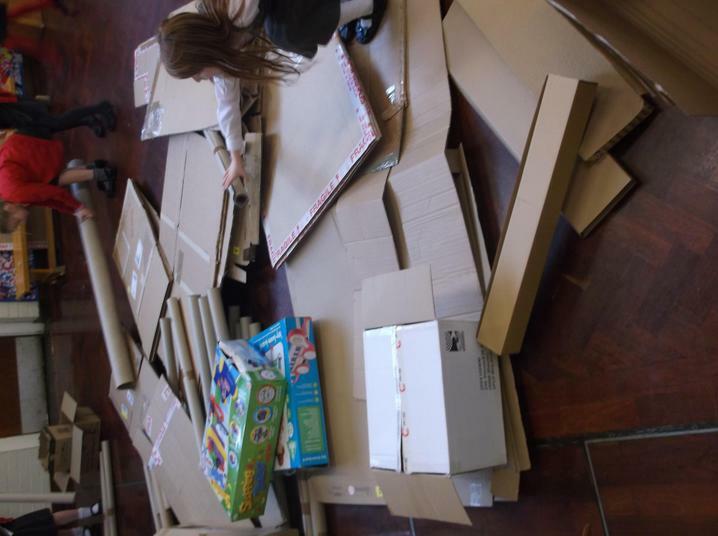 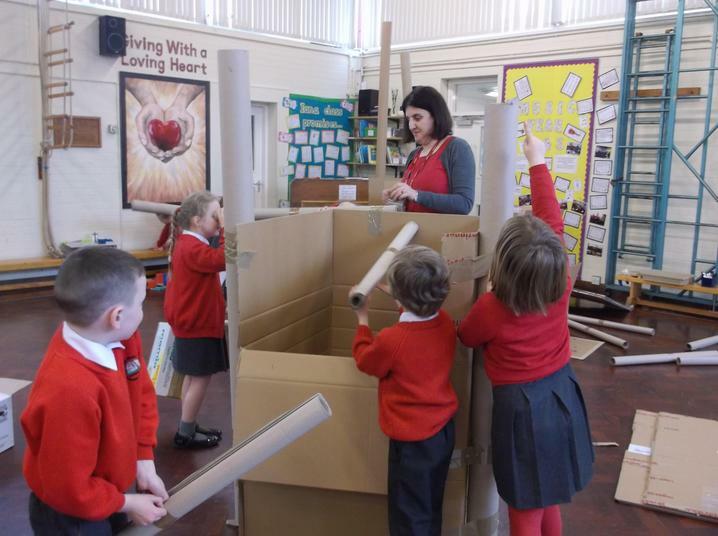 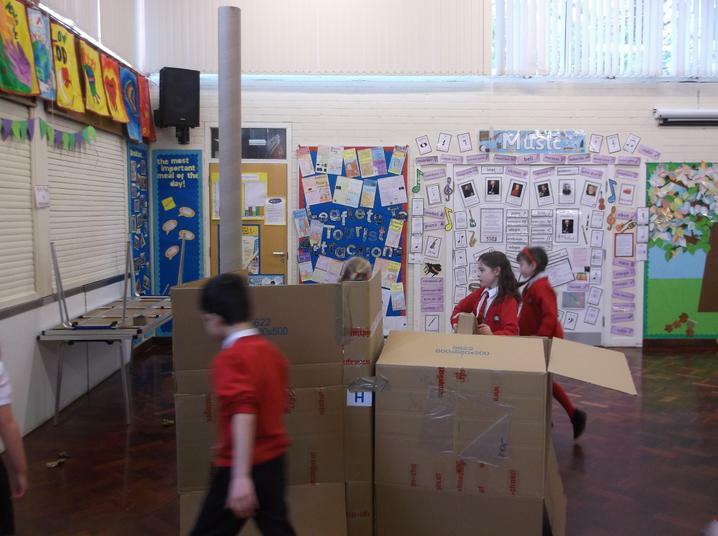 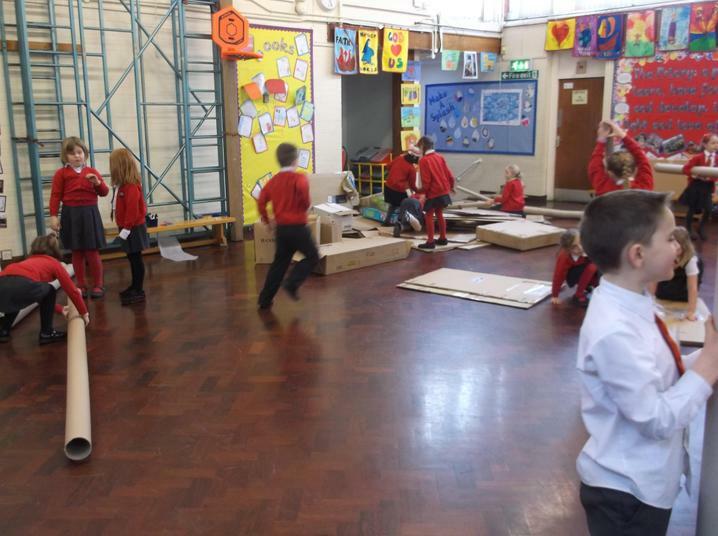 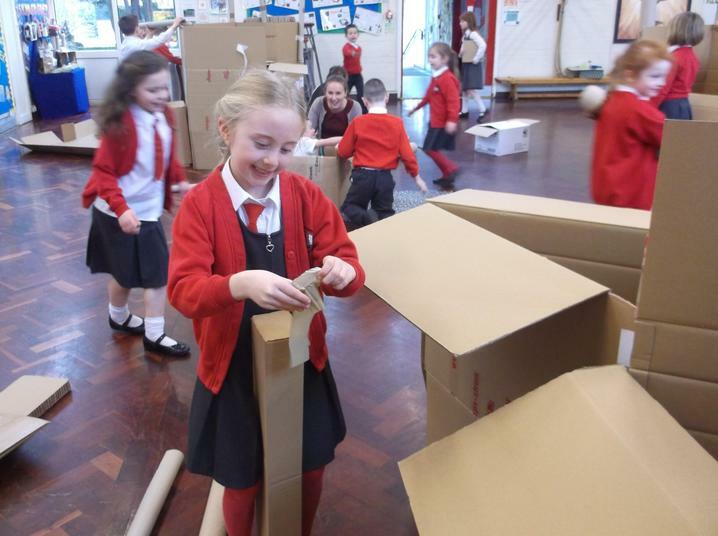 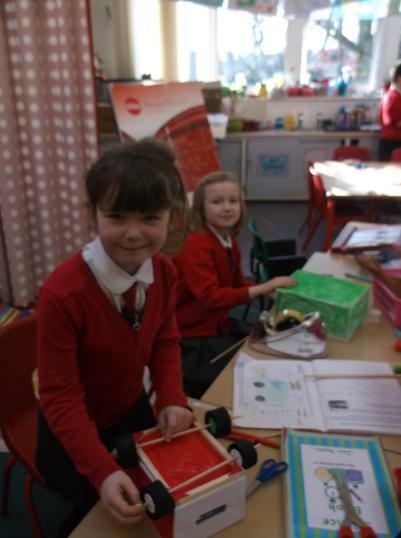 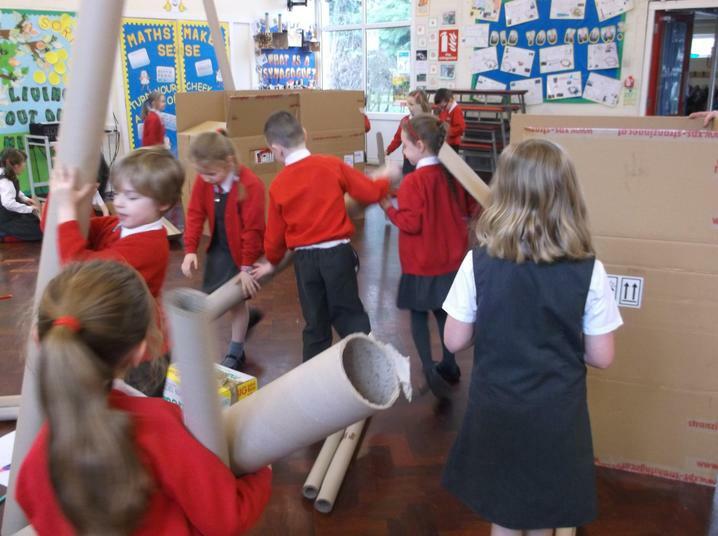 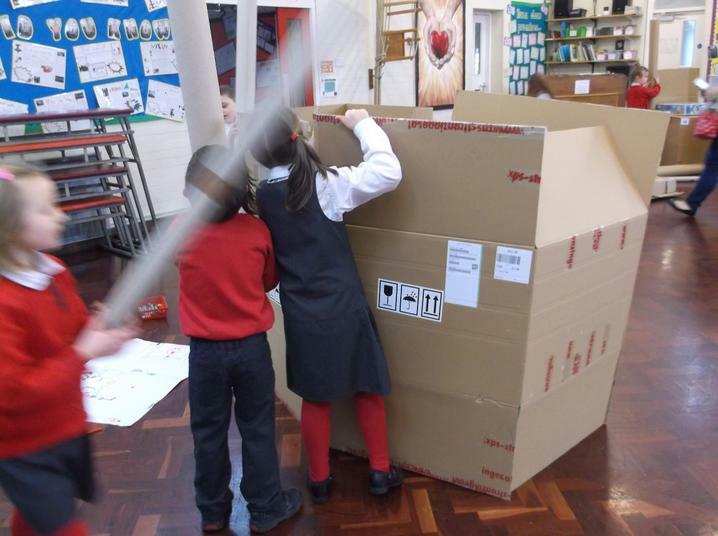 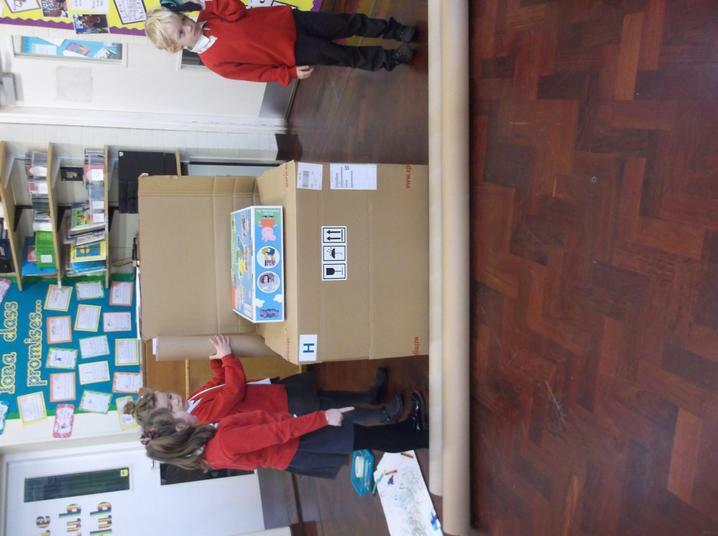 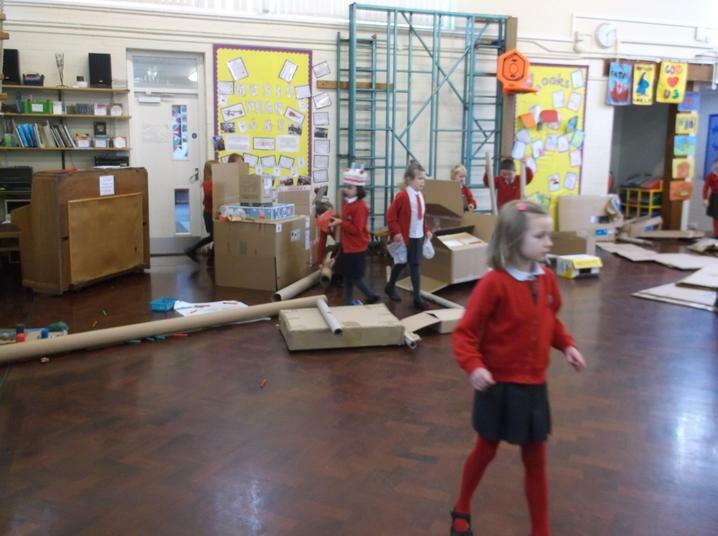 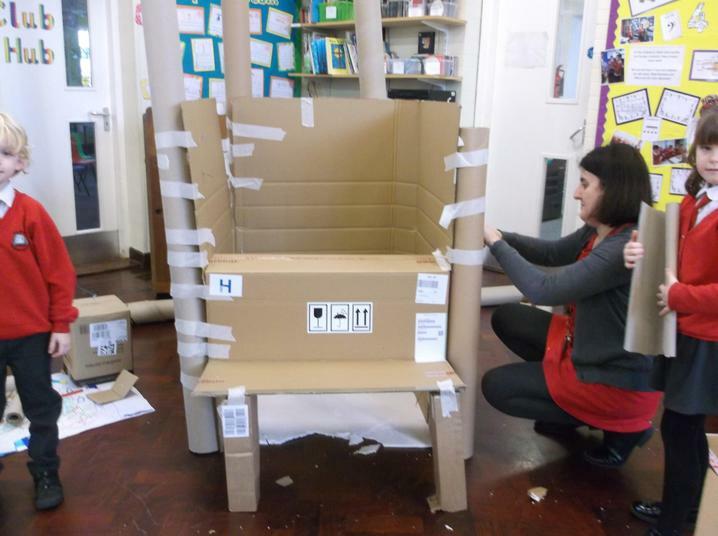 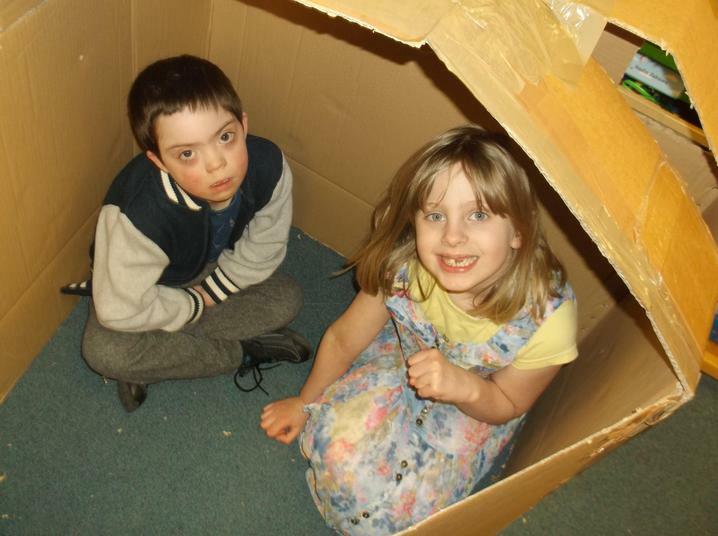 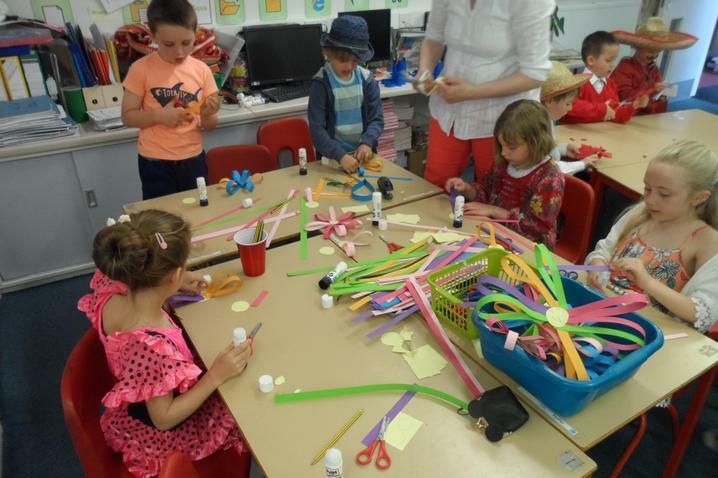 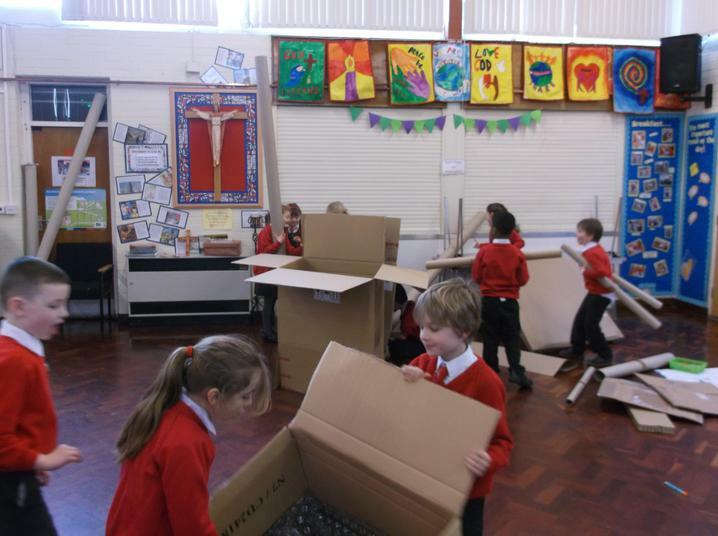 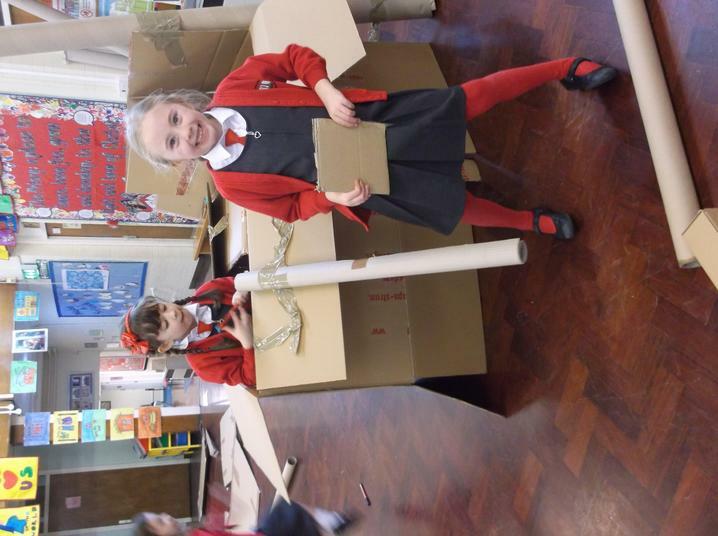 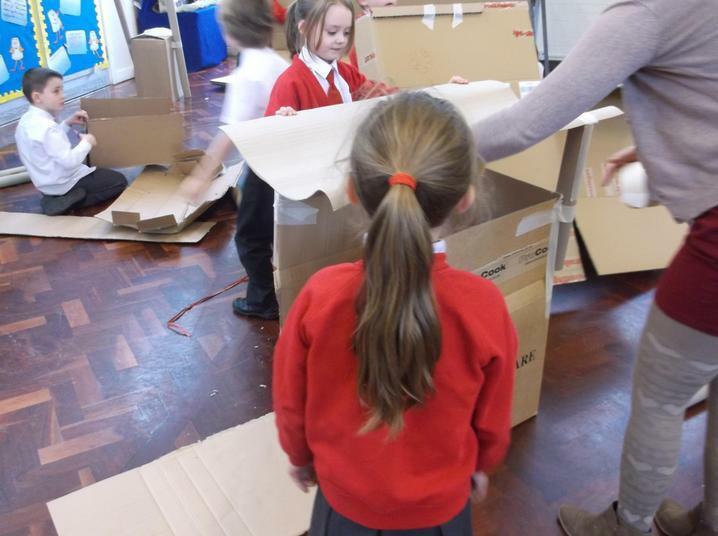 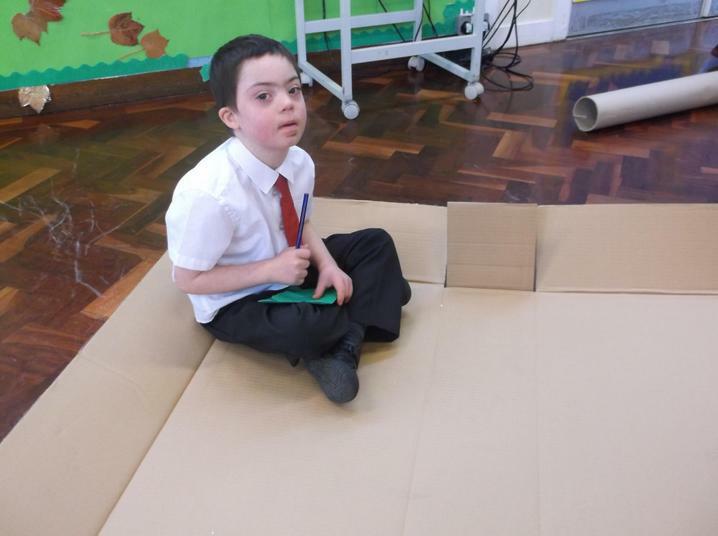 A MASSIVE thank you to Mr and Mrs Hayes for bringing in so many big boxes and tubes for us to use! 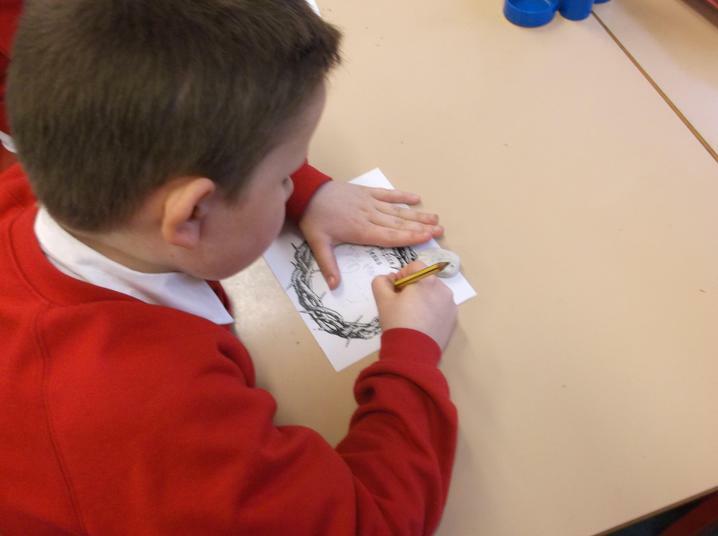 The Tunnel by Anthony Browne - text only, the pictures bring it to life!! 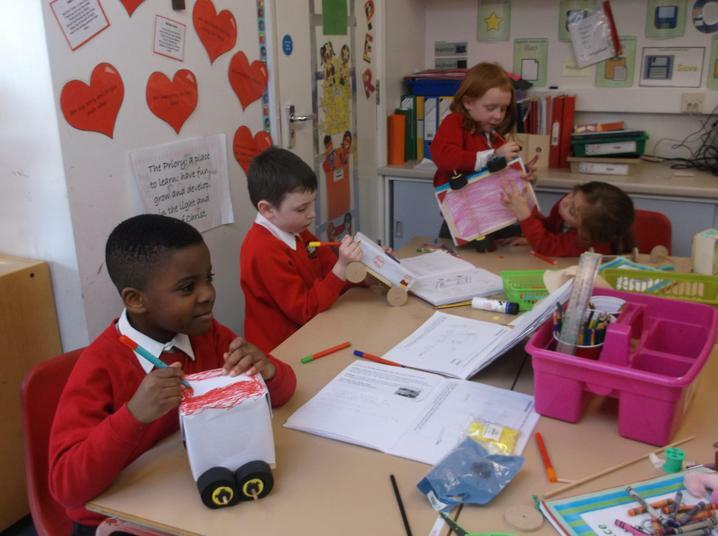 Control technology: creating and debugging programs to control a beebot! 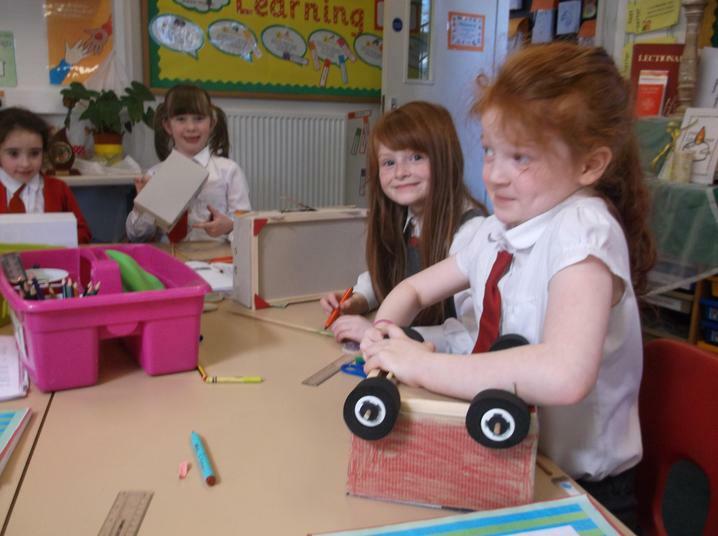 Where will toy vehicles travel the furthest? 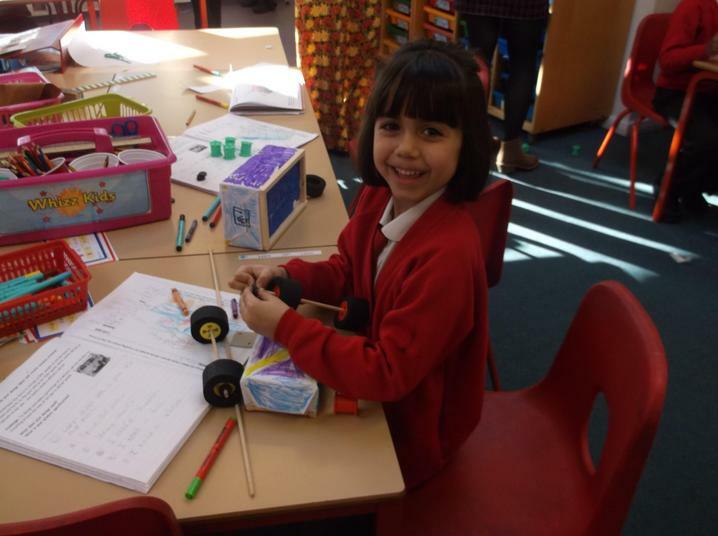 What design ideas can you get for your own model vehicle? 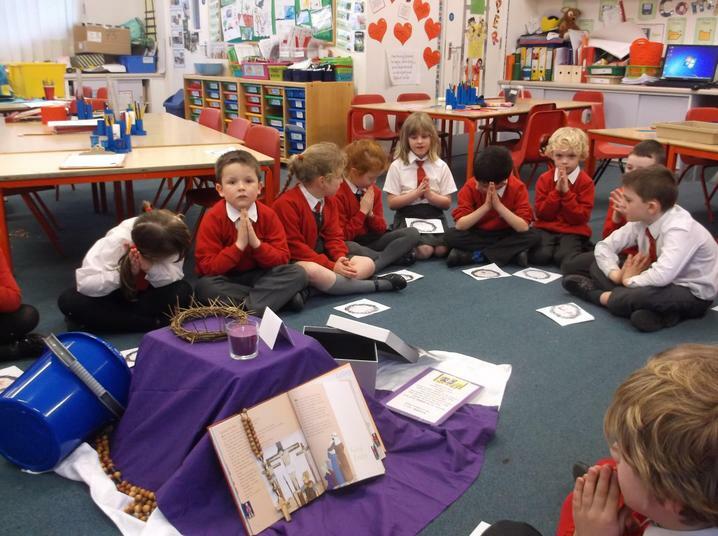 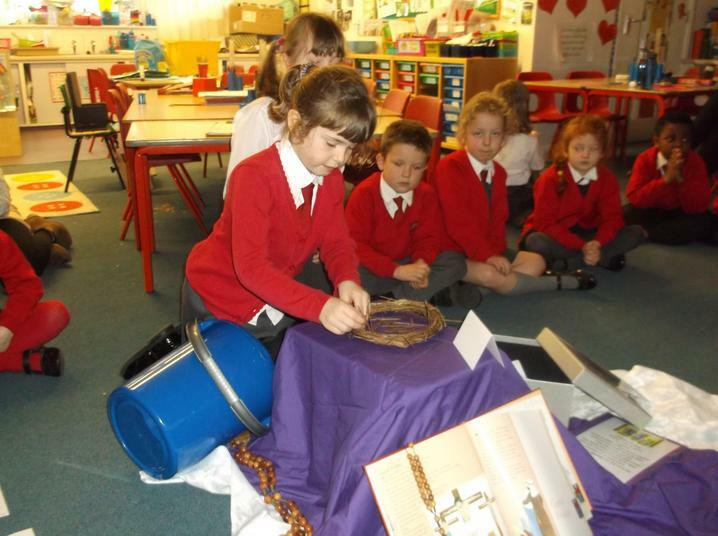 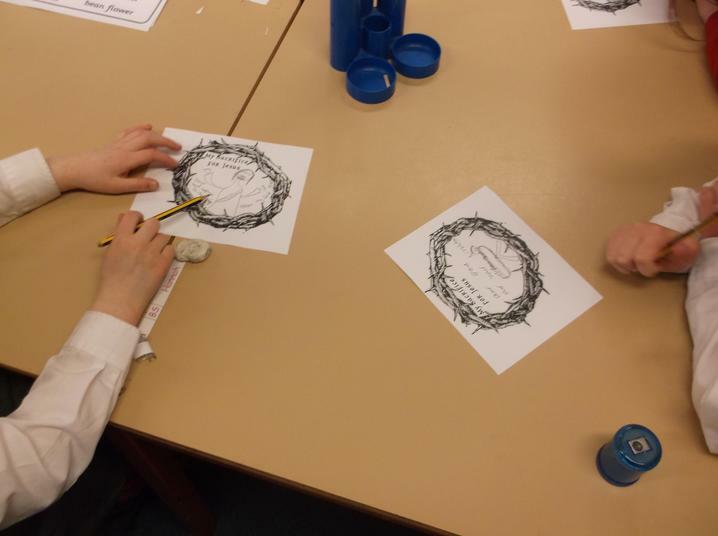 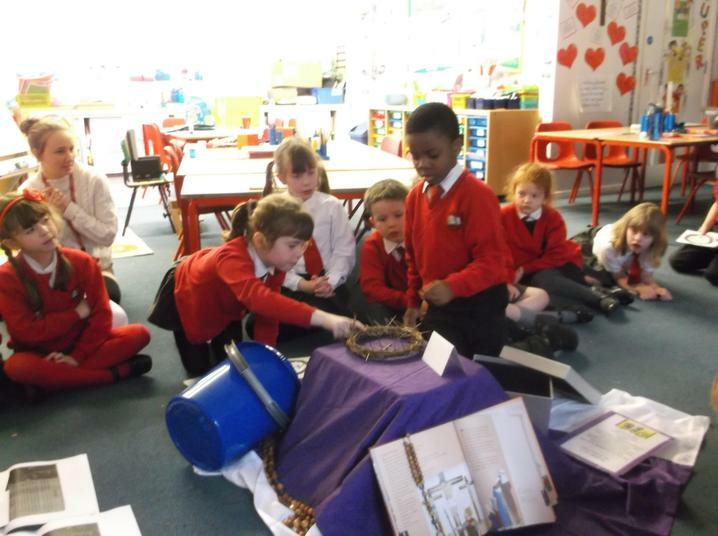 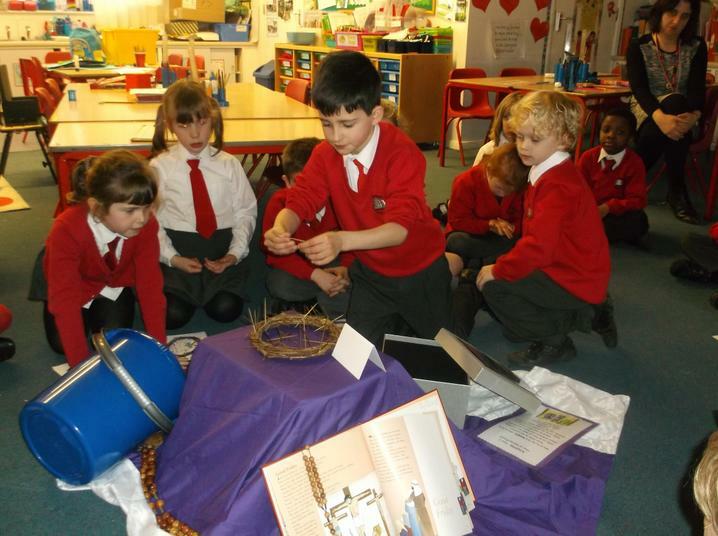 Remembering and celebrating everything we have learned about 'Signs and Symbols of Baptism'. 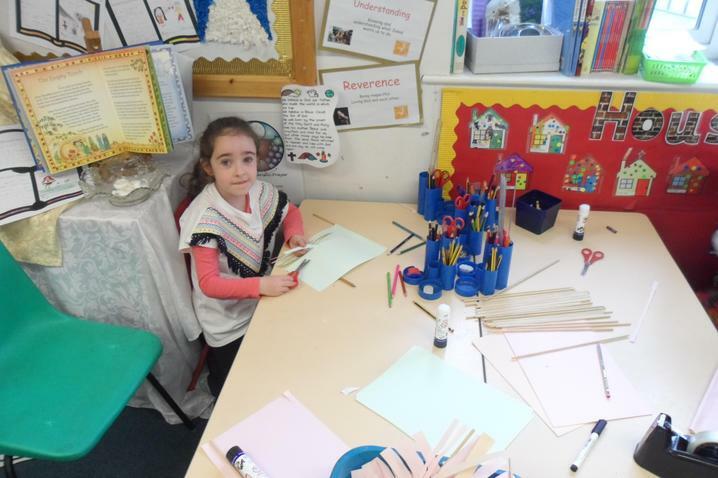 Look at our class displays. 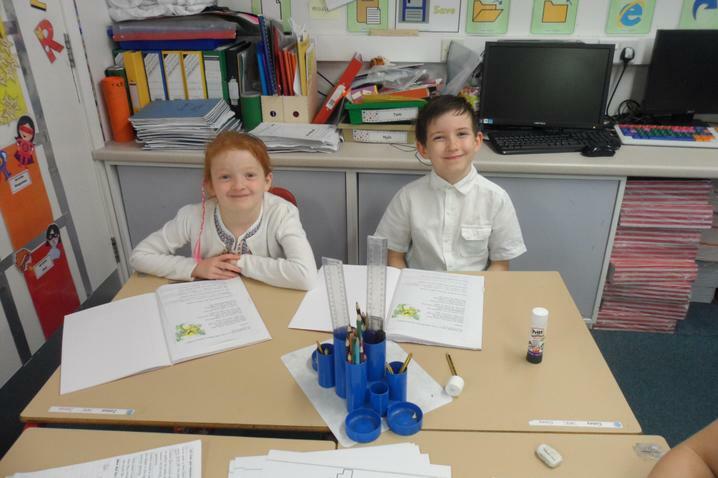 Questions and key words about our science topic. 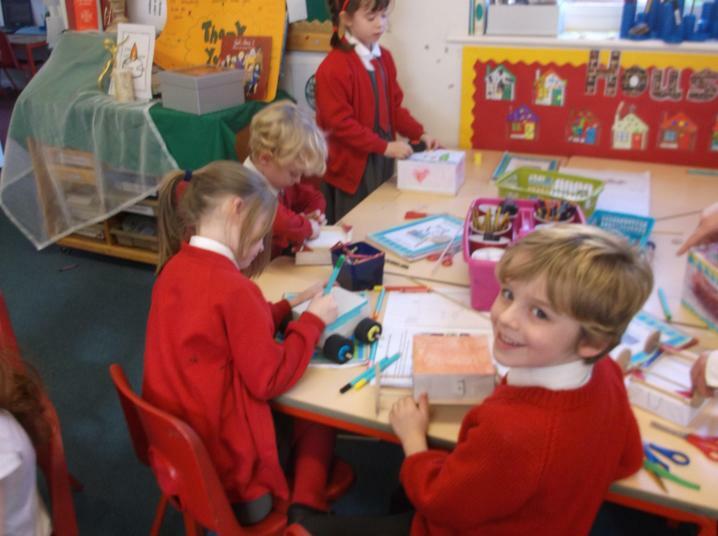 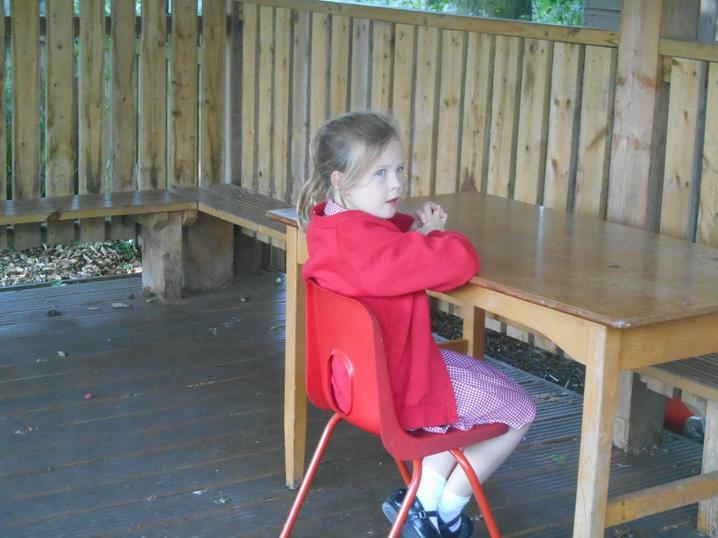 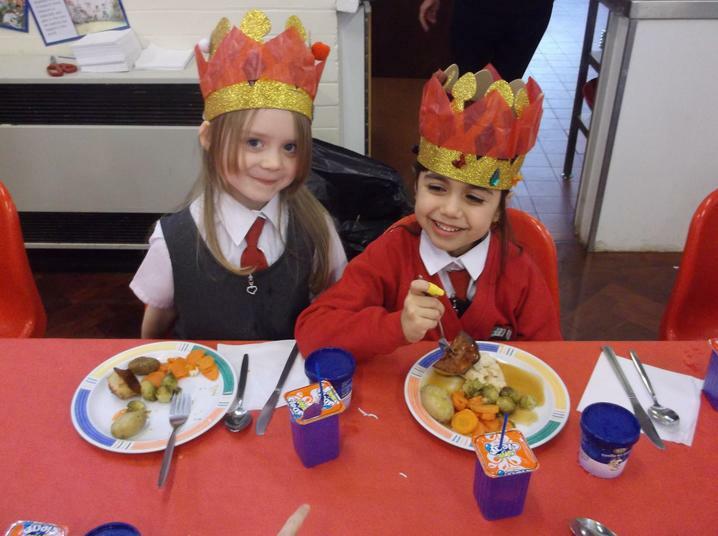 WE CARE ABOUT LEARNING What enables you to learn? 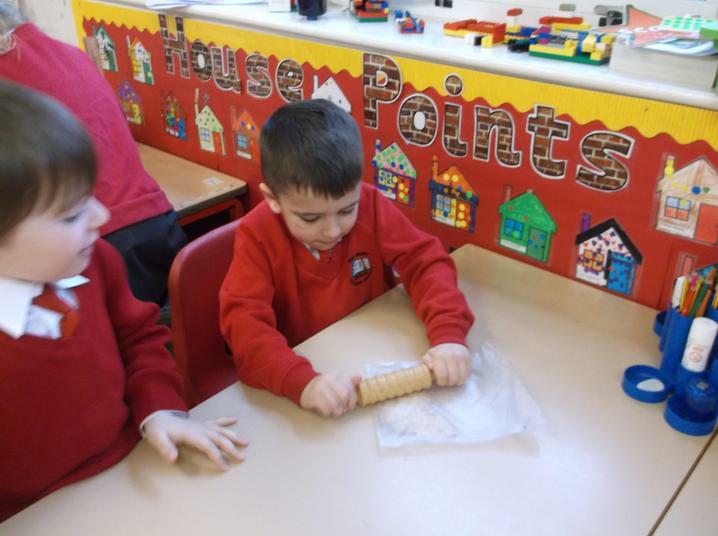 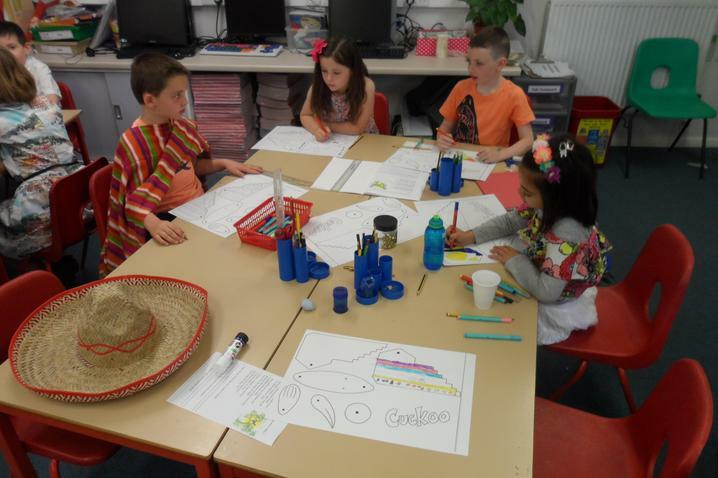 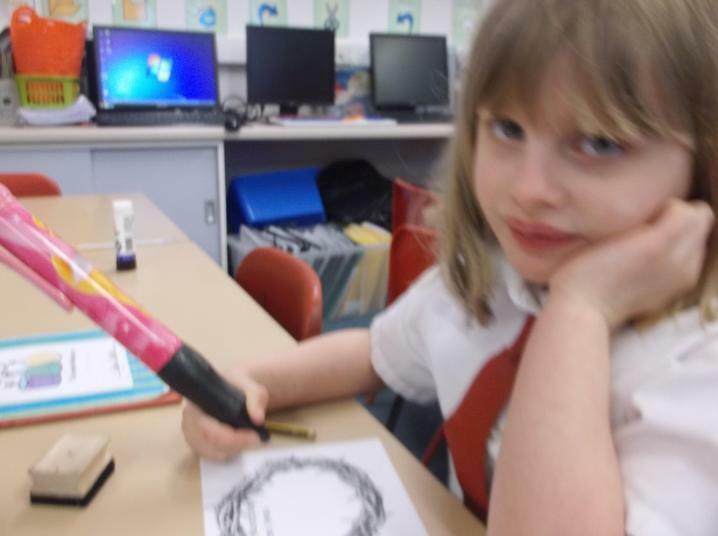 Identifying and Classifying Everyday Materials - we have been working hard investigating what objects are made from and their properties. 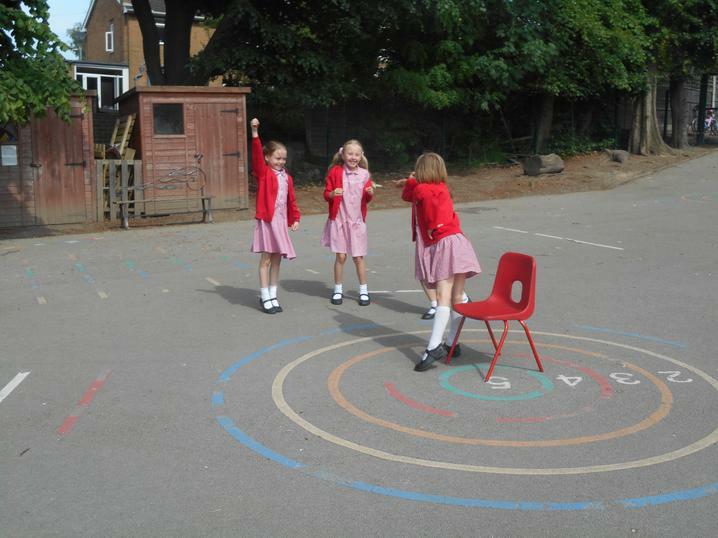 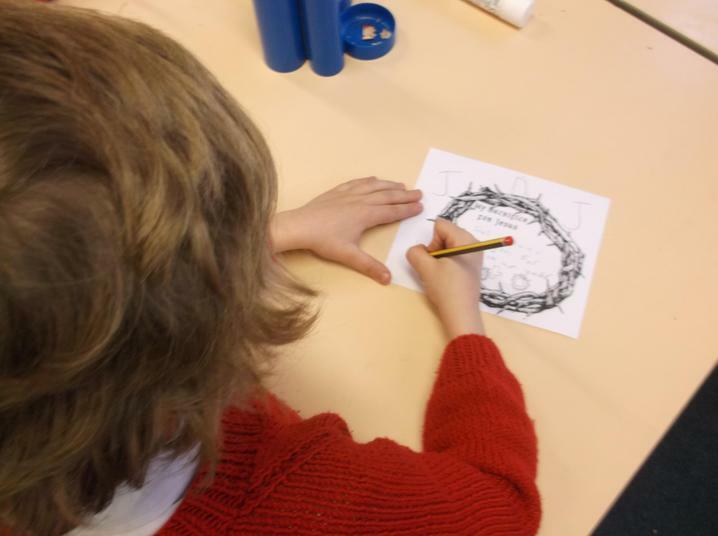 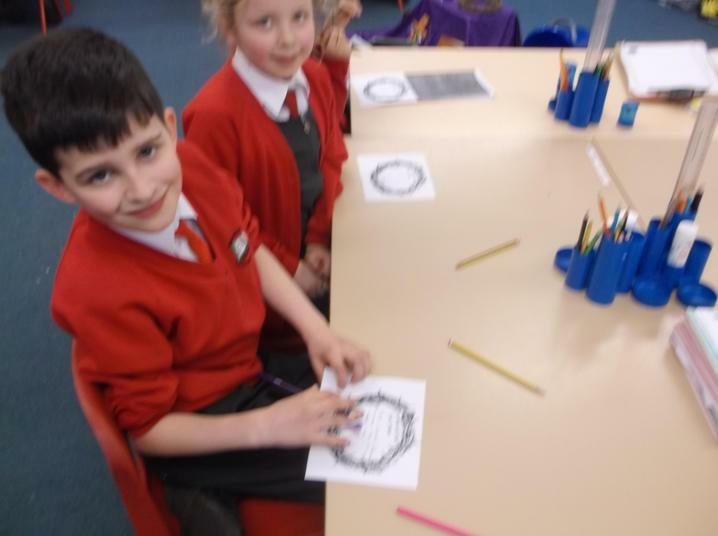 Telling the Time ICT Games We are learning to tell the time to the quarter hour - how good are you at telling the time?